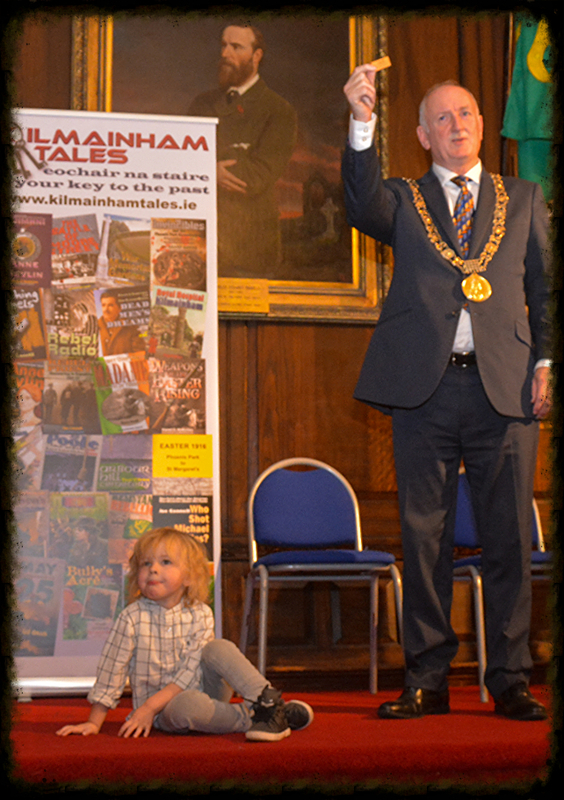 Over the next couple of years, Kilmainham Tales Teo. 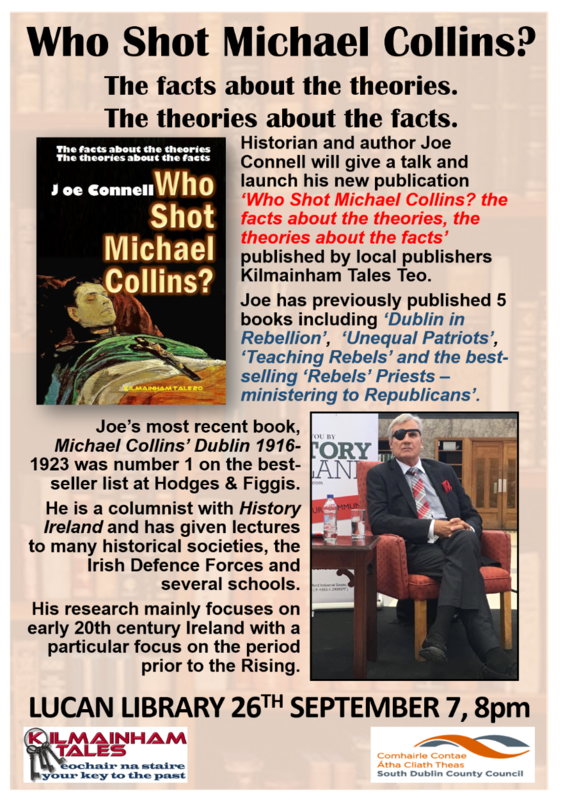 will publish a series of books on the dead of the Irish Civil War. 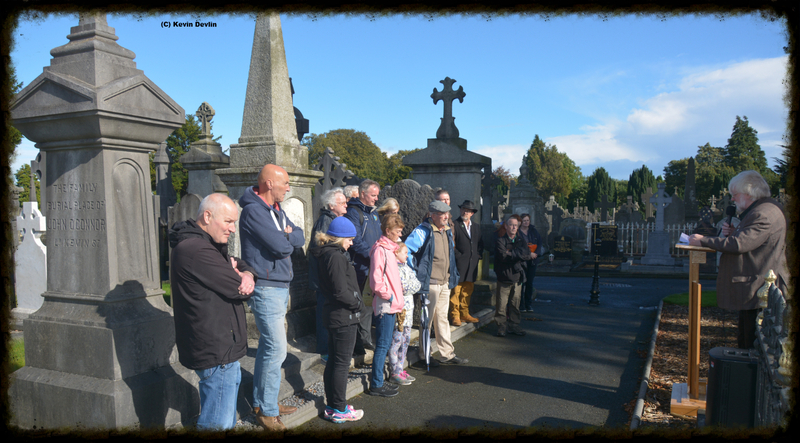 This major series will be compiled, researched and written by James Langton, who has already spent many years travelling the country visiting graves, research institutions and families. The first part of this three-part series - "The Forgotten Fallen" - is at an advanced stage of preparation and should be published within a couple of months. The volumes are 210mm x 210mm, a large size to allow two columns of text, and to display the many photographs to their best advantage. 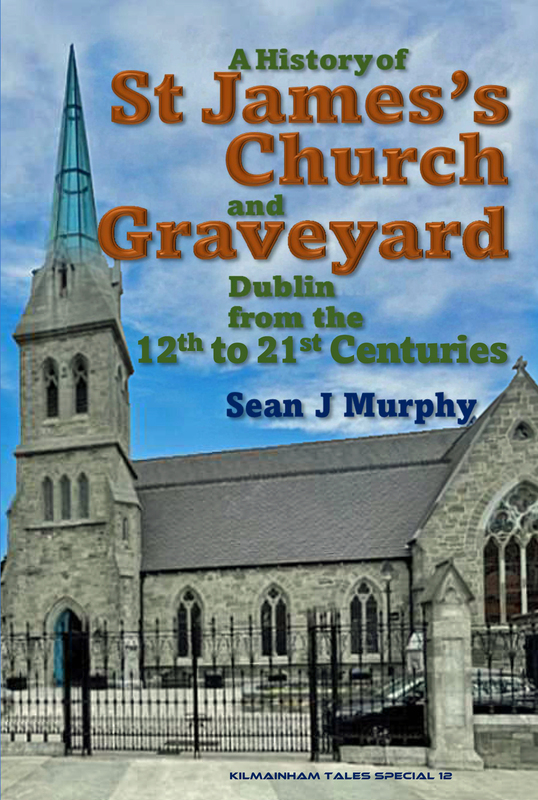 Printed in black and white throughout, the volumes have a full colour cover (inside and out). See sample pages below. 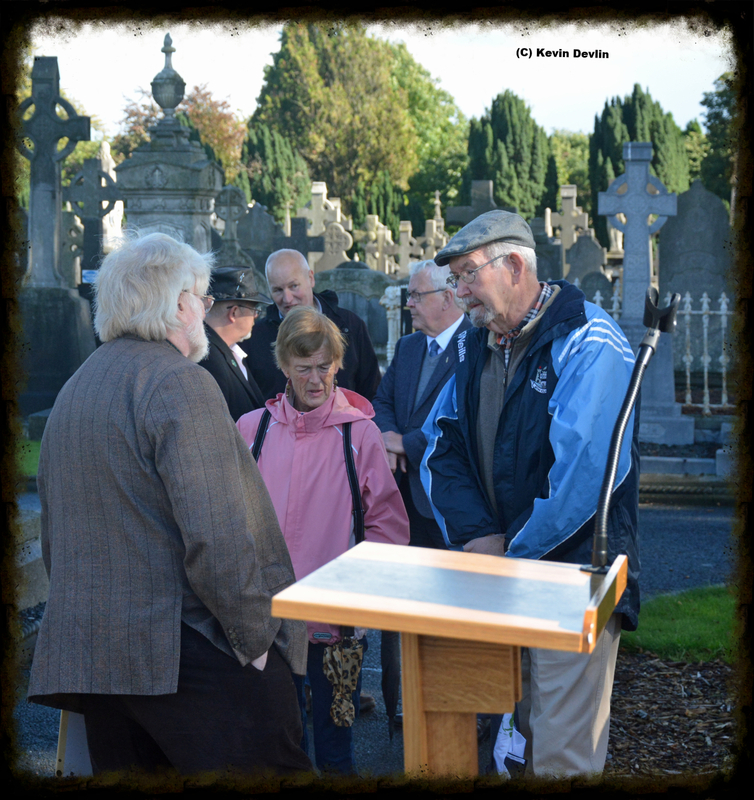 Volume 3 - Civilians killed during the Irish Civil War. 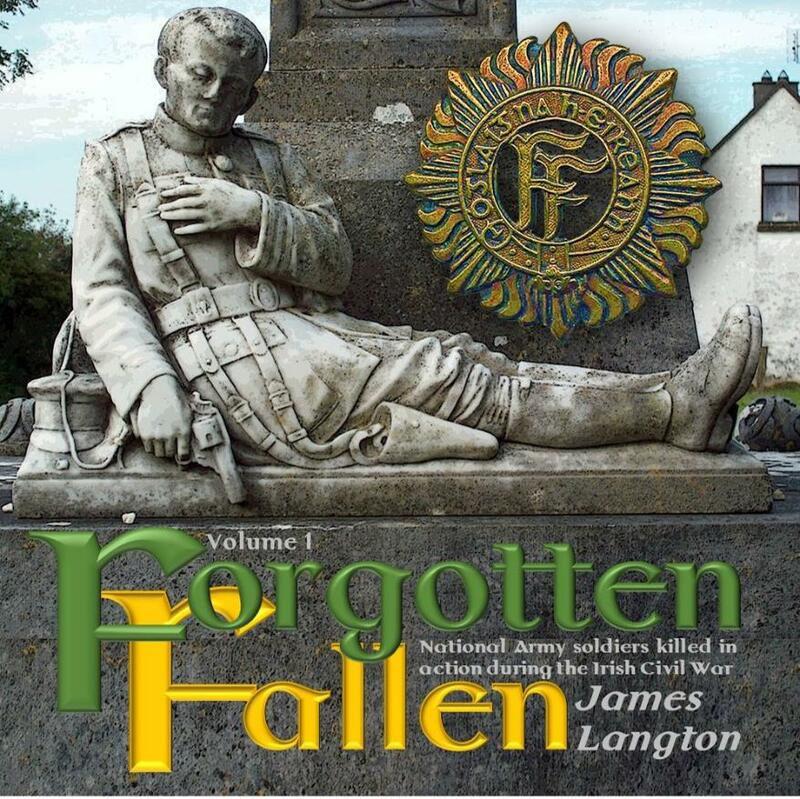 To be the first to get details, or if you wish to reserve a copy of Volume 1, or just register your interest and receive updates on planned launch, click here to send an e-mail to us with "Forgotten Fallen" in the subject line, and your full name and preferred email address in the main body. 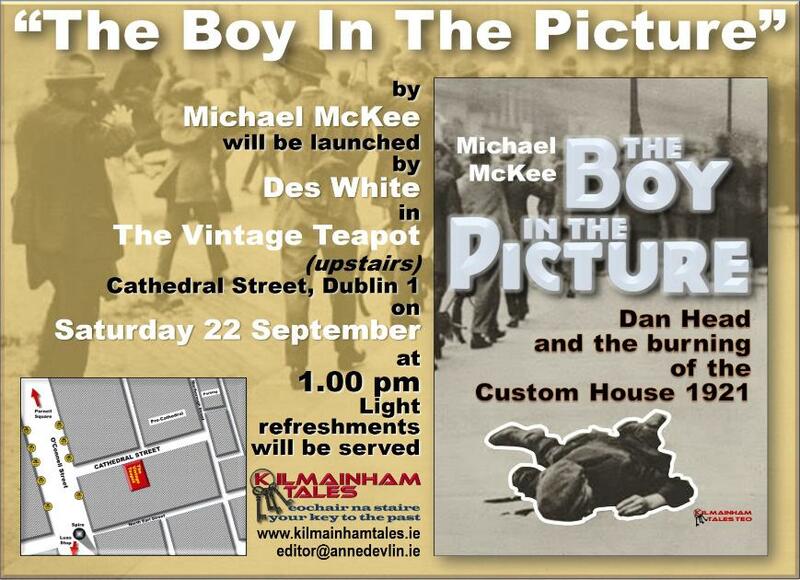 We will acknowledge and send you details as we get them before publication. Another year barely begun and another death to mourn. 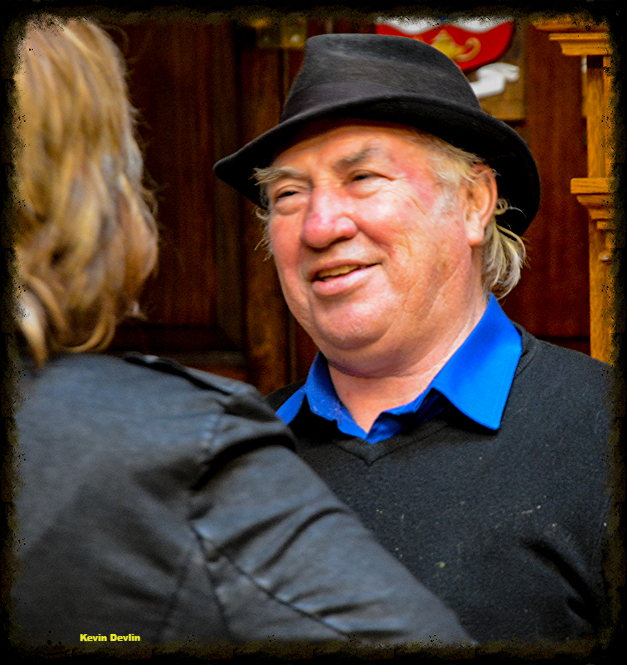 This time it is our dear friend Mick Gillis - one of nature's gentlemen, one of the finest and most generous men one could ever hope to meet. 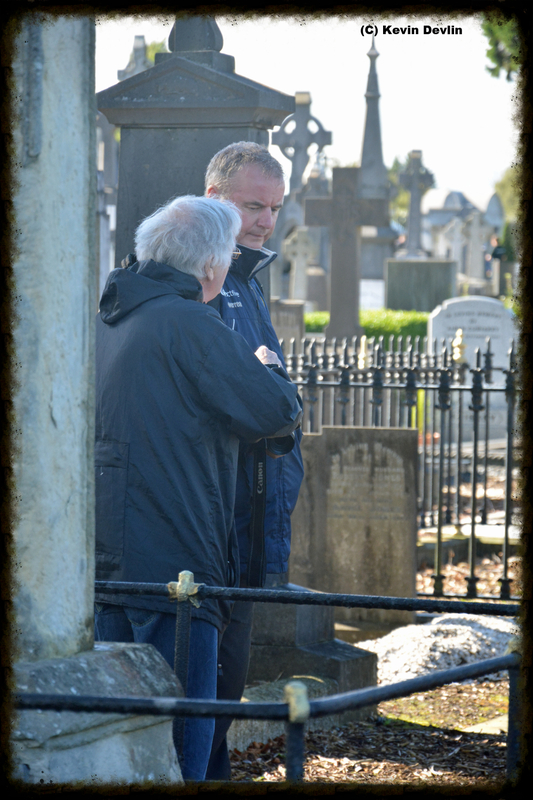 A gifted conversationalist, Mick could listen too. His advice was always sound, and he rarely had a bad word to say about anyone. 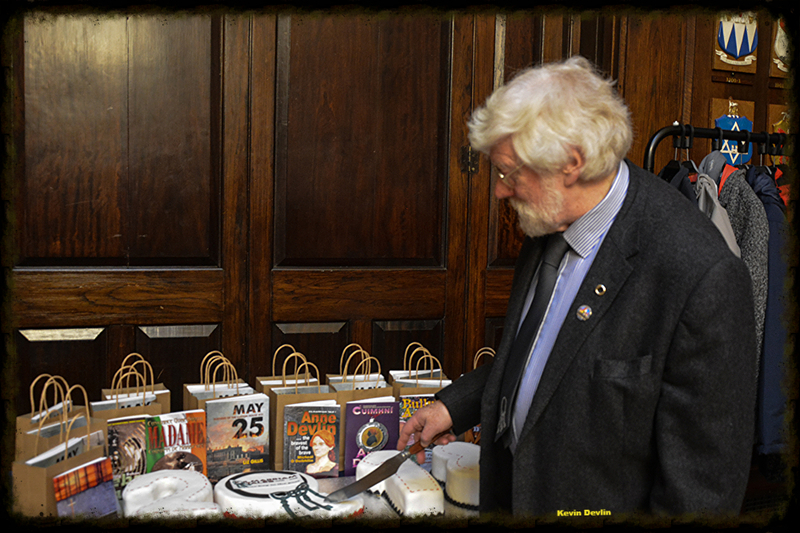 Mick hid his gifts well, however, always deferring to others as the 'experts'. But he was, in the truest sense, a fine historian himself, specialising in the American Civil War. his Knowledge of this conflict was encyclopedic, and his enthusiasm for the subject never faltered. 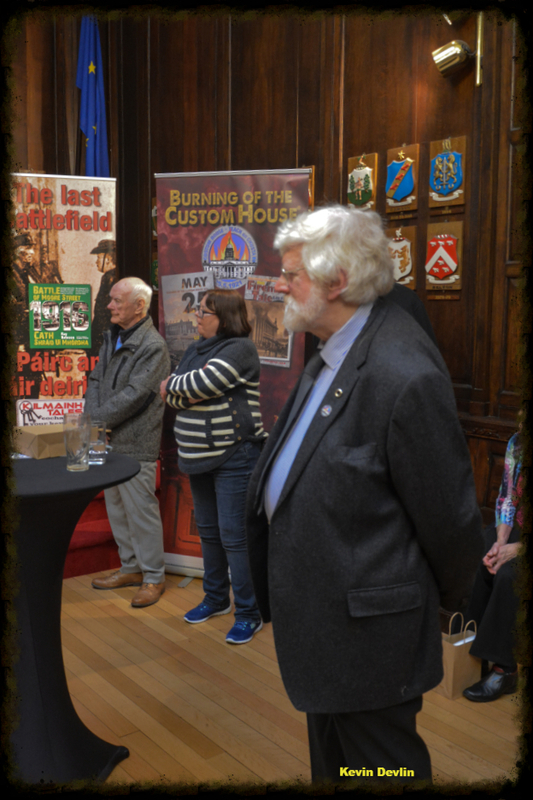 Mick worked for some time in the National Labour Museum and Archive, and became enthused about Labour history also, thus rounding out his knowledge of the early 20th century's revolutionary history. 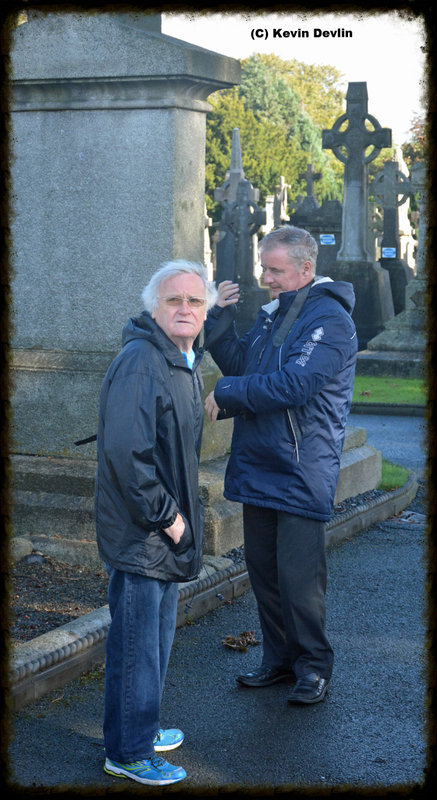 To sit with Mick for an hour (or many more!) 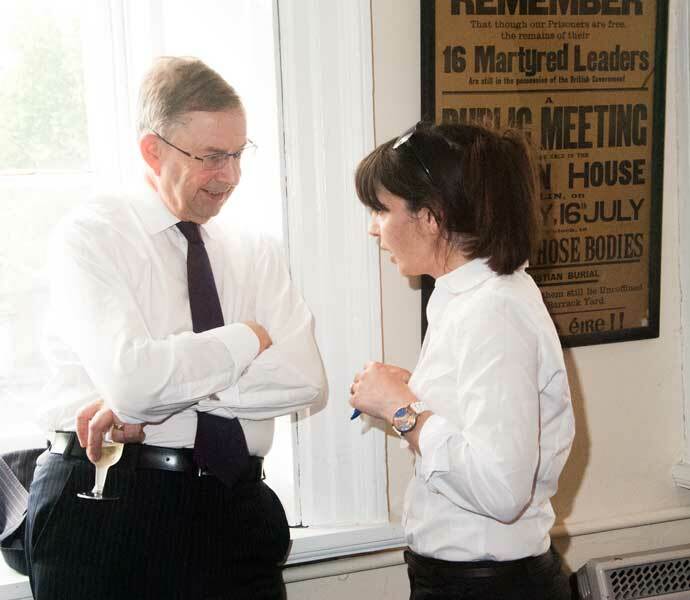 and discuss any of these facets of history was always a privilege and pleasure, and I shall miss these chats - I learned so much from this gentle man. 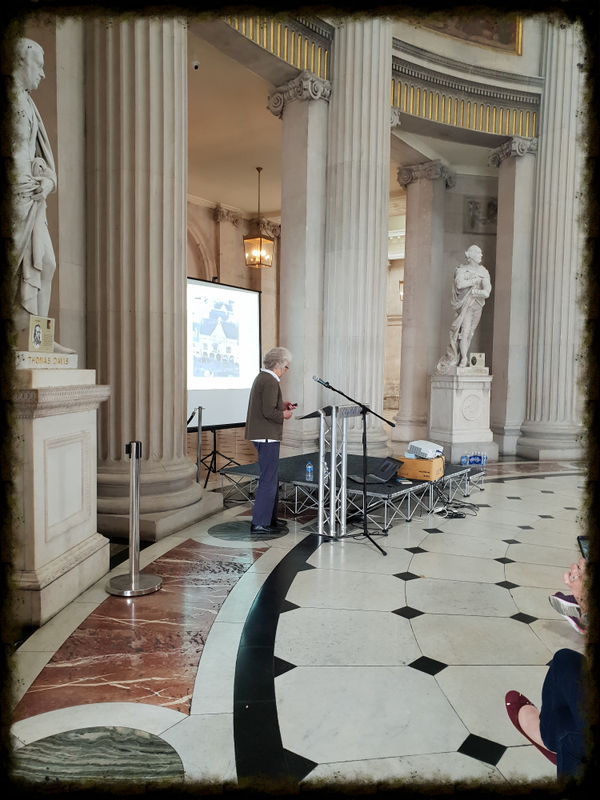 Mick shared his love of Ireland and her history with his children, in particular his daughter Liz - now a renowned historian in her own right. 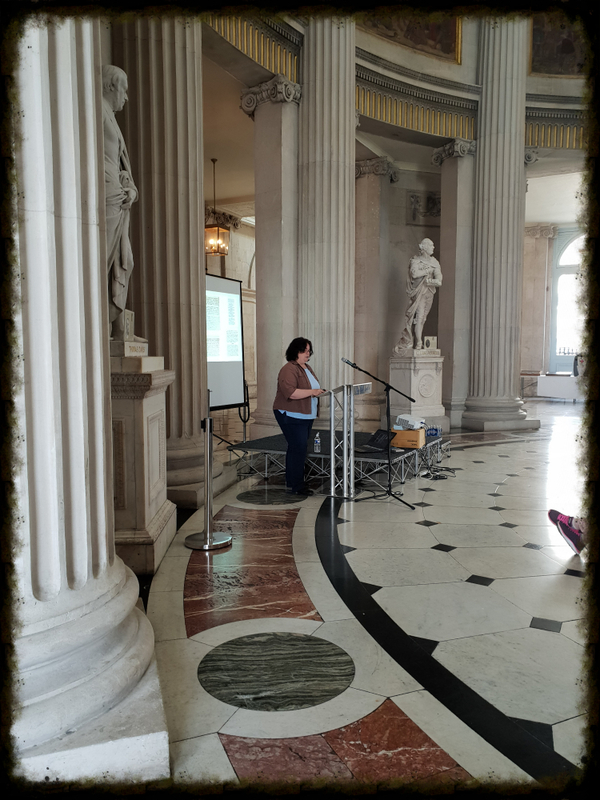 She is another member of the Kilmainham Tales stable of authors, having written "May 25 - battle of the Custom House 1921". 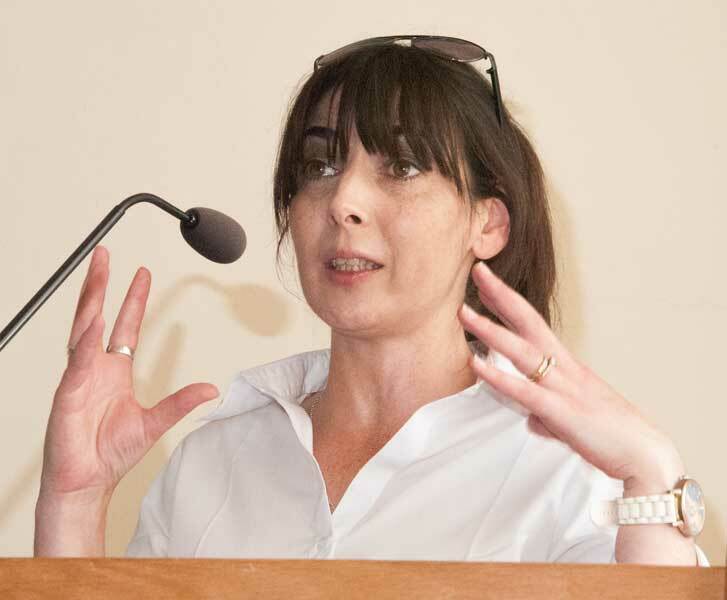 But she has written another 7 books for Mercier Press and is to the forefront of that generation of young historians which is bringing a breath of fresh air (and honesty) to the study of Irish history. 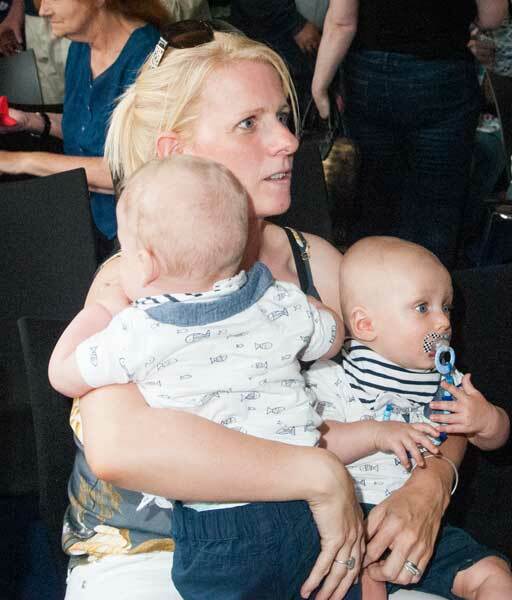 Mick was a wonderful father and mother to his children - I know, because they told me so. He raised them single-handedly, and made sure they were raised correctly. He imbued much of himself in them, yet did not stifle them, and allowed them each to be original, creative and capable of thinking critically for themselves. 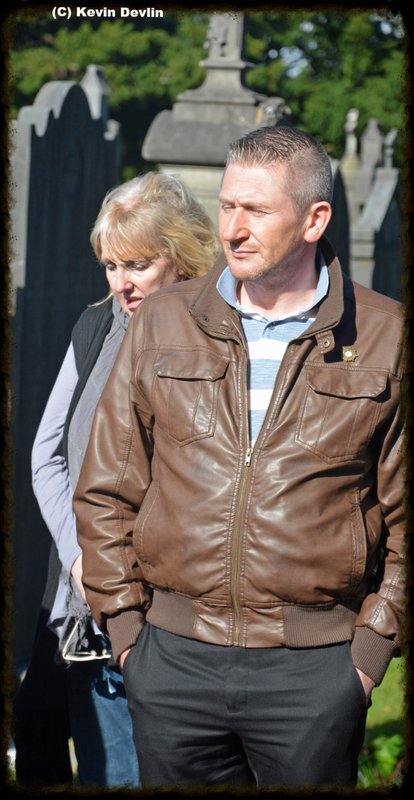 Mick had every reason to be proud of what he achieved in his all too short life. He deserved more time, but alas it was not to be. 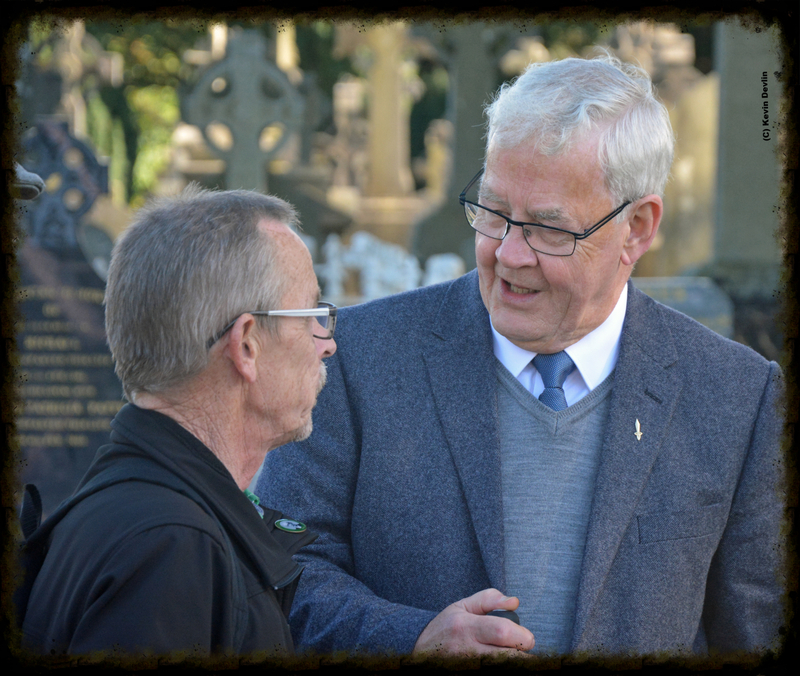 His funeral was a testament to the man, his influence ... and his legacy. 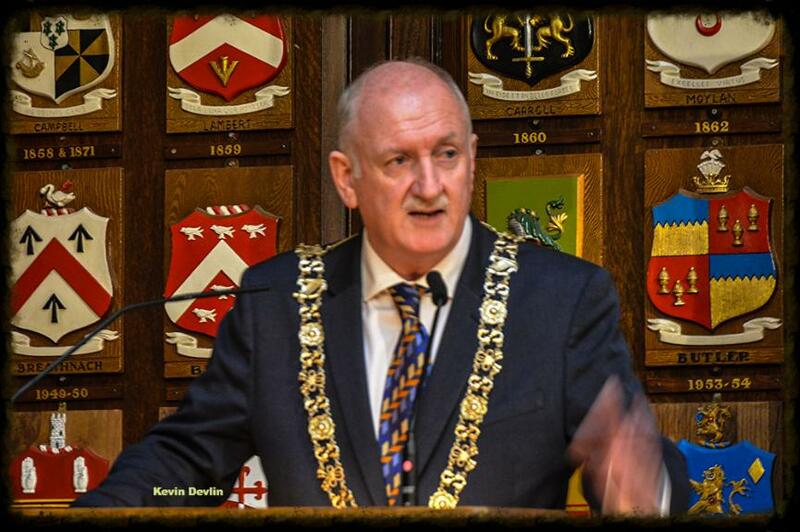 Even Lord Mayor of Dublin, Cllr. 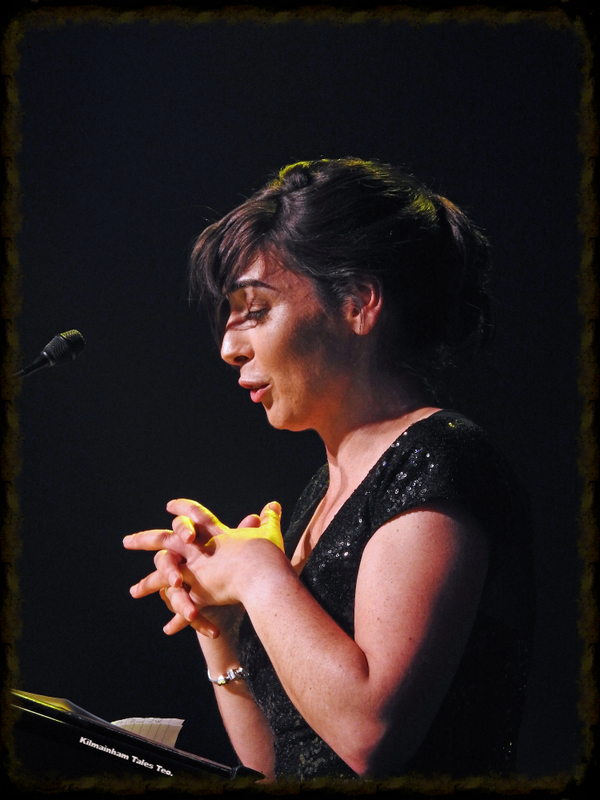 Nial Ring was present, something, perhaps, Mick would have died to see :-). 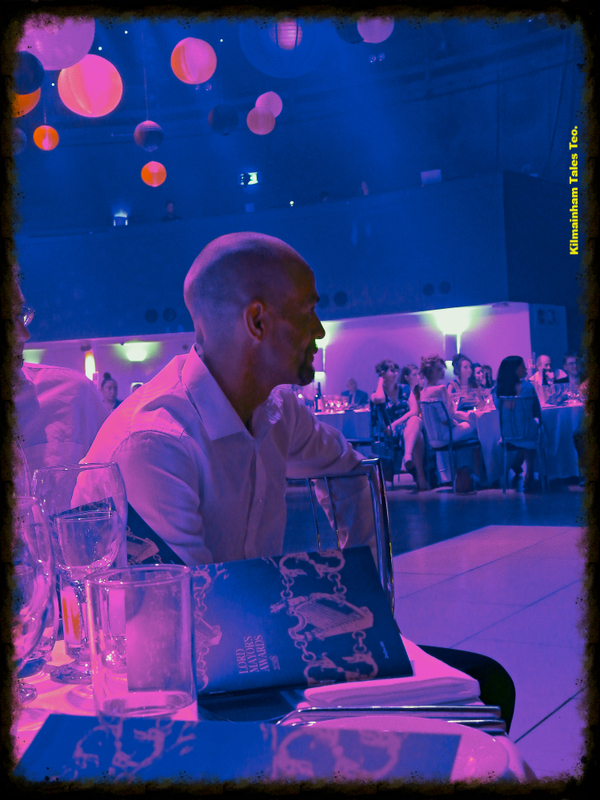 I am proud that Mick allowed me to share even a little of his time. 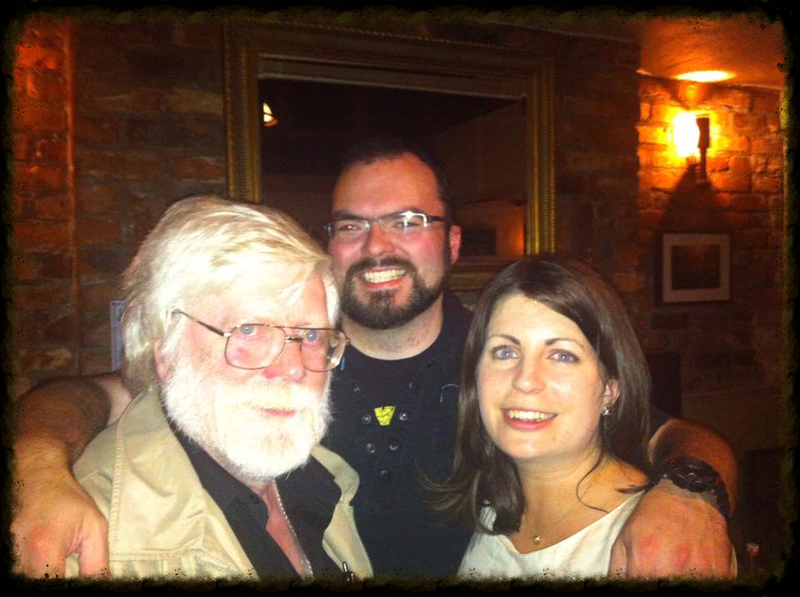 That time was wonderful, and is now a chest of treasured memories. 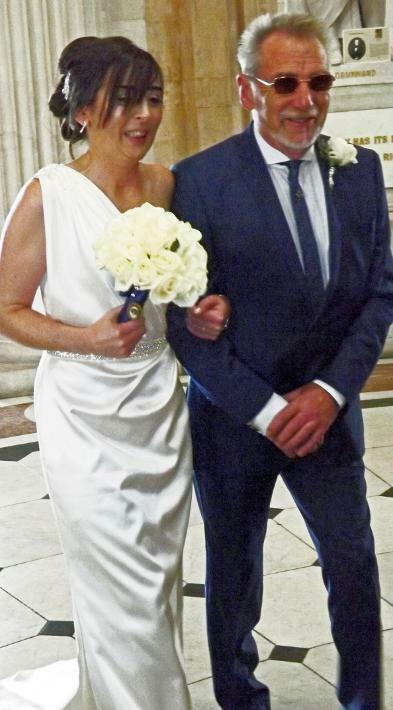 (Above) Mick GIllis with his daughter Liz, author and historian, on her wedding day. 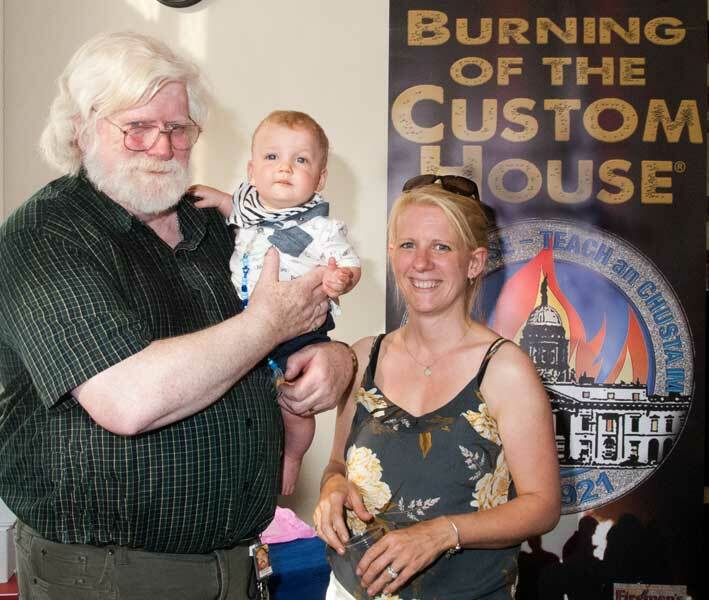 None of this makes it any easier to say goodbye, and our thoughts, prayers and sympathies are with his children, who knew Mick better than any of us, and whose loss is incalculable. 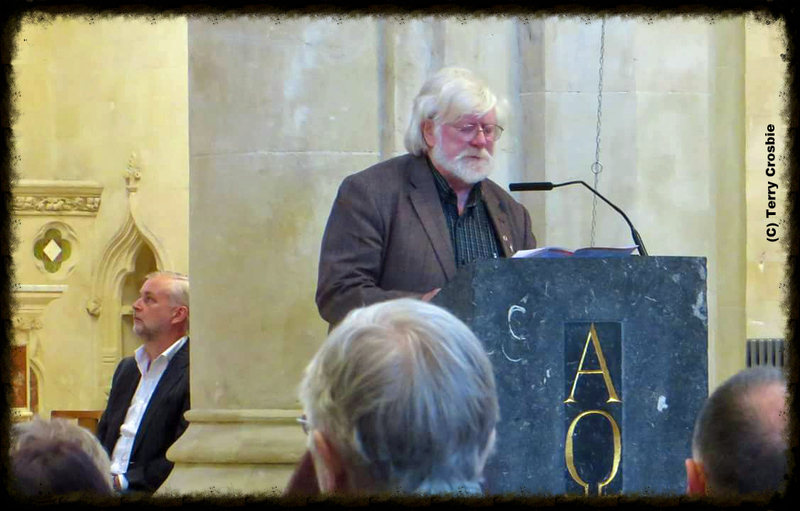 Ar dheis Dé go mbeidh sé go síorraí, i measc na naoimh agus na laochra. 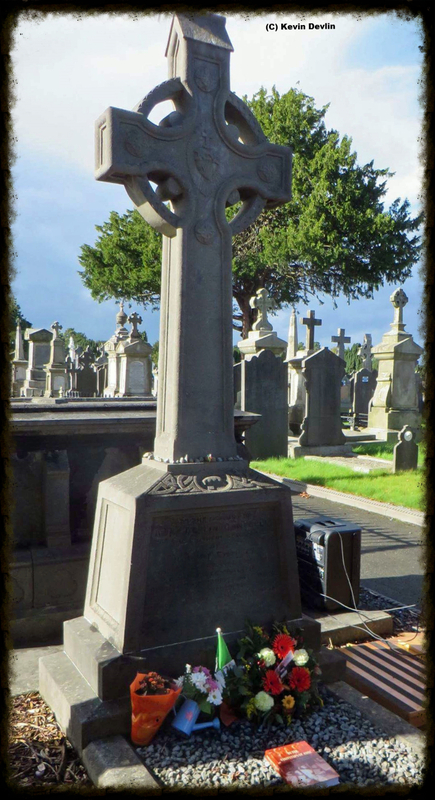 (Above) The grave in Glasnevin from which Anne Devlin Campbell was illegally removed in 1852. 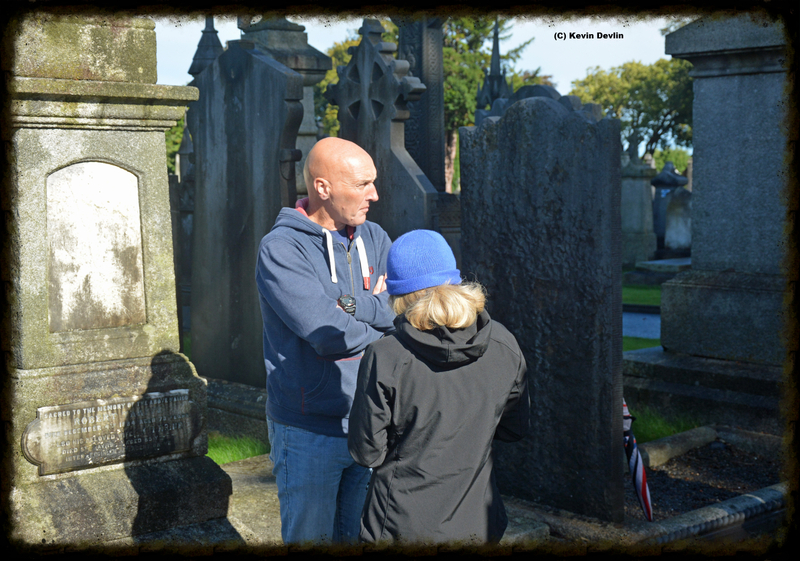 Her husband, William Campbell, remains buried alone there. 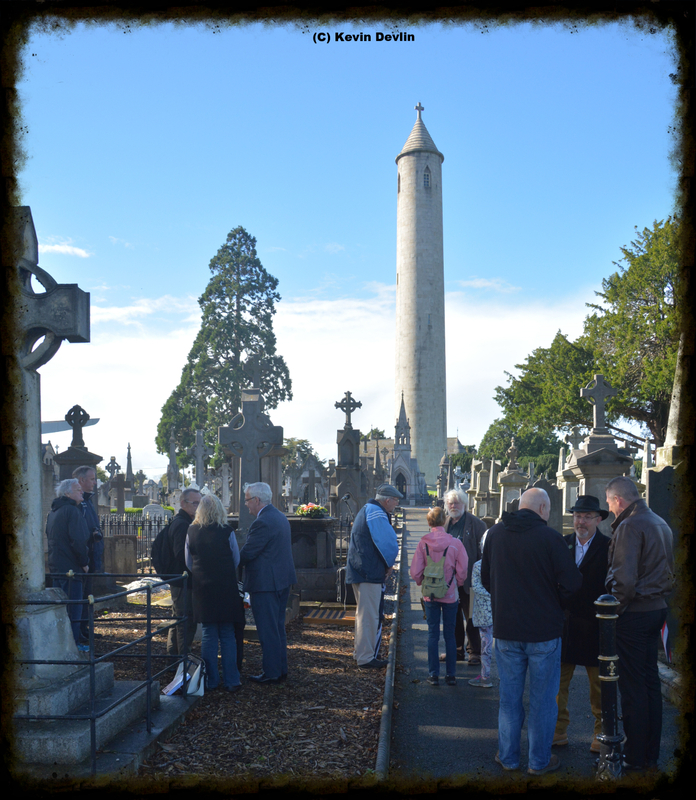 On March 11, 1852, the noted United Irishmen's biographer and historian R.R. 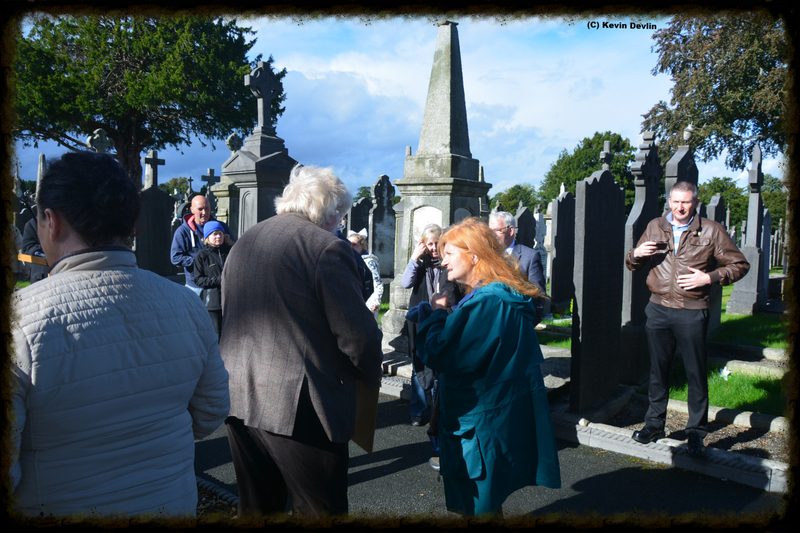 Madden entered Glasnevin Cemetery and, with some of her relations and friends, dug up the body of Anne Devlin and moved it to another gravesite nearby. 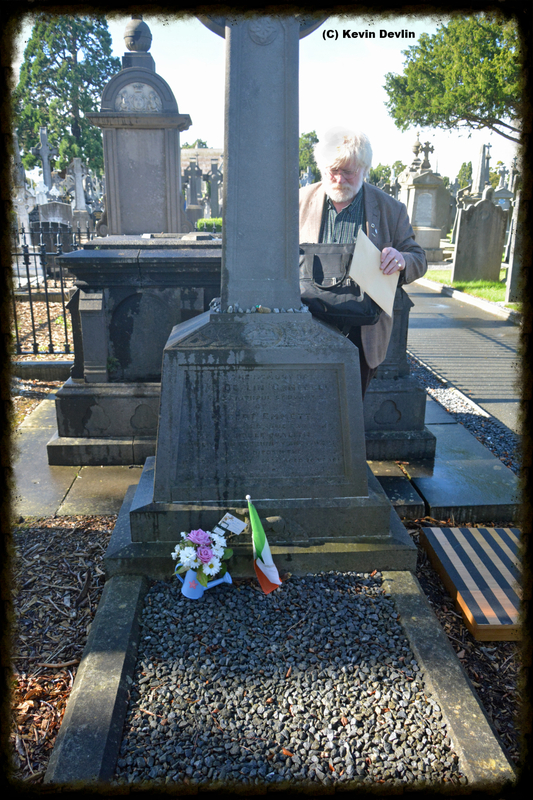 They did this to remove Anne from a pauper’s grave, believing that such an Irish patriot should not be in one. 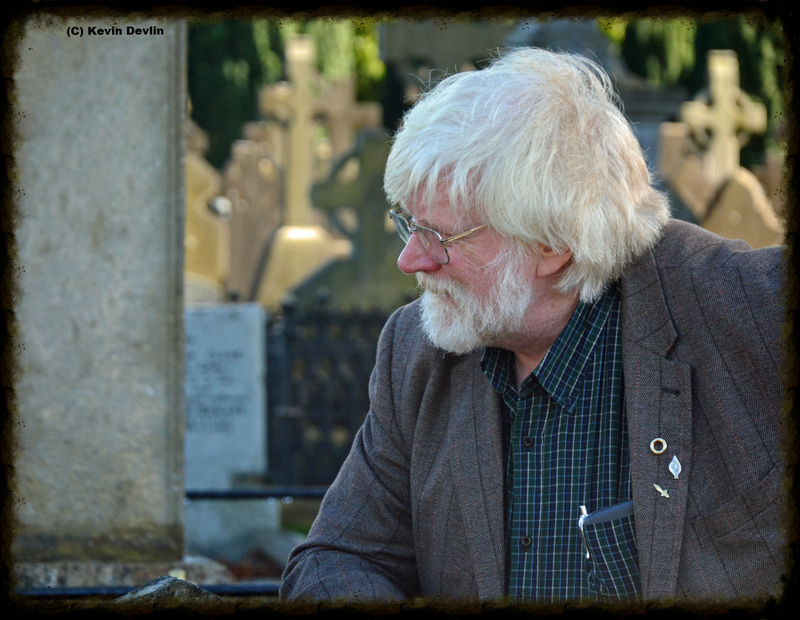 Unfortunately, through a misunderstanding, they left Anne’s husband William Campbell behind in the original grave. 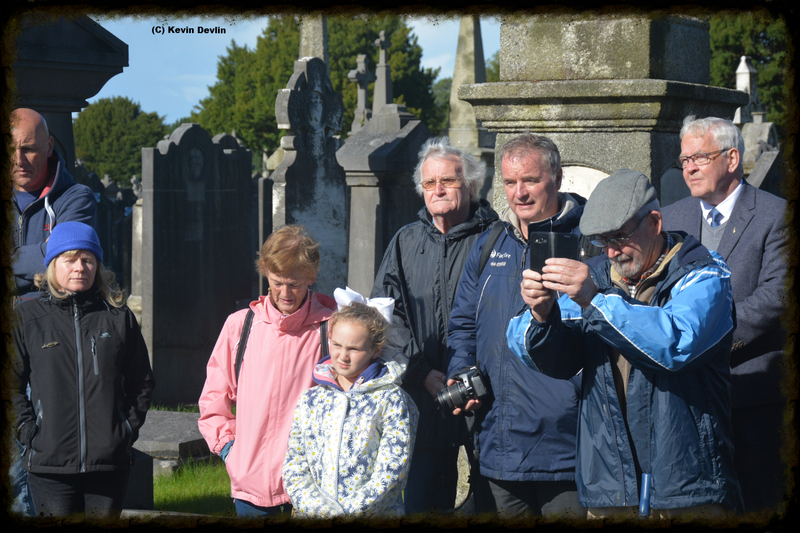 The couple had been buried in the same grave because it was not a pauper’s grave – Anne had purchased it in 1846 on the death of her beloved husband so that they both be interred there, for she believed – and proclaimed – that friends should be buried together. 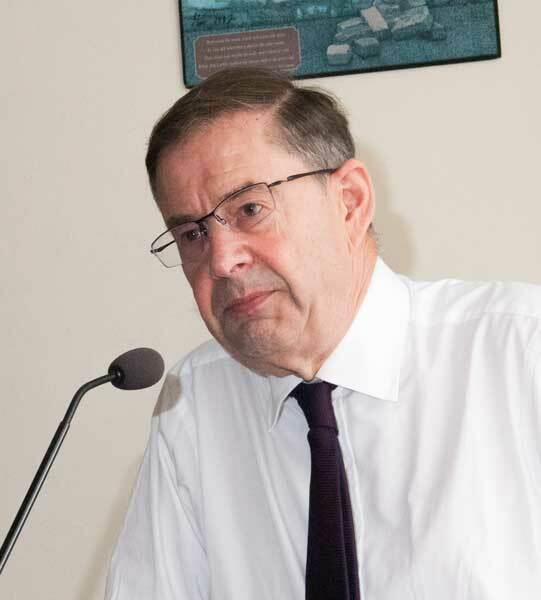 This act by Dr. Madden and others, while carried out with the best of intentions, was a crime on a couple of levels. Second, it was a crime against one of our greatest heroes, that her ultimate wish – to be buried with her husband – should be frustrated. For 15 years we have sought to have this crime redressed. 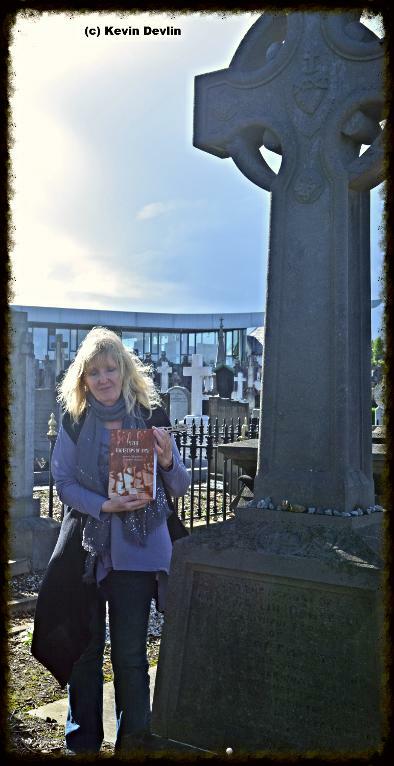 As William lies in a forgotten, unmarked grave (see photo), we have desired that he be moved to Anne’s one which is marked by a magnificent Celtic cross provided by the board of Glasnevin cemetery. 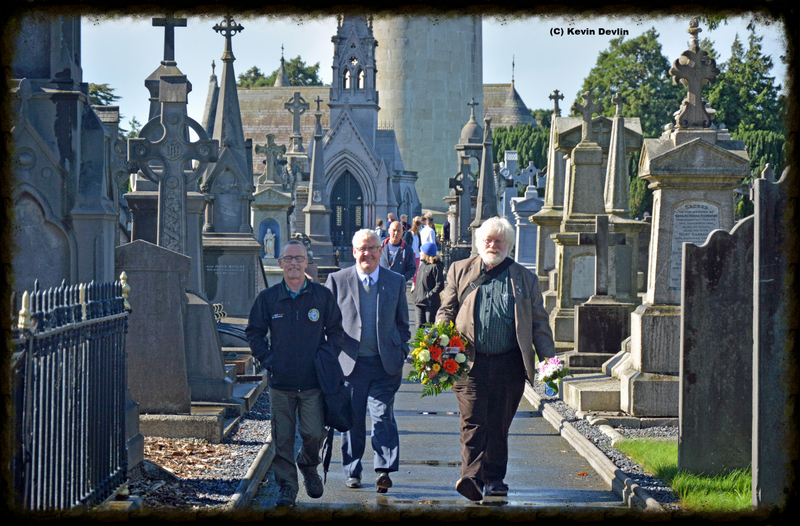 There were many obstacles to overcome but finally, today, our request for exhumation and re-interment orders for William are with Minister Eoghan Murphy, TD, Minister for Local Government in the Department of Culture, Heritage and the Gaeltacht. 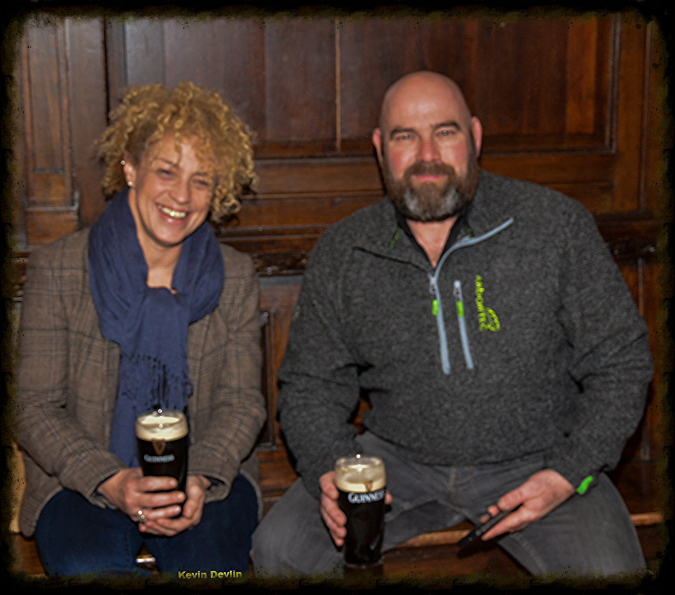 We are hopeful of a swift approval so that this wrong can be righted eventually and that Anne can finally rest at ease with her friend, partner, lover and supporter of 35 years as she intended. Further updates will be given as we get them. And so the dance begins. 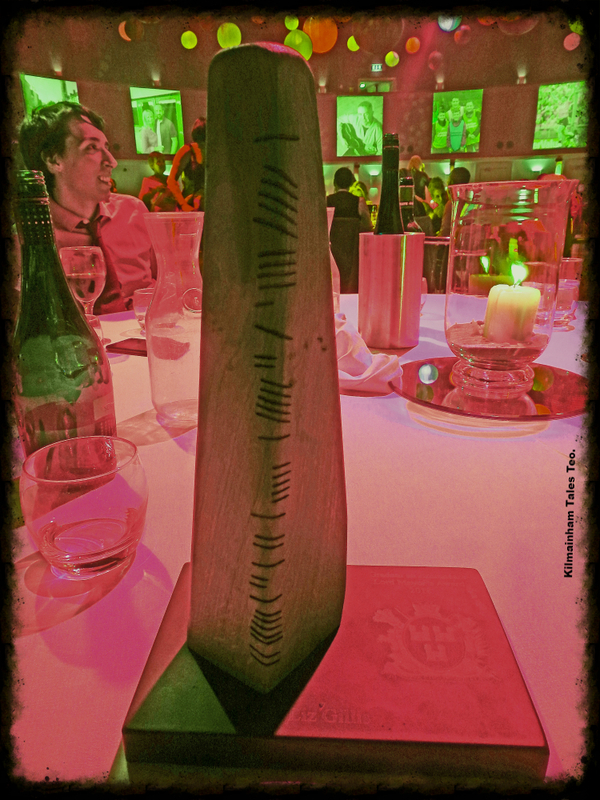 Having been passed to the Dept. 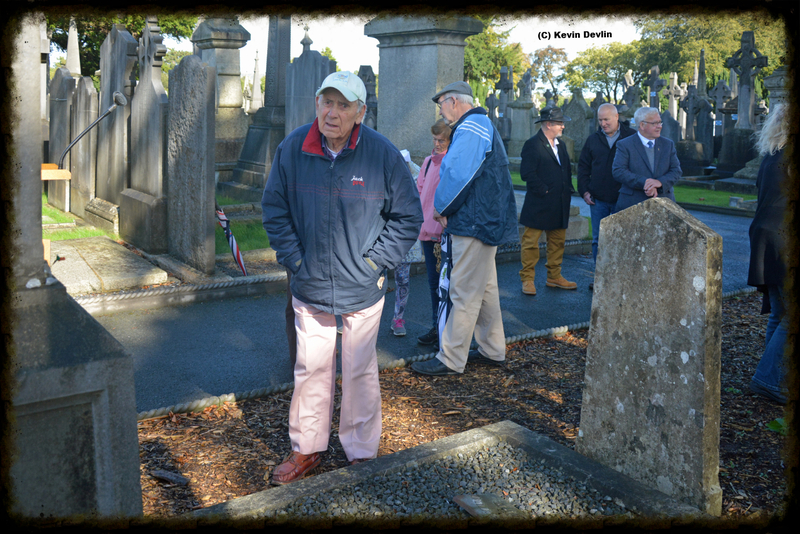 of Local Government from the Department of Justice, we have just now been informed that "graves have been rejigged" and are now the remit of Michael Ring, the Minister for Rural & Community Development! Presumably the paperwork will get there in due course and someone will act. 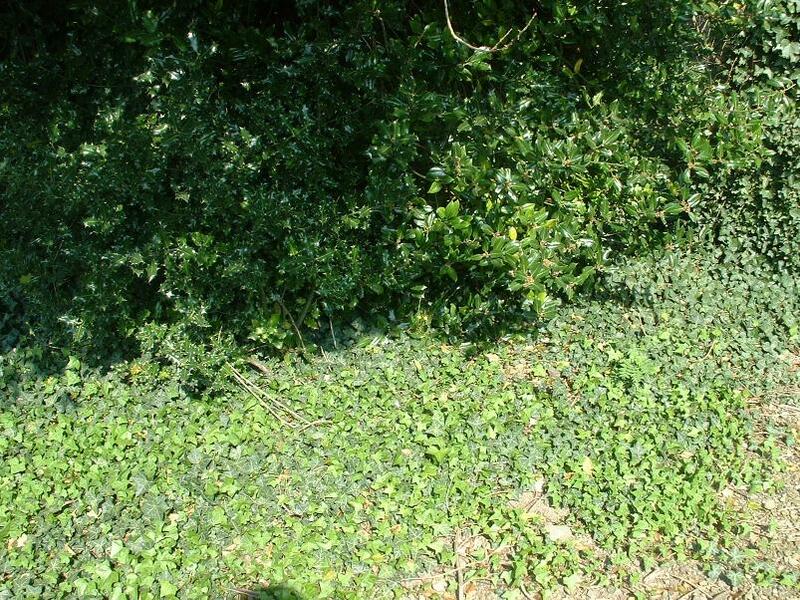 his wife of 35 years had purchased so that she could later be buried with him. And do it was that 5 years later, on September 19, 1851, Anne Devlin Campbell was buried as she wished. But not for long. 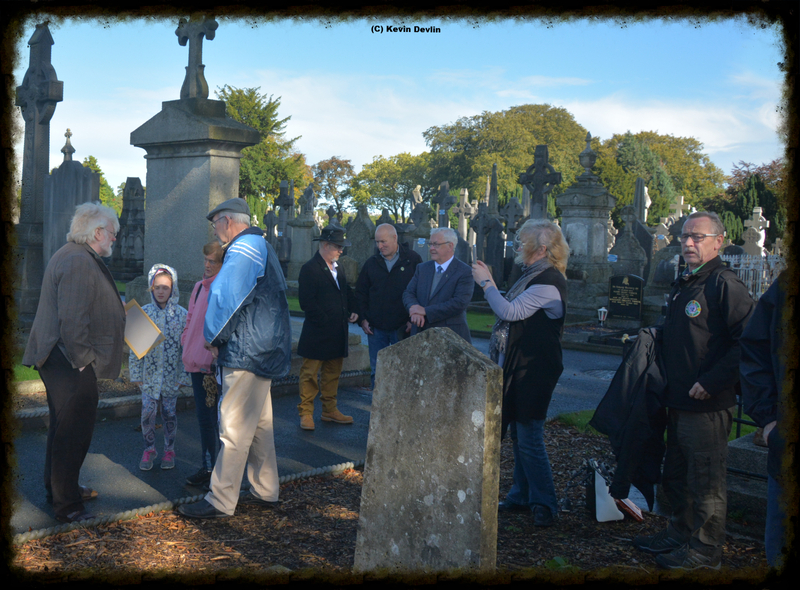 Just 6 months later, 11 March, 1852, the noted historian of the United Irishmen RR Madden illegally moved Anne from her grave to another. This crime against one of our greatest heroes has never been redressed. 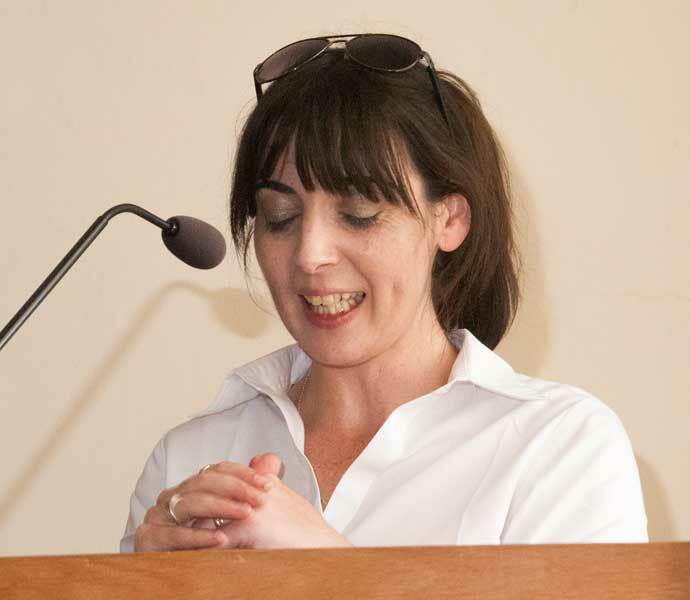 After 15 years research and campaigning for this to happen, we are finally hopeful that Anne's husband William will be moved to her current grave. 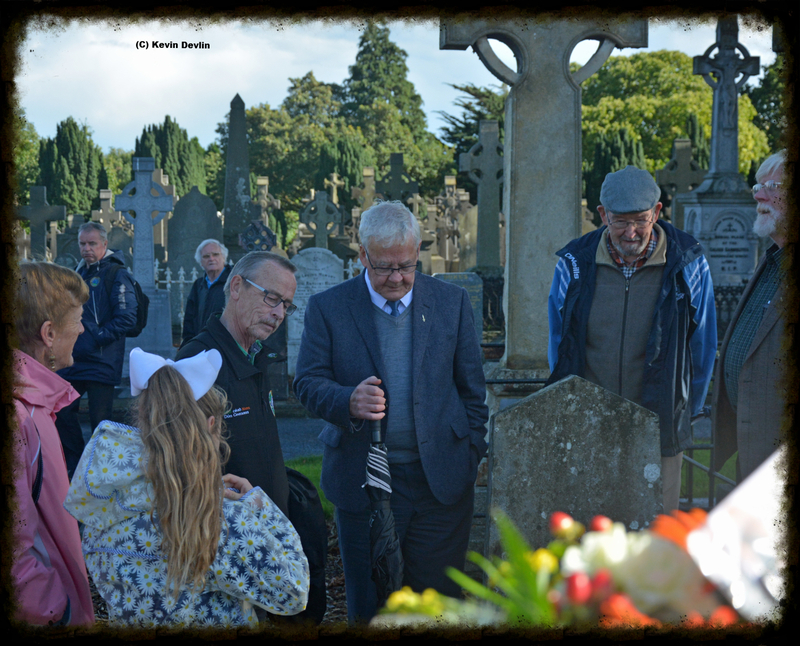 Our application to this affect, we are told, has been moved to the office of Michael Ring, Minister for Rural and Community Development - the minister currently responsible for graves we are told. The application is "is with the officials" of this department, we were told in response to a query today. 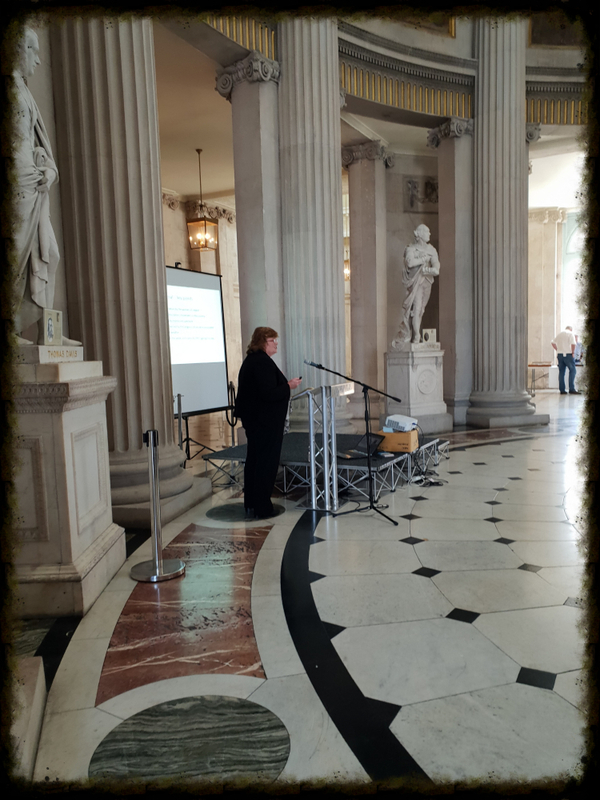 We have been told that this application is not within the remit of Minister Ring's department, but must be sent to Fingal County Council direct. This, despite a formal application form being available separate to the County Council one. It appears that the left hand does not know what the right hand is doing in these matters. 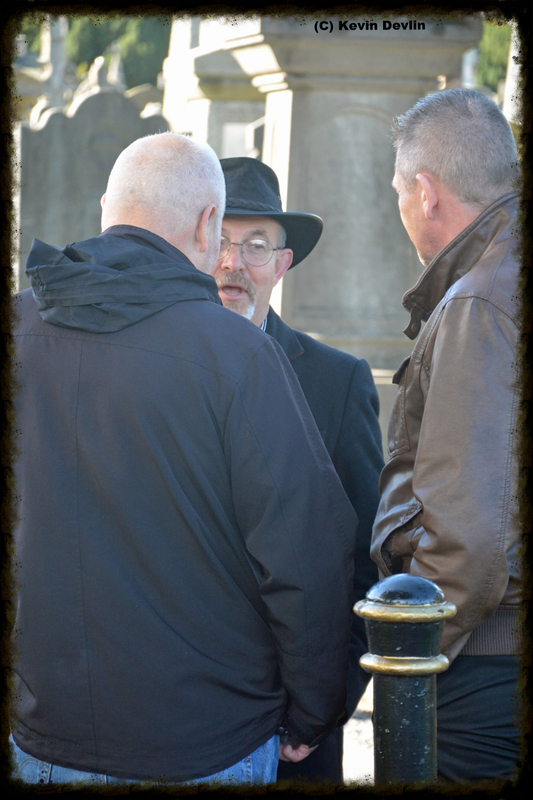 However, undeterred, we will now approach Fingal County Council and seek an order there. This is far too important a matter to let drop at any hurdle and we will persist until we achieve our aim, no matter how long it takes. 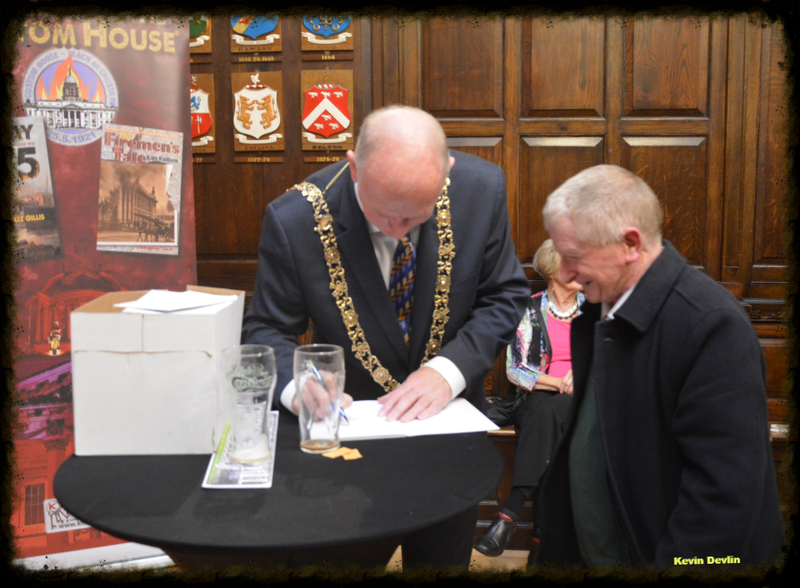 Our revised application was sent to Fingal County Council on Friday 24 Jan. by registered post. We await a speedy reply, and will keep you all posted. Well, hopefully this is the last time we have to do this. 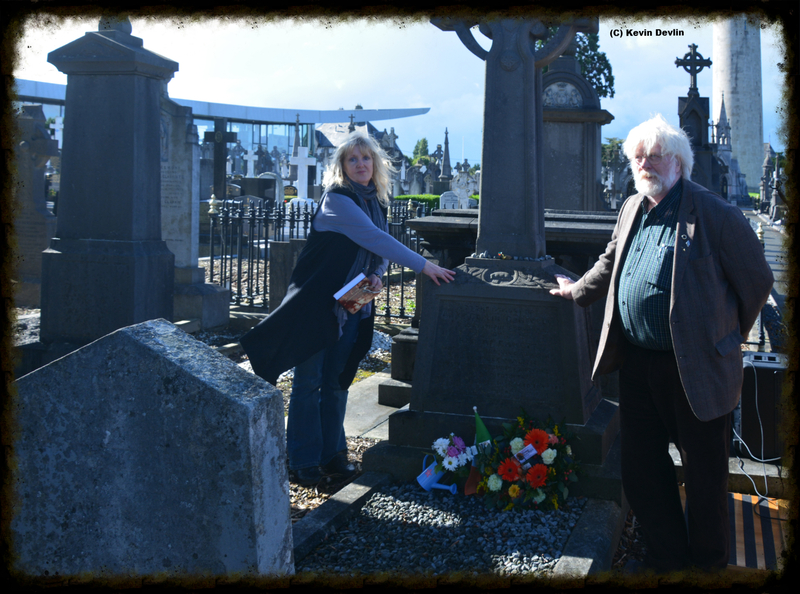 We have now submitted an application for a licence to exhume William Campbell from his grave in Glasnevin and to re-inter him in the grave of his wife, Anne Devlin. 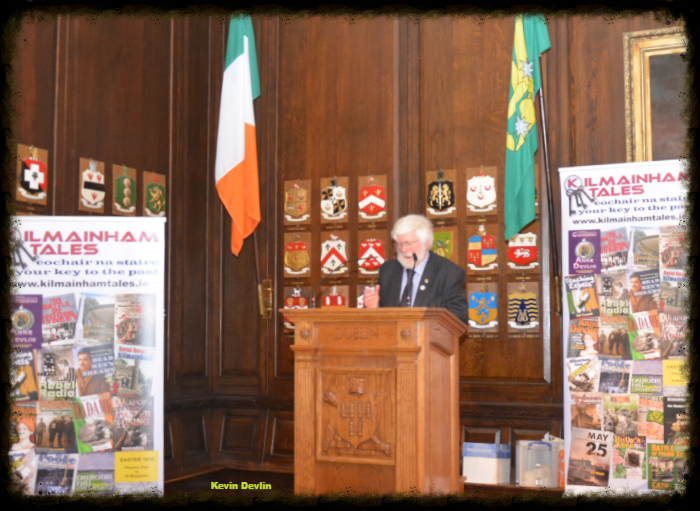 This time, following the instructions we received from Fingal County Council, we have spplied to Dublin City Council. 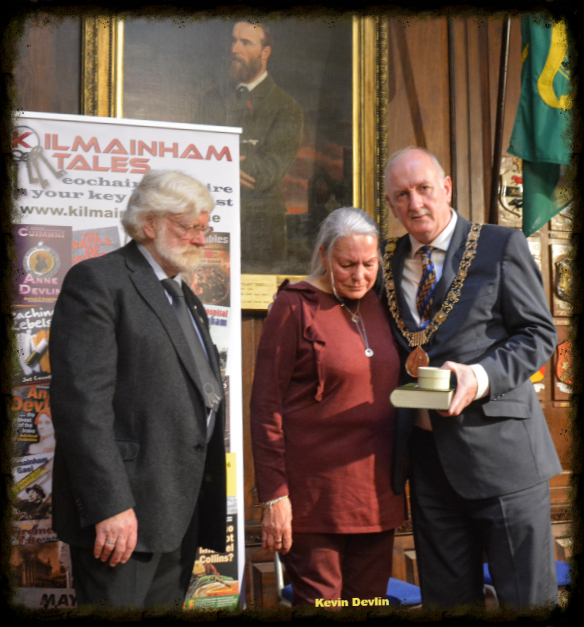 William lived in the area under this Council for all 72 yearsof his life, while Anne lived there from her release from Kilmainham Gaol in 1806 to her death in a miserable slum in 1851 - 46 years. 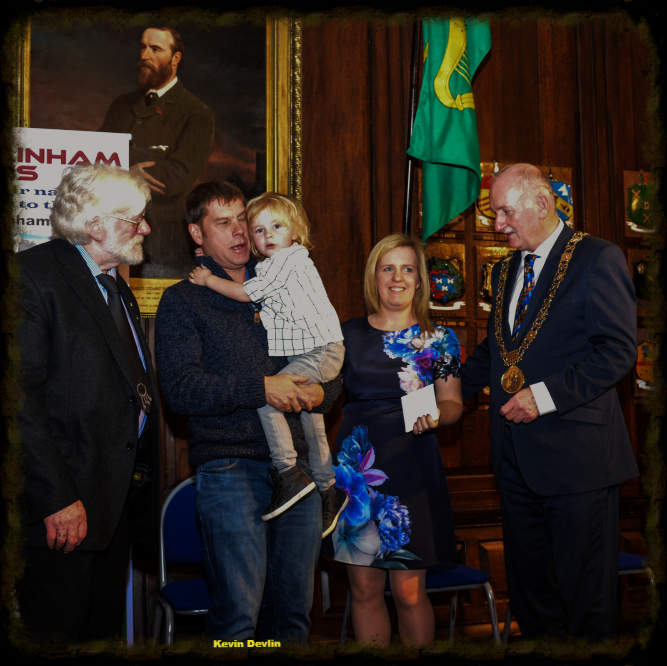 They couple were married in St. Catherine's Church, Meath Street on April 17 1811, and we hope to have them finally reunited by the 208th anniversary of this this year. 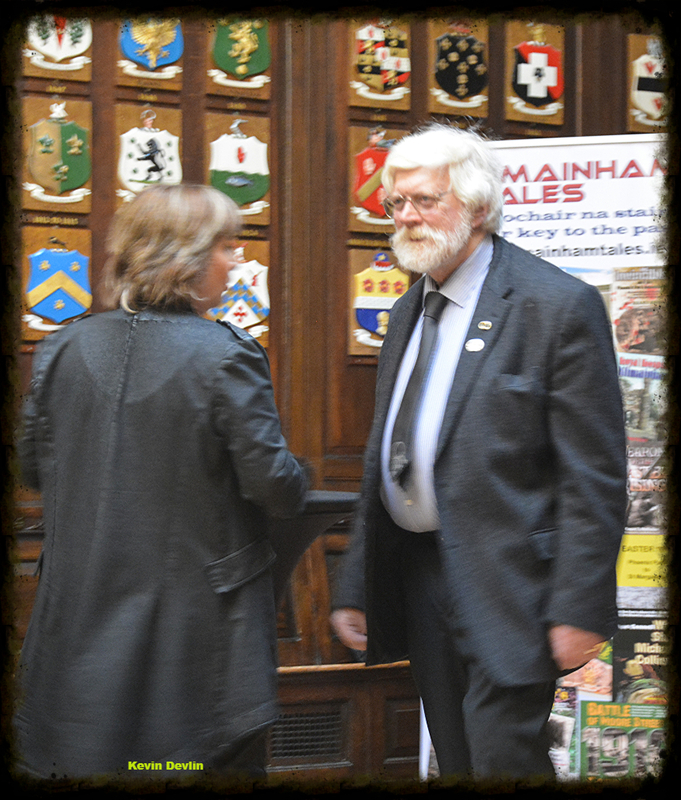 We have the support of Lord Mayor Cllr. 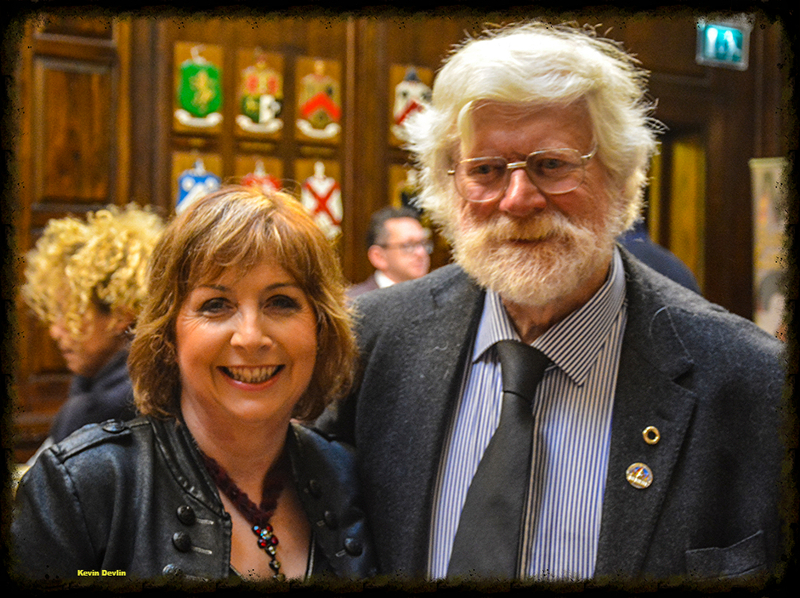 Nial Ring and oyher members of the Council, so hopefully this time we succeed. 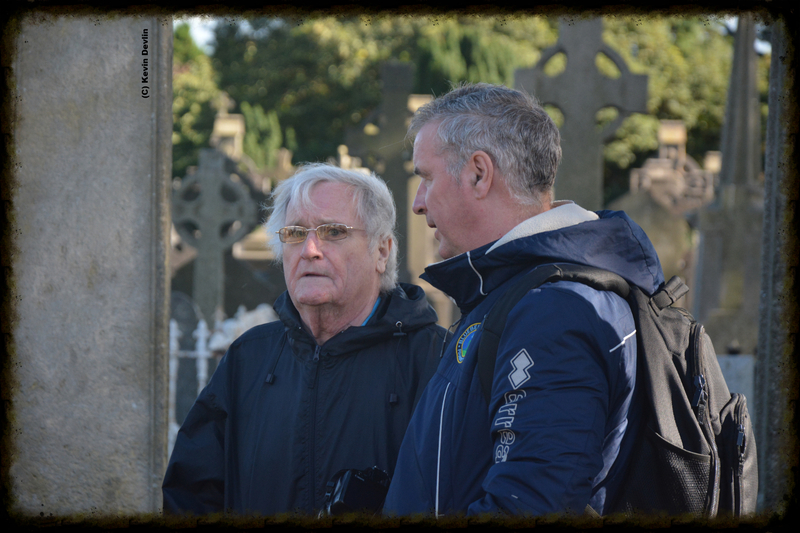 If a licence is issued, we then need to apply to Glasnevin Cemetery for final approval from there. 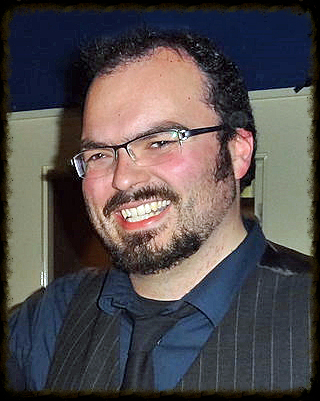 Le cúnamh Dé beidh an masla a tugadh do duine den'ár laochra ba mhó réitithe go luath. Why not add your comments/thoughts etc. on that page? 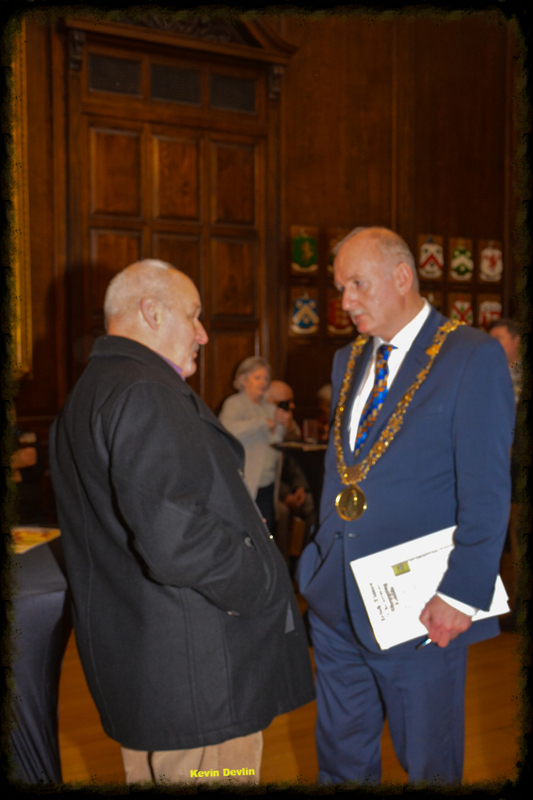 What an incredible day it was in Dublin's Mansion House on Saturday November 24 2018, when our First Citizen of Dublin, Lord Mayor Cllr. 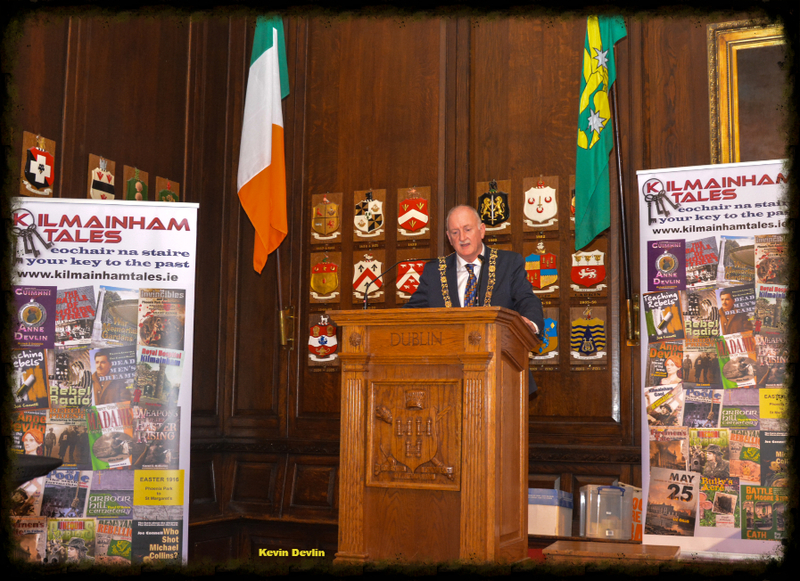 Nial Ring, hosted a special reception in the Mansion House to mark our 10th anniversary. 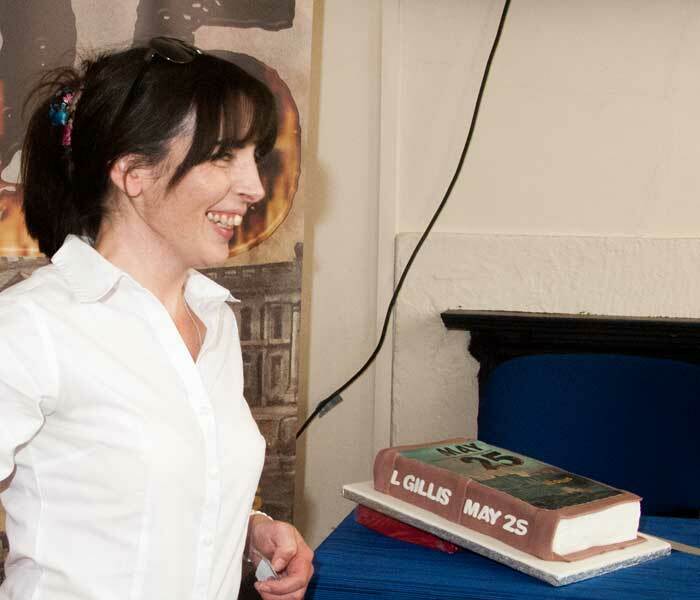 Music was provided by our Secretary, newly-wed Jenny Ní Dhoibhilín-Marten, and the scrumptious cake was designed and provided by talented Aisling Ní Dhoibhilín. 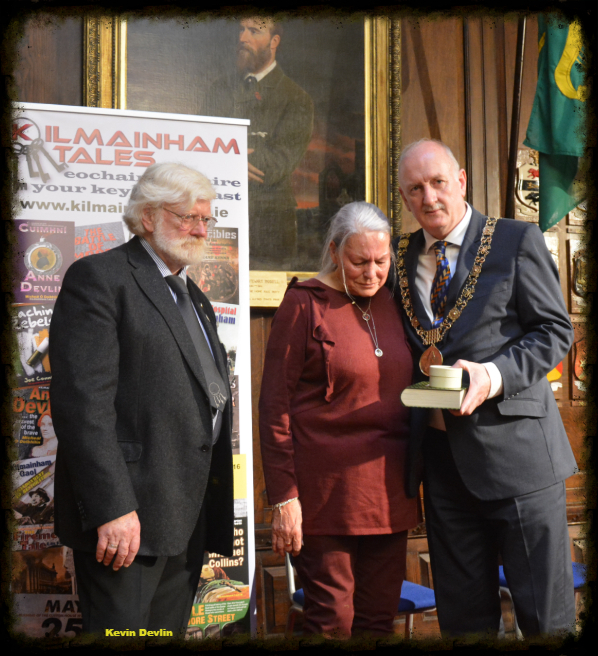 Surrounded by friends and family it was a fantastic way to celebrate our first decade, and a wonderful affirmation of the value of what we seek to do in Kilmainham Tales Teo. 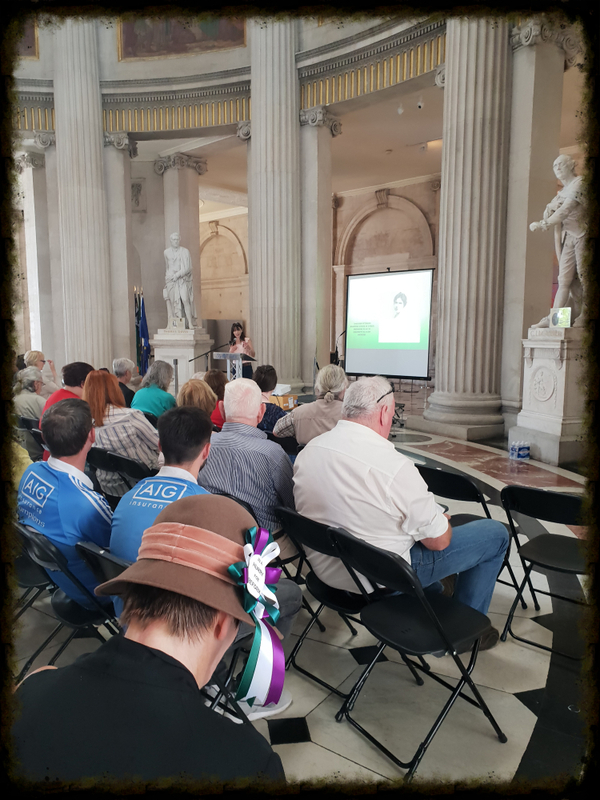 Equally humbling was the special tribute paid to us by the 1916 Relatives Association, represented by Clare Cowley, who also acted as MC on the day, and whose words of praise for us and what we do left us stunned and blushing! 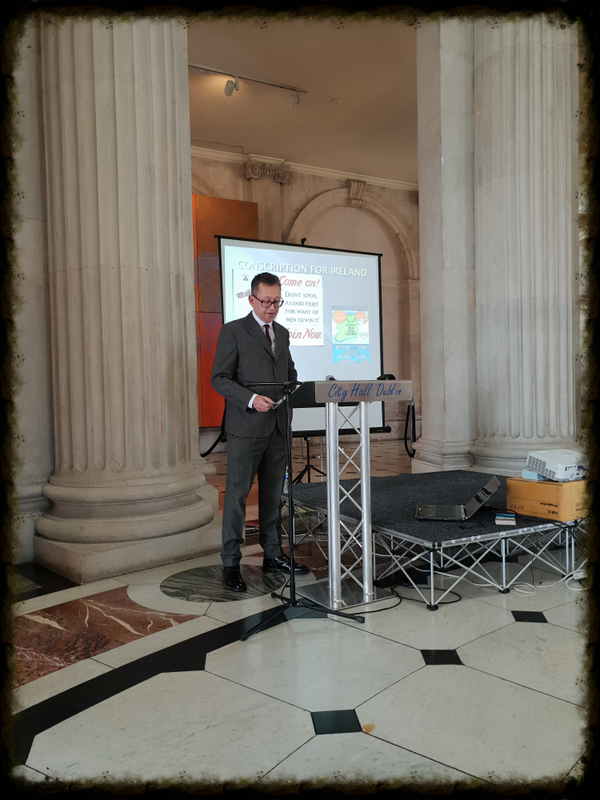 Several of our authors were there, and it was wonderful to be able to pay tribute to them - as our MD, Mícheál Ó Doibhilín said in his remarks, authors are the lifeblood of publishers - publishers cannot exist without authors, but authors can exist without publishers. 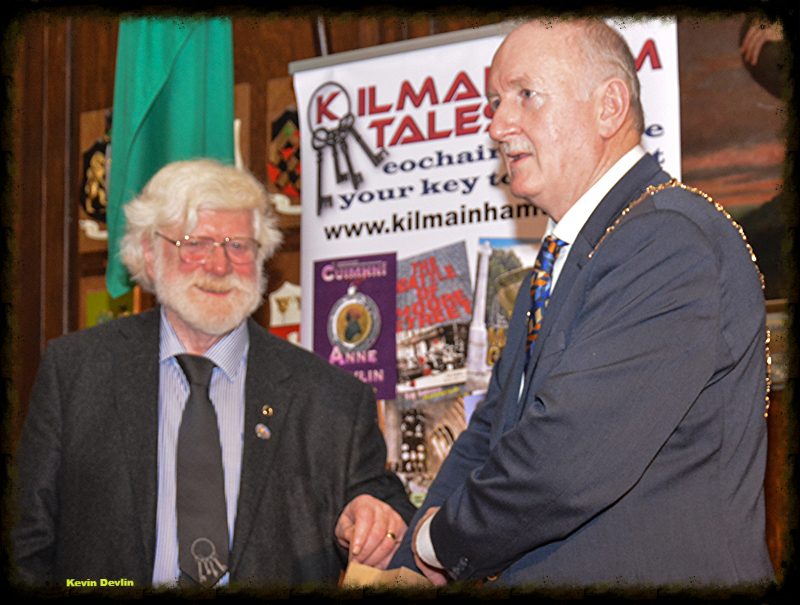 But the biggest tribute must go to our wonderful Lord Mayor, a true friend of history who has backed what we do so assiduously. 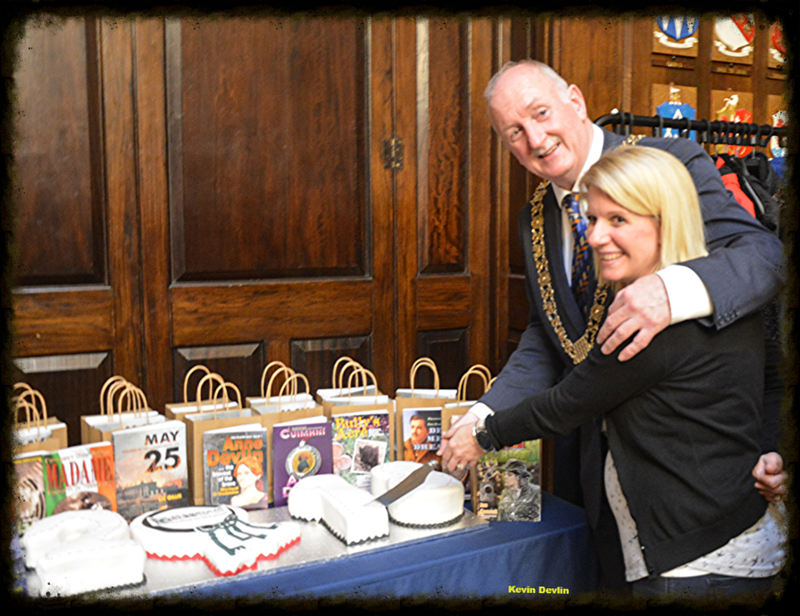 On the day we presented the Lord Mayor with a complete set of our publications, with the Original Series in the first of our new series binders, and also held a draw for another complete set. 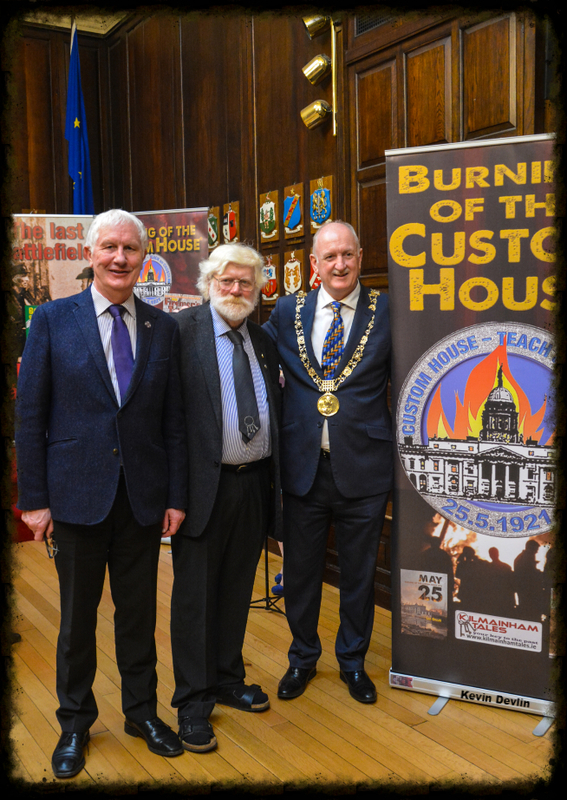 In addition, everyone who attended was given a complimentary copy of "May 25 - burning of the Custom House 1921". 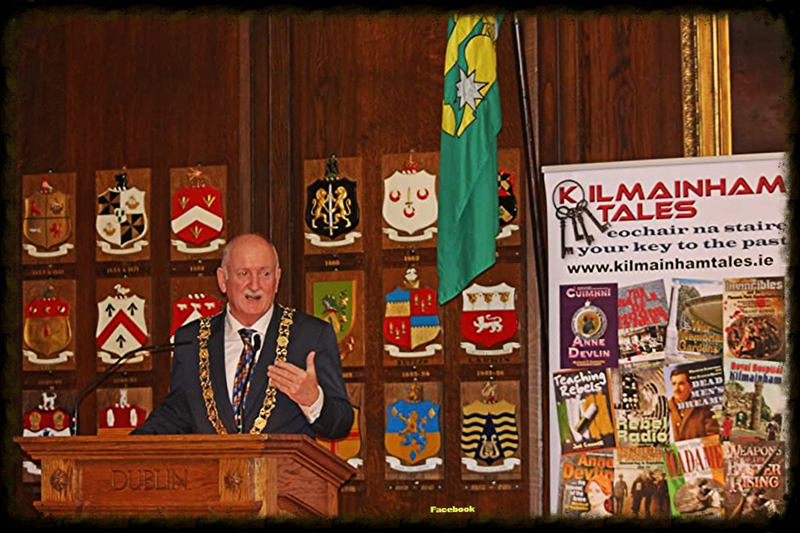 The Lord Mayor, just two days previously in the Irish Times Christmas Guide, had said that the book he would be giving for Christmas would be our "1916 - Cath Sráid Uí Mhórdha/Battle of Moore Street" and, true to his word, in association with Kilmainham Tales a free copy was also given to all attendees! 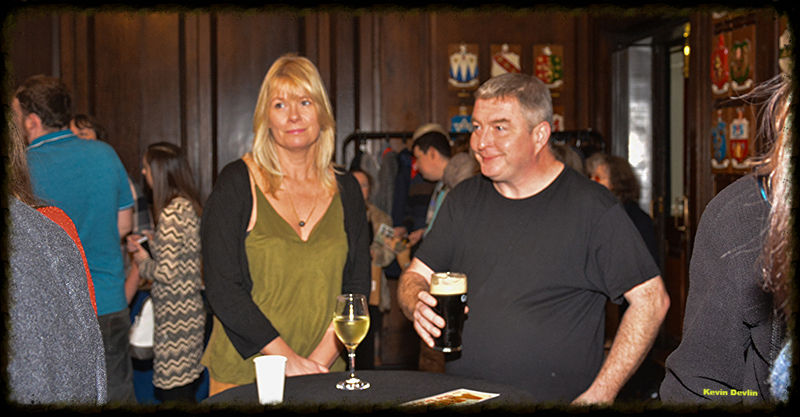 So all who attended shared our celebration. 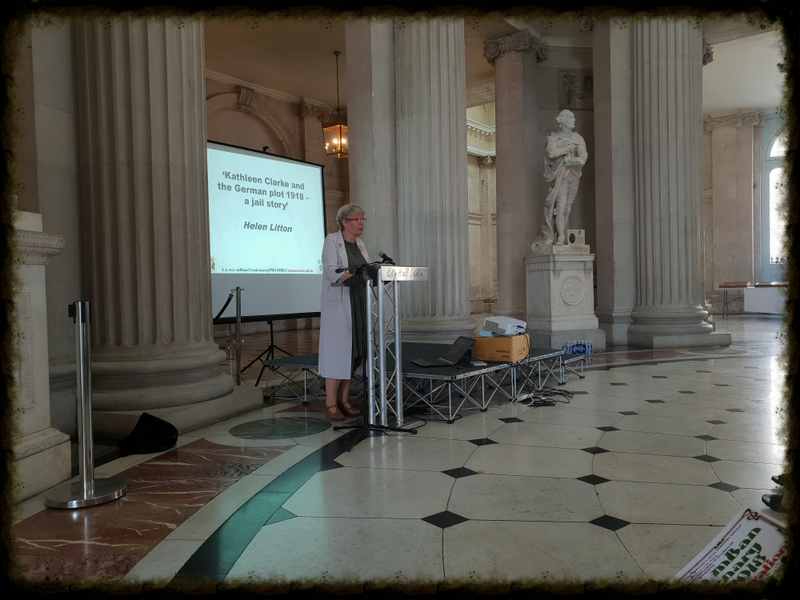 A final and special word of thanks must go to all the Mansion House staff - both before and during this event - for their professionalism, friendliness and courtesy. 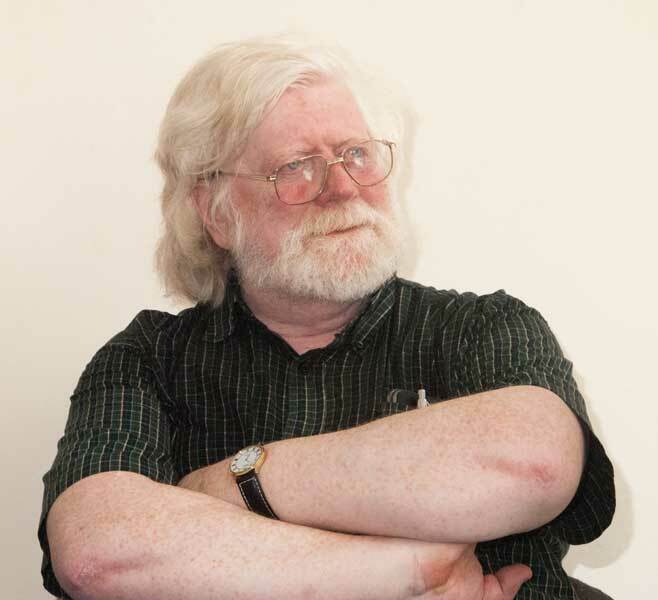 Don Árd Mhéara féin, míle, míle buíochais. 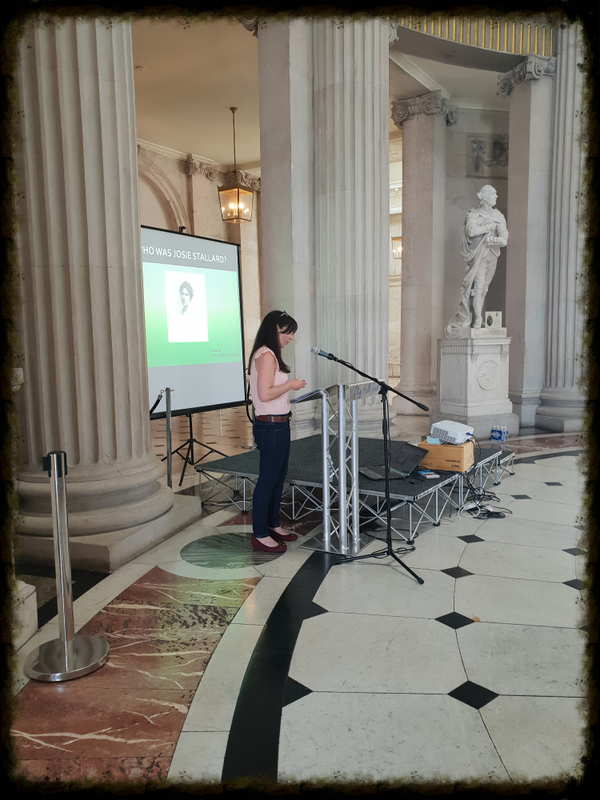 Congratulations to Áine Broy who won the complete collection of our publications, including the Anne Devlin plaque and Medal. 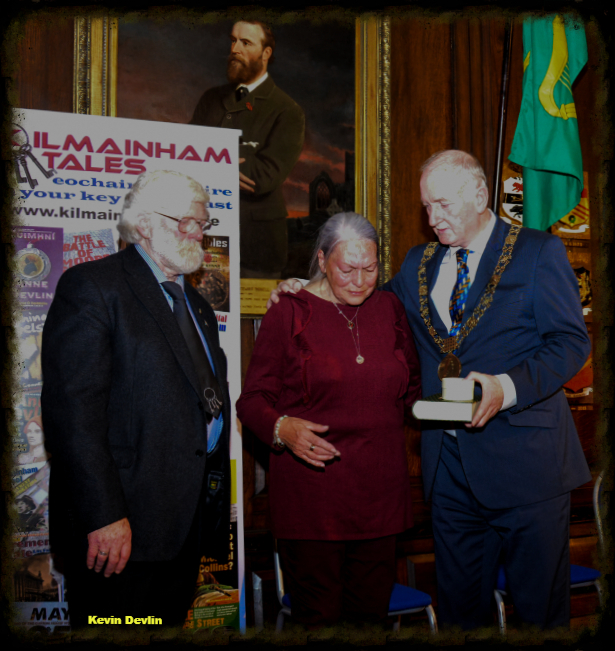 it is hard to believe, but it is ten - yes, 10 - years since we published our first book under the Kilmainham Tales banner - "Anne Devlin - bravest of the brave". Since then, we have published another 18, bringing the grand total to 19, with plenty more to come. 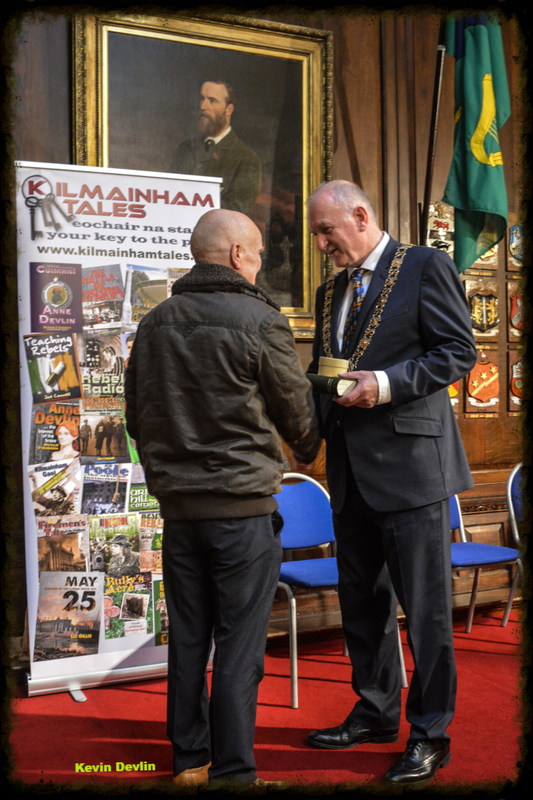 Two years ago we launched a new series - Kilmainham Tales Specials - full paperbacks on specific incidents or periods in Irish history - with the publishing of "MAY 25 - burning of the Custom House 1921" and currently are working on our sixth title in this series. 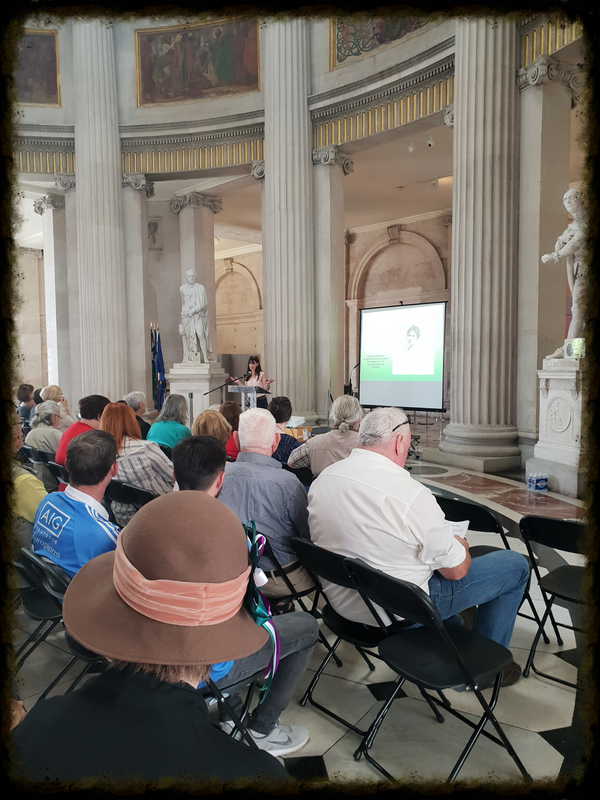 In total, we have 26 books on Irish history in our catalogue, and counting ... (If you are counting, you will only get to 24 books, but there are two others, a Kilmainham Tales local history one and and a Kilmainham Tales Special of the papers of the Lá na mBan commemoration talks from City Hall on June 10th of this year. 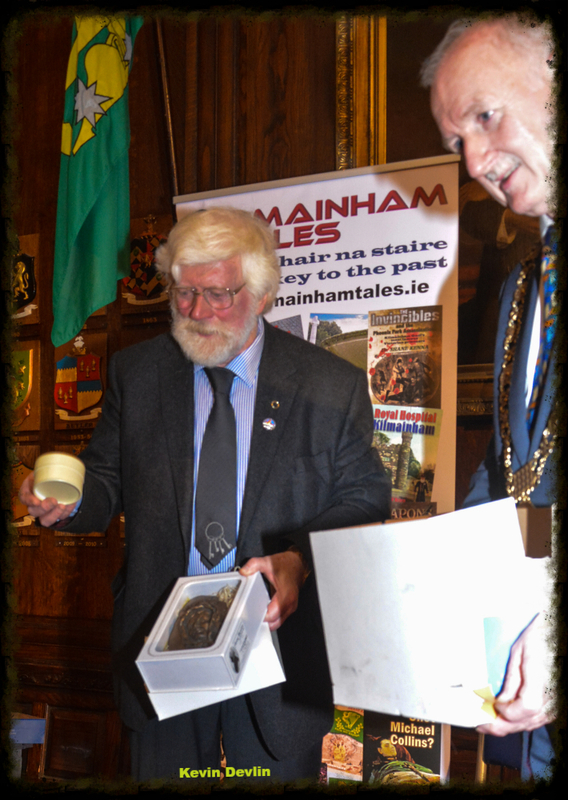 Neither are on sale, but were exclusively included in the collection given as a prize and also the set present to the Lord Mayor). 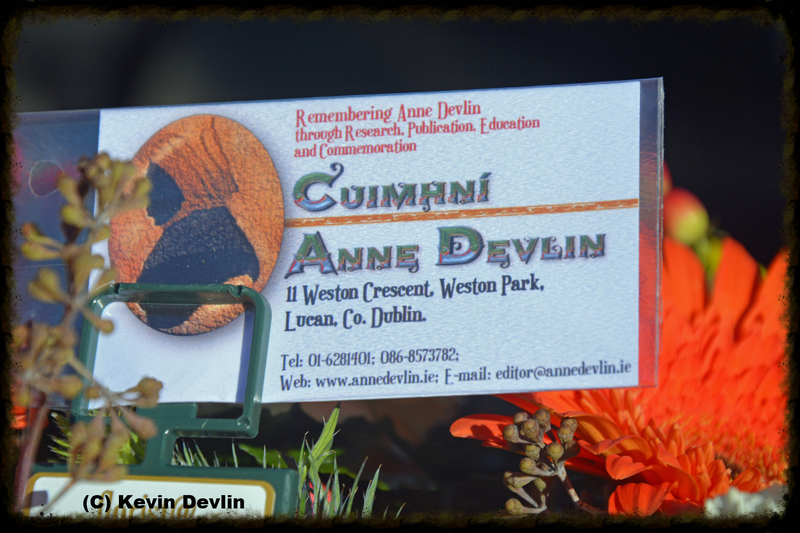 In between, we produced a special, limited edition plaque in honour of the subject of our first book - Anne Devlin. Limited to only 71 copies, one for each year of her life. 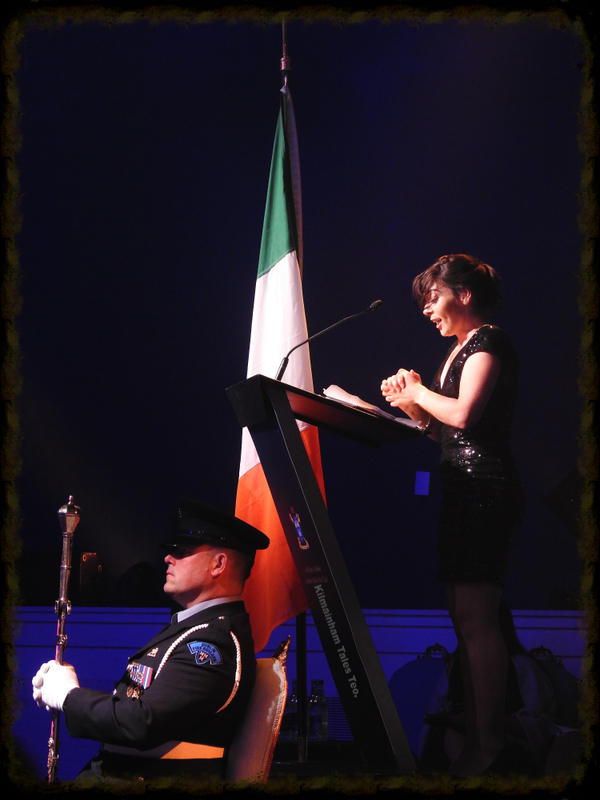 Last year we produced a specially designed coin in honour of the same Irish hero. 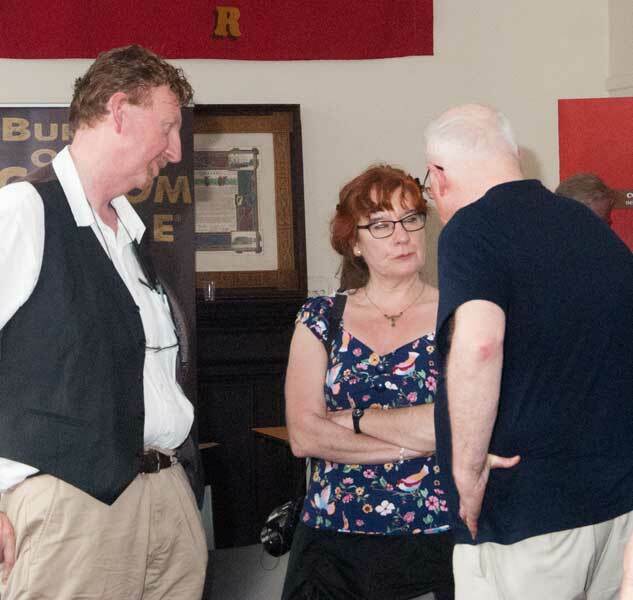 We are currently working on a major new book - the first in a trilogy on the Irish Civil War dead - and also have the texts of several other books on our desk. 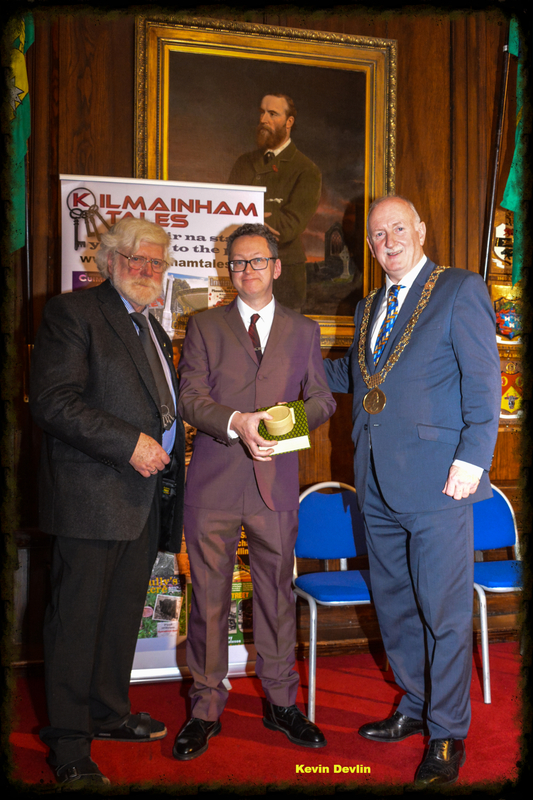 Amongst these are another Kilmainham Tale Special - "A Thirst for Freedom" about the role alcohol and pubs have played in the Irish freedom struggle, an original series book on James Connolly in Scotland, and another 'Weapons' book - this time of the Irish War of Independence. 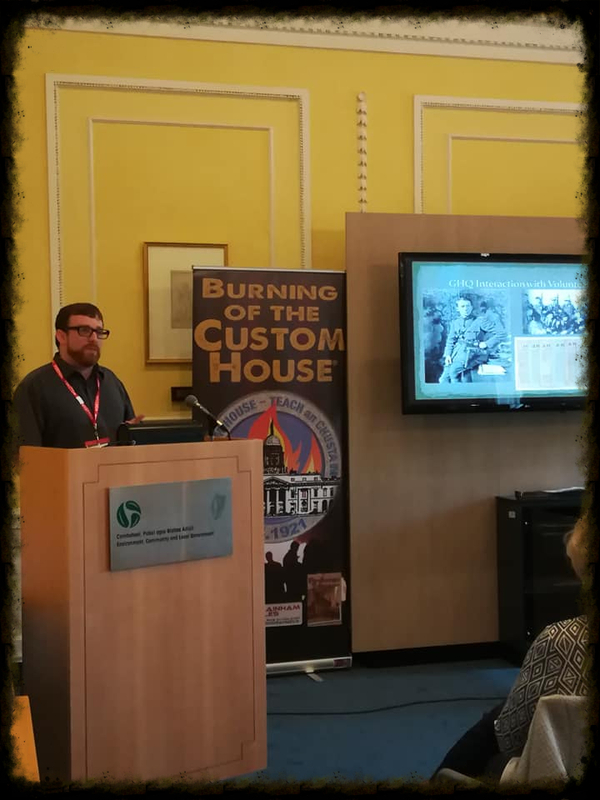 We hope also to return to the successful burning of the Custom House with another book on some of the participants in that event, and produce a book on Josie McGowan, the first Cumann na mBan member to be killed in the War of Independence. 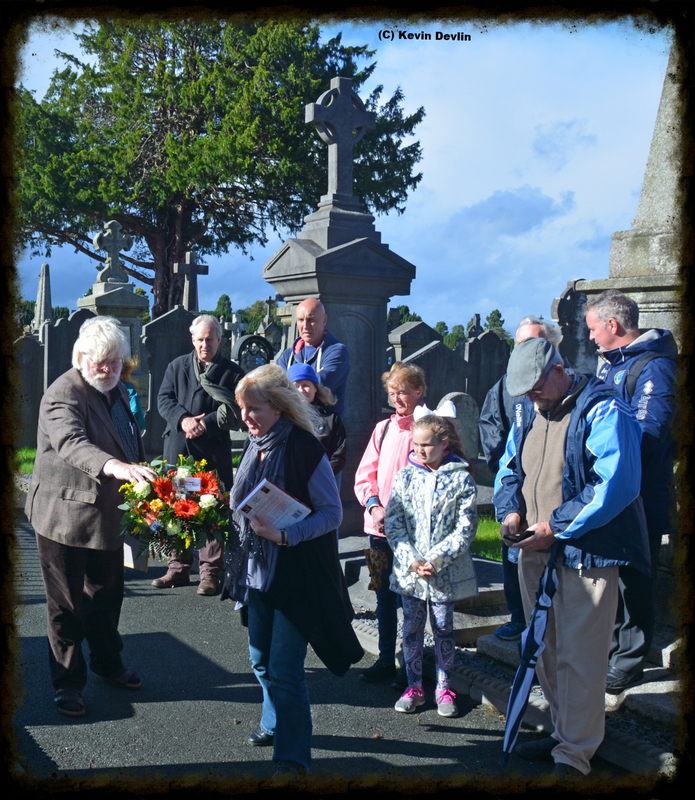 We also hope to have some great news to share on our ongoing campaign (through 'Cuimhní Anne Devlin') to have Anne Devlin's husband William moved from his present lonely grave to finally lie with his wife as they both wished. 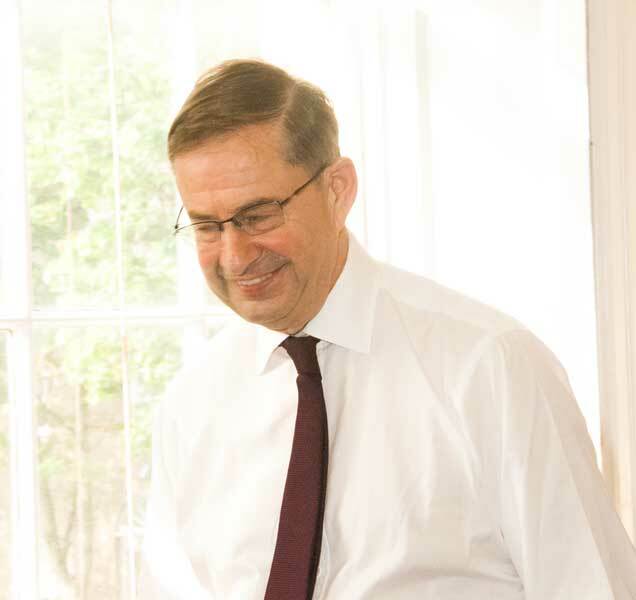 So, a busy time ahead which we hope you will share with us as you have shared the past ten years! 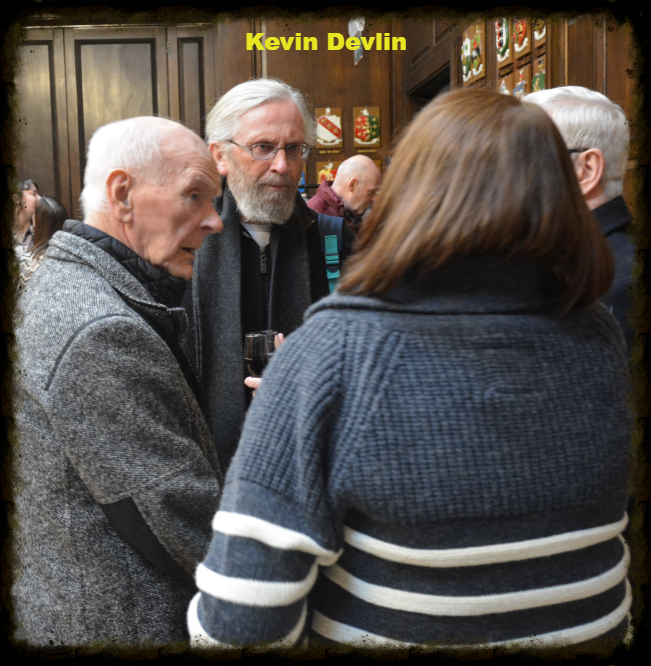 Below is just a selection of the many, many photos taken by our photographer Kevin Devlin and others. 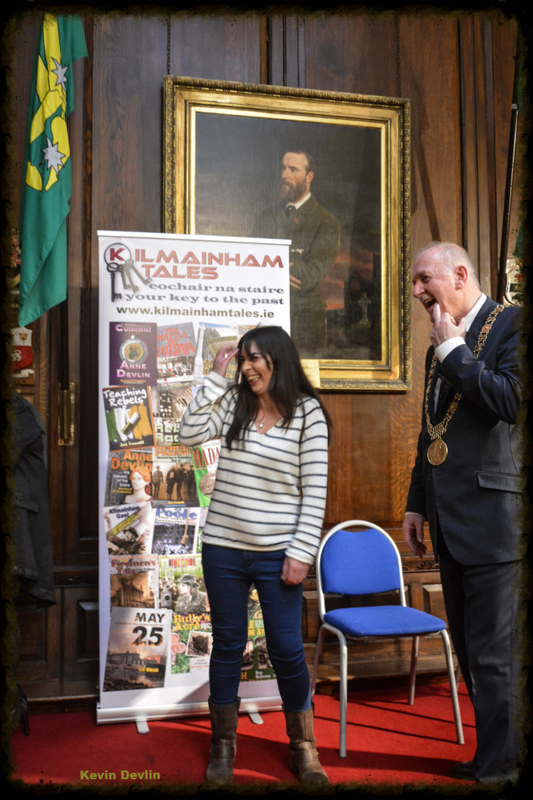 Kilmainham Tales has had a busy time over the last couple of weeks, with three (yes, 3!) 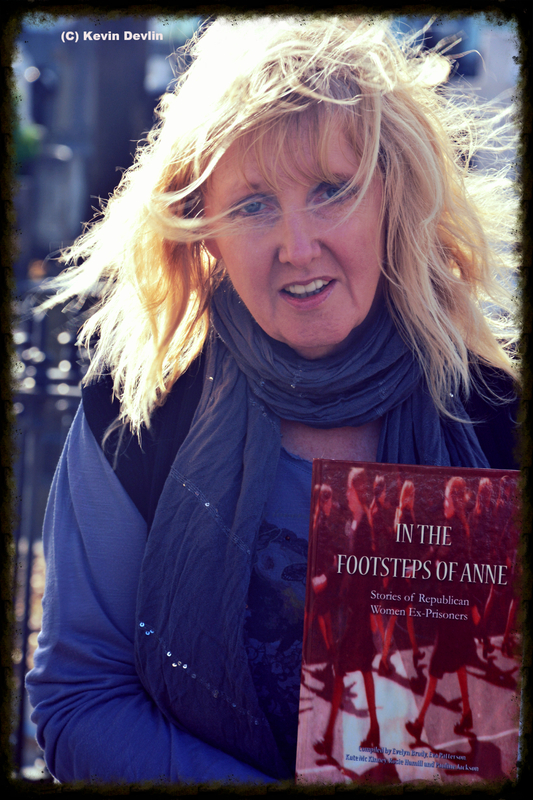 book launches in the space of 8 days, another published but not officially launched, taking part in the annual Anne Devlin Commemoration and two guided walking tours "In the Footsteps of Anne Devlin" in the Liberties. AND our Secretary got married! 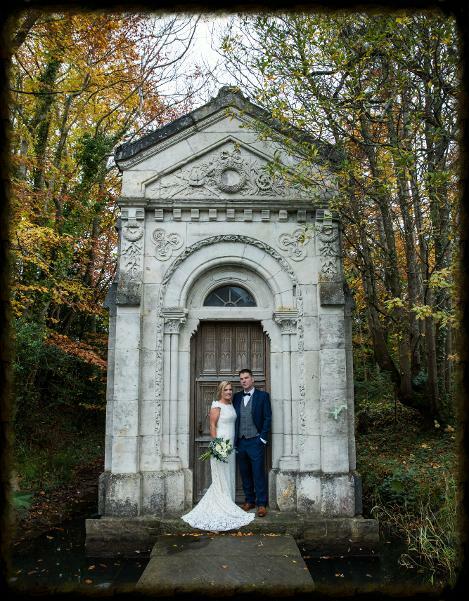 We send our congratulations and best wishes to our Company Secretary (and MD's daughter) Jenny Ní Dhoibhilín on her marriage to Dave Marten on Friday November 2nd. 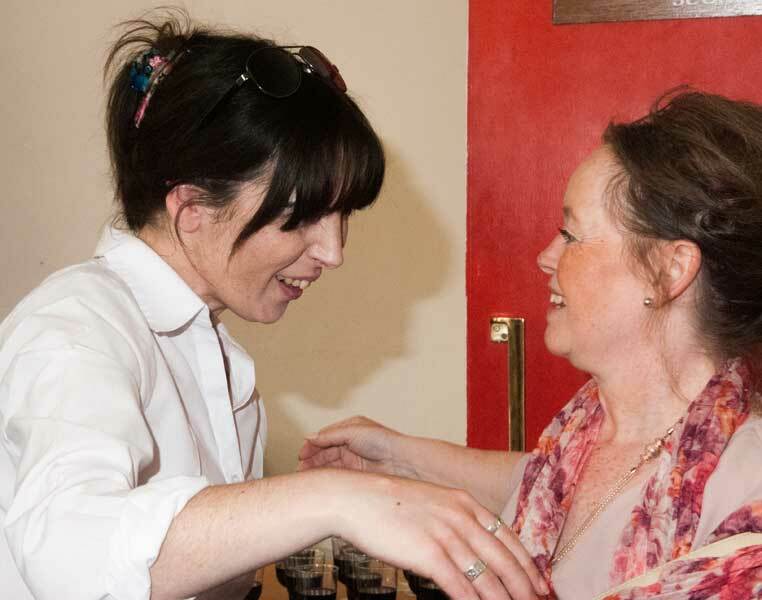 A great occasion, a fabulous wedding and a wonderful day enjoyed by all in the Springfield Hotel, Lucan. 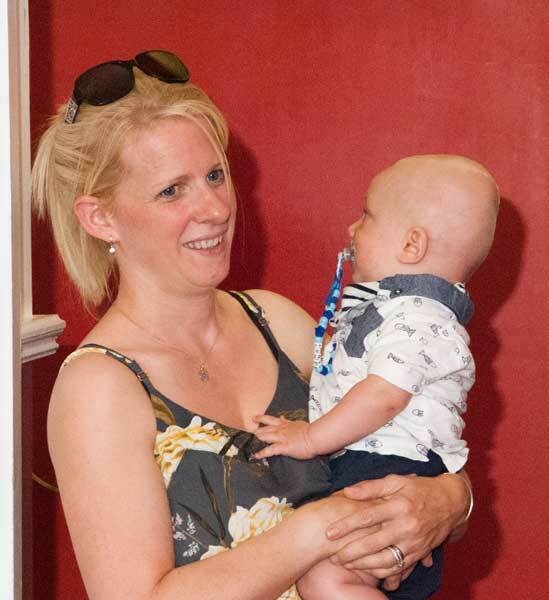 It is great to see a child of yours grow into such a wonderful, creative and loving person, mother and wife. 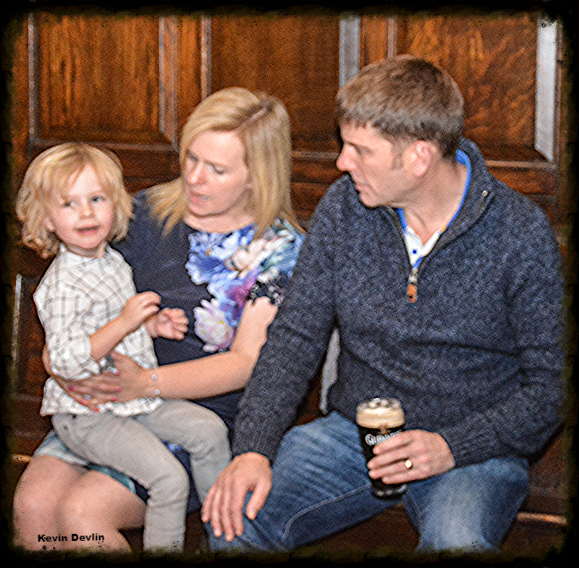 Jenny and Dave - and their son Cian - are jetting off to warmer climes for a while, and we wish them every happiness - not just on this brief journey but on the longer journey through their life together as a family. 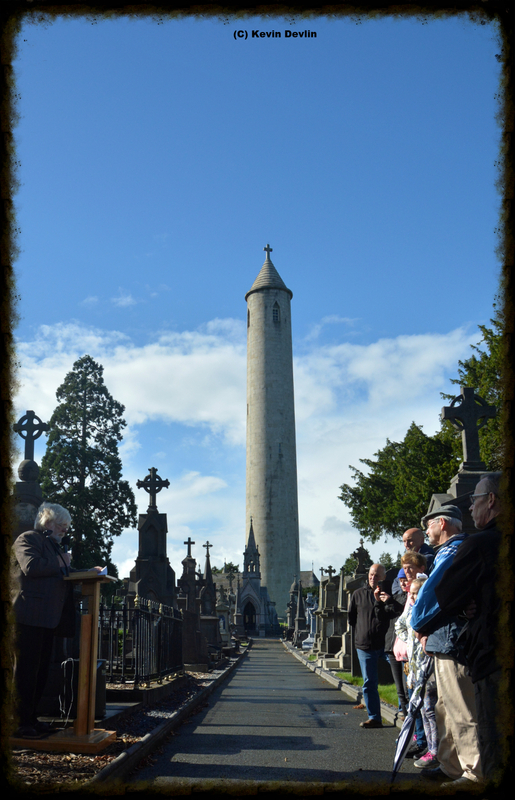 This year's commemoration was held on Sunday September 2018. 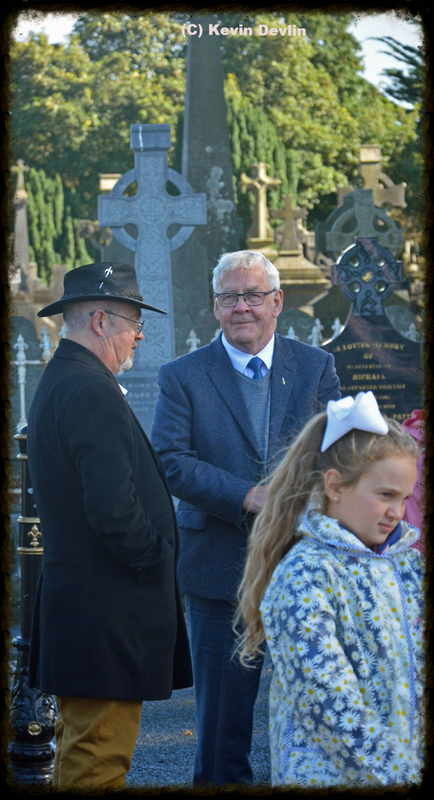 We began as always with 12.00 noon mass in St. Catherine's Church, Meath Street, after which a brief eulogy was delivered by Mícheál Ó Doibhilín. 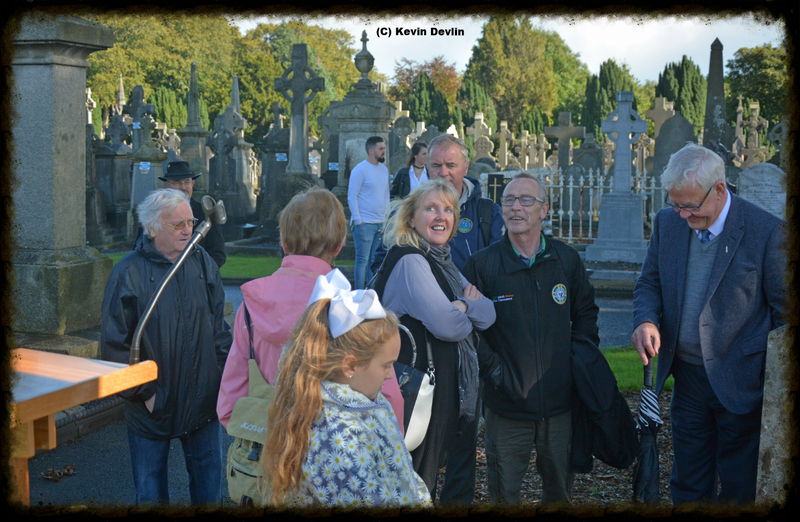 Later, at 3.00pm, we assembled at Anne Devlin's grave in Glasnevin Cemetery. 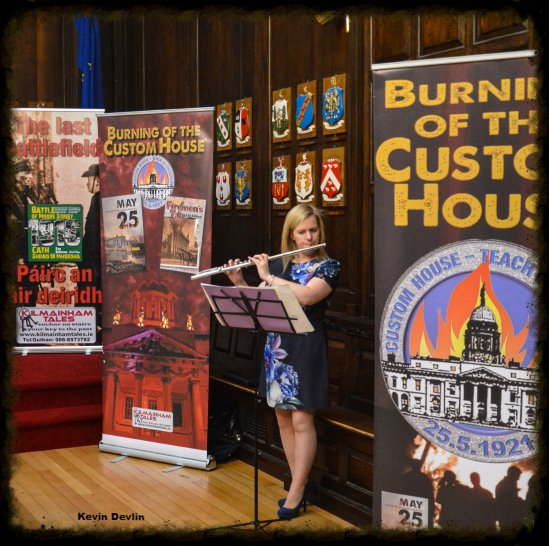 The commemoration began with a rendition of his beautiful musical tribute to Anne Devlin - "Not Every Hero Waves A Flag" - by Frank Callery, accompanied on the flute by Jenny Ní Dhoibhilín. 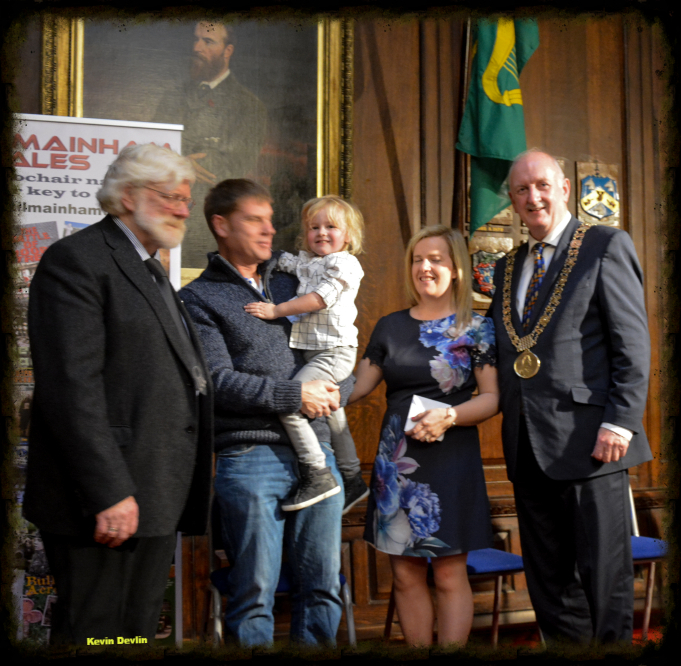 This year we were honoured that Lord Mayor of Dublin Cllr Nial Ring attended as guest of honour and delivered the keynote graveside oration in addition to laying the first floral tribute on her grave. 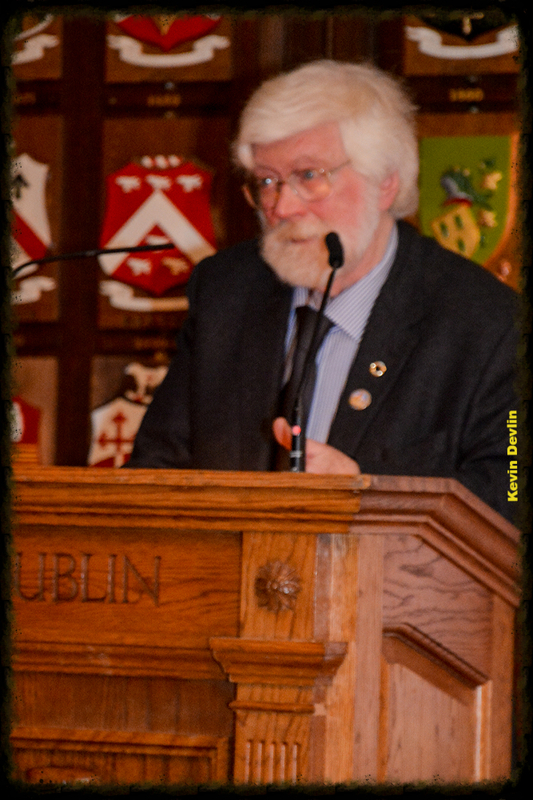 George McCullough, CEO Glasnevin Trust, spoke next, outlining the circumstances of Anne Devlin's interrment and re-interrment, before Mícheál Ó Doibhilín replied to the Lord Mayor's address, after which Liz Gillis will laid a floral tribute on behalf of Cuimhní Anne Devlin, and Jenny Ní Dhoibhilín will laid another on behalf of Kilmainham Tales Teo., followed by others who wished to follow suit. 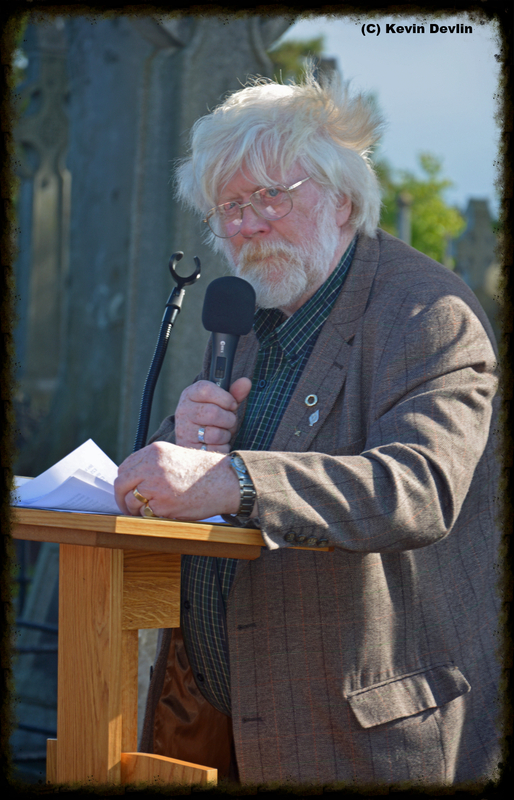 The ceremony concluded with Frank Callery reprising his song, and throughout the ceremony there was an Honour Guard by Terry Crosbie and friends. 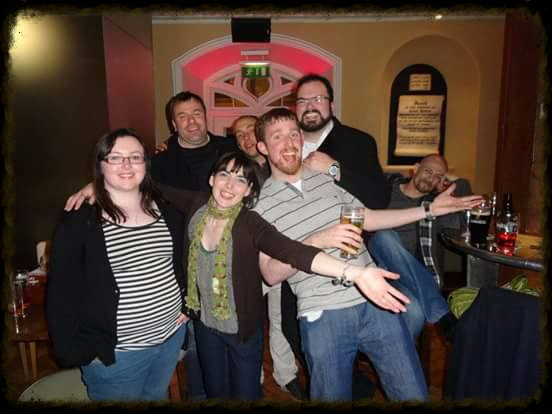 by Teresa Quinn on Liffey Sound 96.4fm. 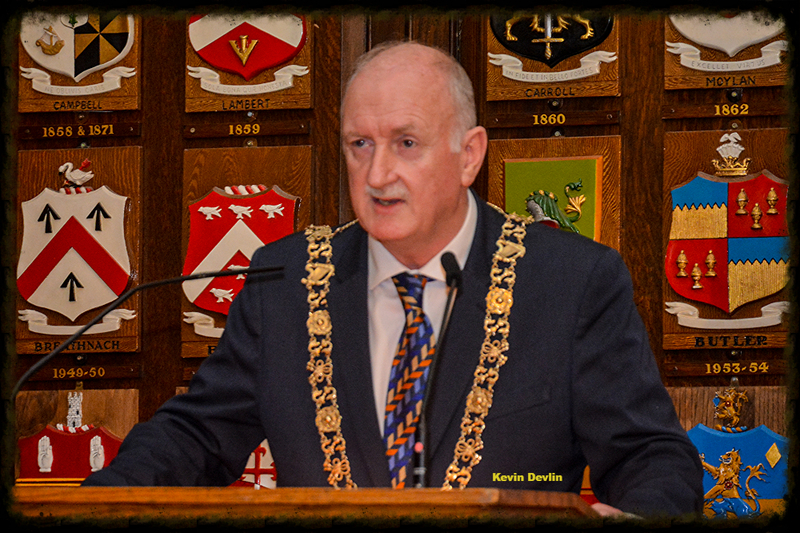 We are honoured that the Lord Mayor of Dublin, Cllr. 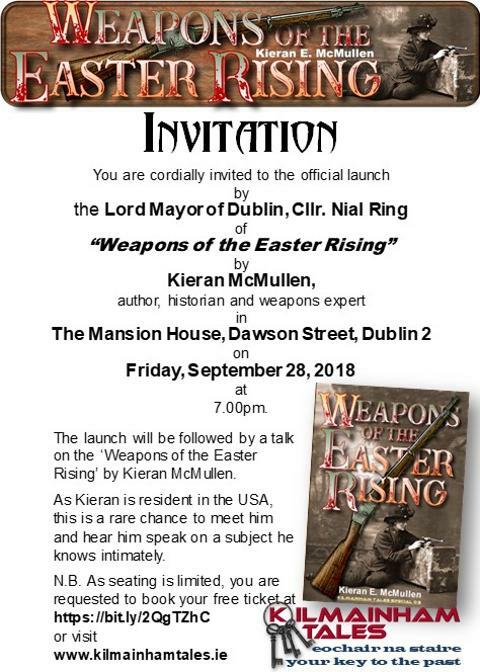 Nial Ring, will formally launching our terriffic new publication "Weapons of the Easter Rising" by American author, historian and weapons specialist Kieran McMullen in Dublin's Mansion House on Friday, September 28th next. 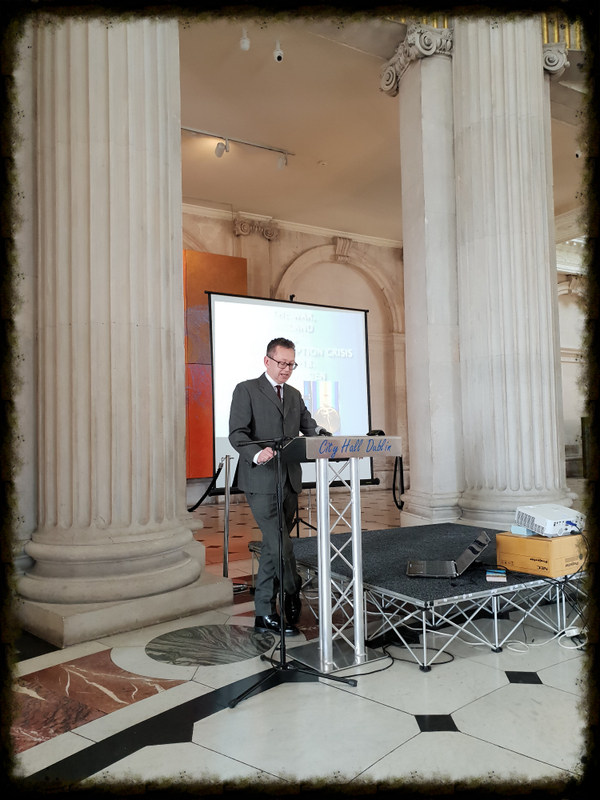 Immediately after the launch, Kieran will give an illustrated talk on "Weapons of the Easter Rising", drawing on his extensive knowledge and personal collection of weapons of the period. 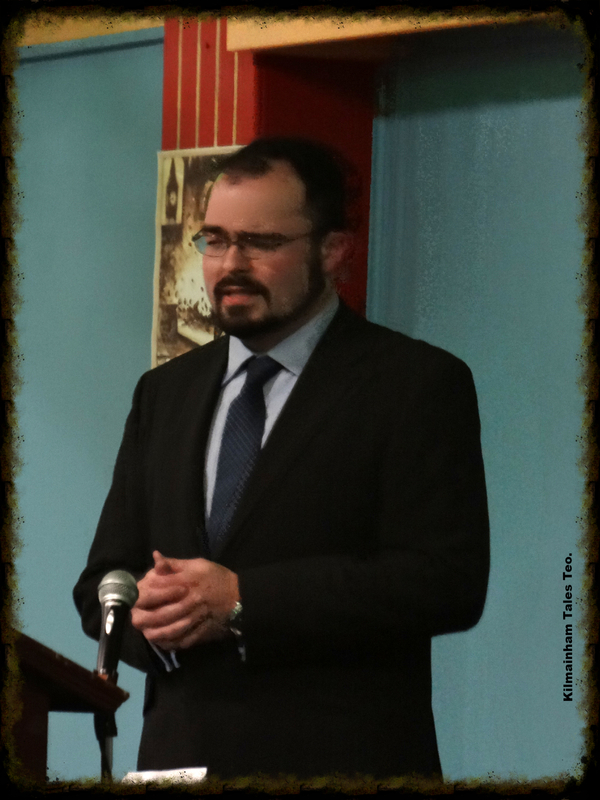 This is a unique opportunity, unlikely to be repeated, to hear Kieran speak as he is resident in the USA. 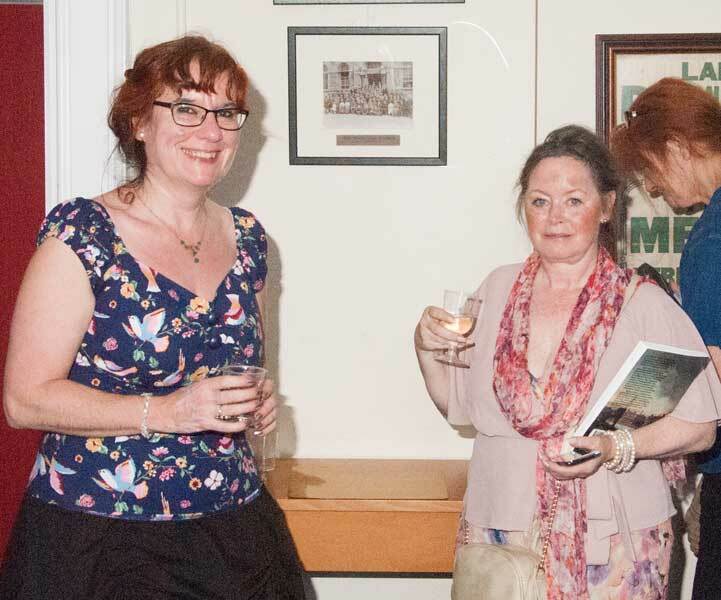 After the talk, there will be some light refreshments and music supplied by a group of award-winning Irish musicians, and an opportunity to purchase the book (at a discounted price) and have it signed by the author in person. 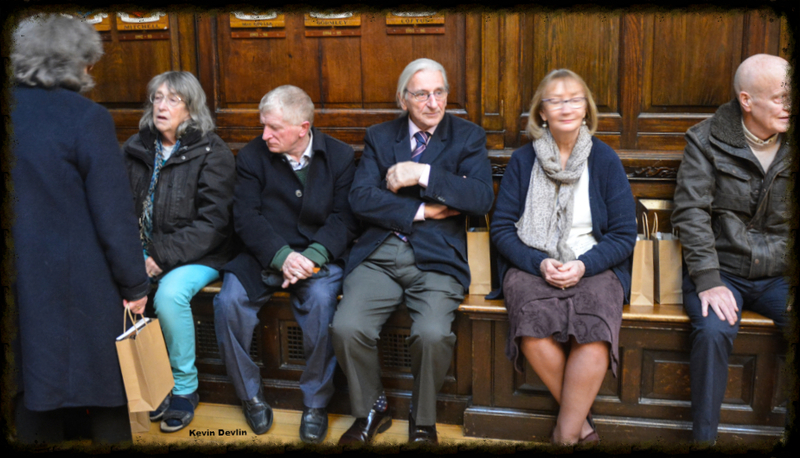 Please note that, as this is a seated event, admission must be strictly limited. 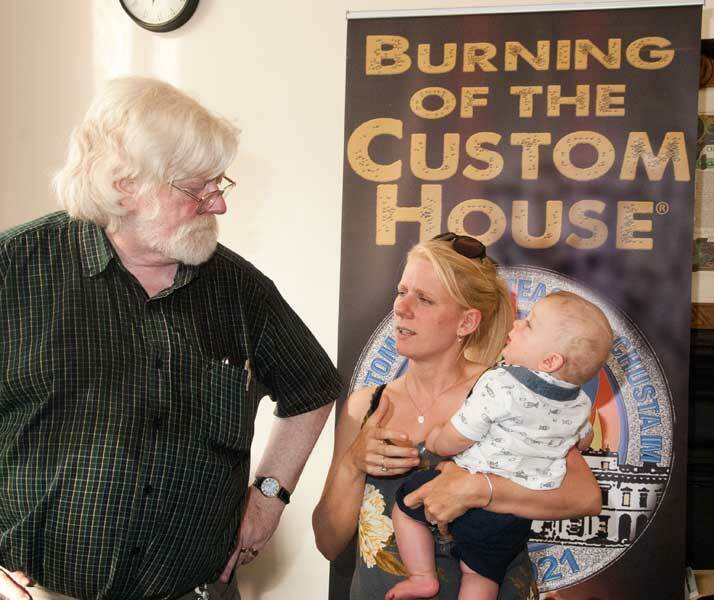 In addition, the Mansion House has requested a list of all attendeed in advance.Therefore, you must register for this FREE event by clicking here on Eventbrite to obtain a ticket. 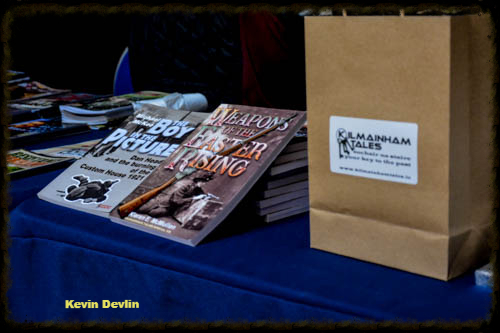 "Weapons of the Easter Rising"
has been praised by all who have read pre-launch copies, e.g. 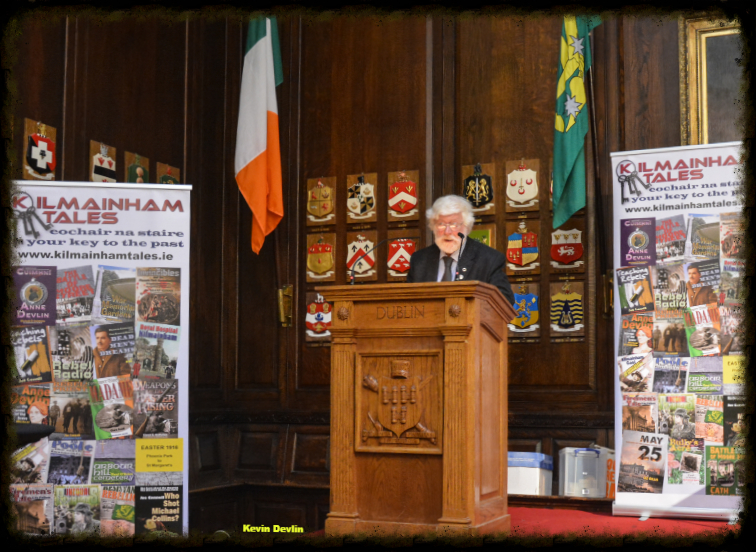 "Many people contact me in relation to good books on the 1916 Easter Rising. This is a new one. just out. Well worth getting for a read and for reference". 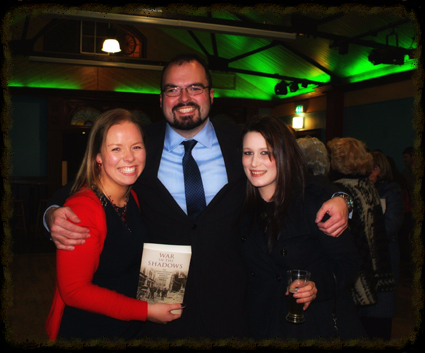 "Very solid and well researched book by my friend Kieran McMullen on the weapons of 1916. 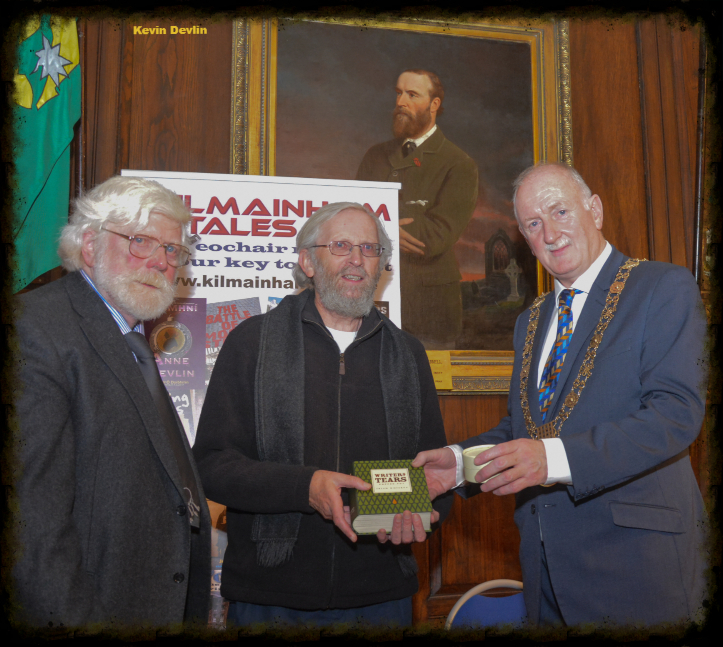 Published by a great man Mícheál Ó Doibhilín from Kilmainham Tales (look them up). 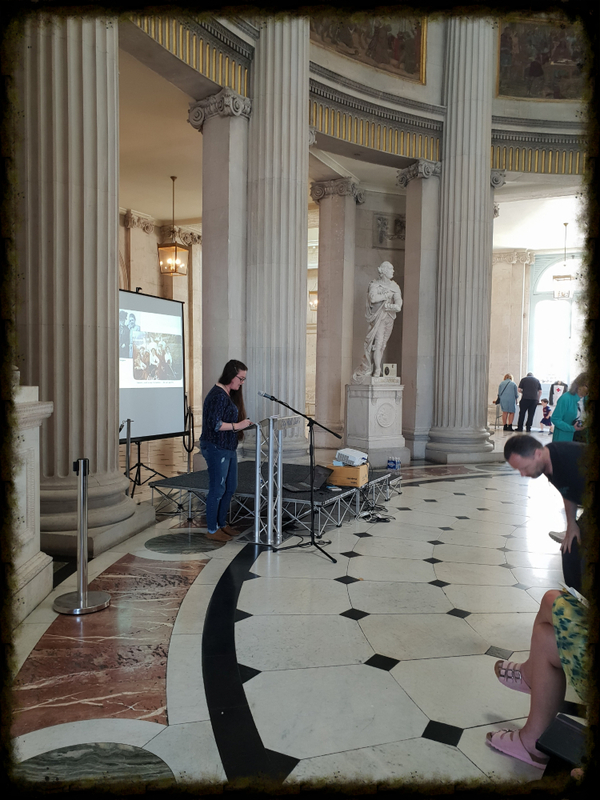 Kieran, who lives in the US, has amassed an immense amount of detailed information that will be used by authors and students for years to come. Incredible work and a big shout out to Kieran for writing it". What it said in the papers! 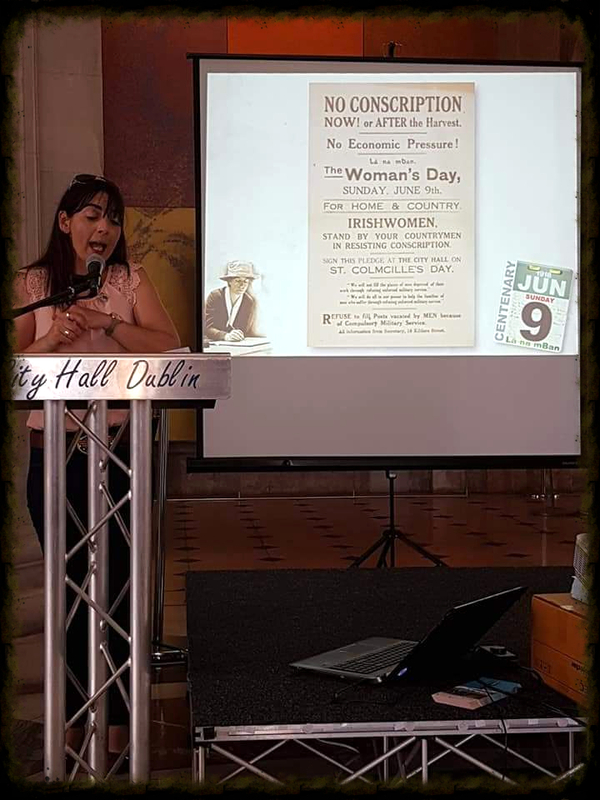 On June 10th 2018 in Dublin's City Hall Liz Gillis and Mícheál Ó Doibhilín commemorated Lá na mBan 9th June 1918, when the women of Ireland came out in force to deny the might of the British Empire. 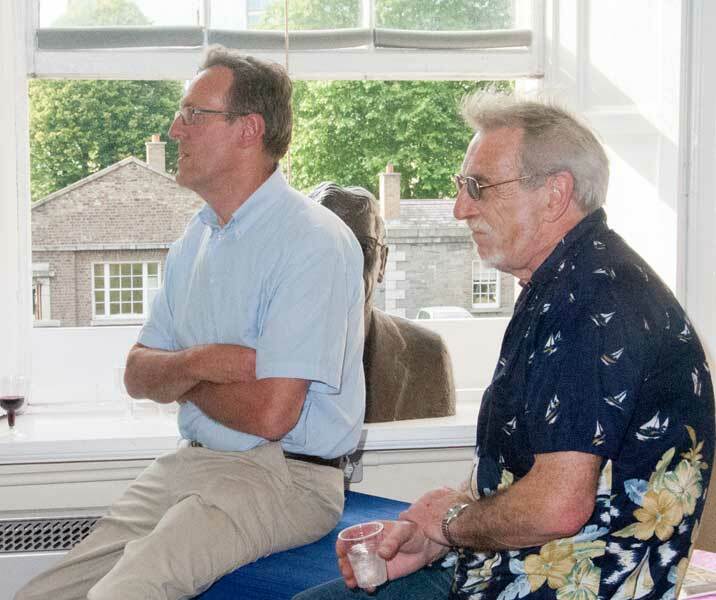 There were eight speakers on the day and now all the eight papers presented have been gathered together into a superb 164 page souvenir book, including a magnificent photo record by Pat Gillis. 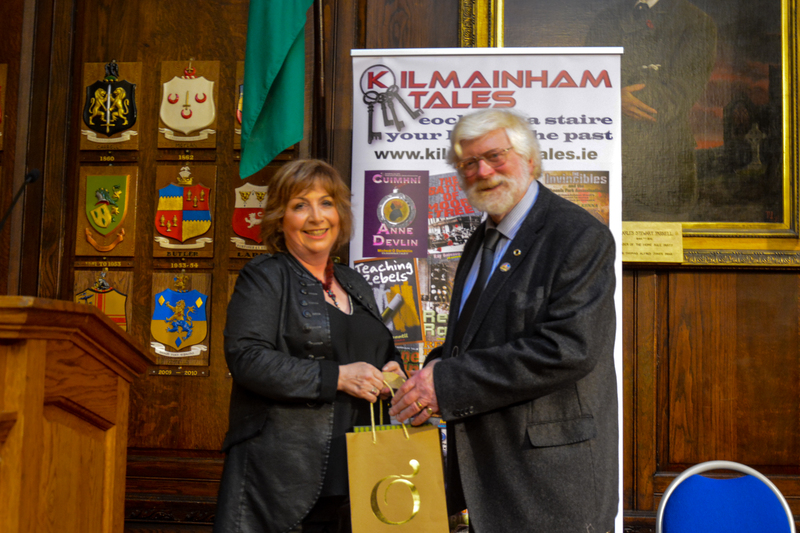 While the book is published as Kilmainham Tale Special 04, it is not on sale - it was produced as a special limited edition for those who attended the free commemoration and purchased a copy of the Journal then. 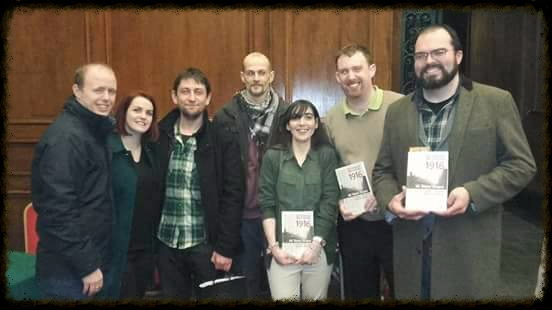 All who attended and purchased a copy were entitled to have a name of their own choice inscribed in the book. All books have now been posted to subscribers, and initial reaction has been excellent. 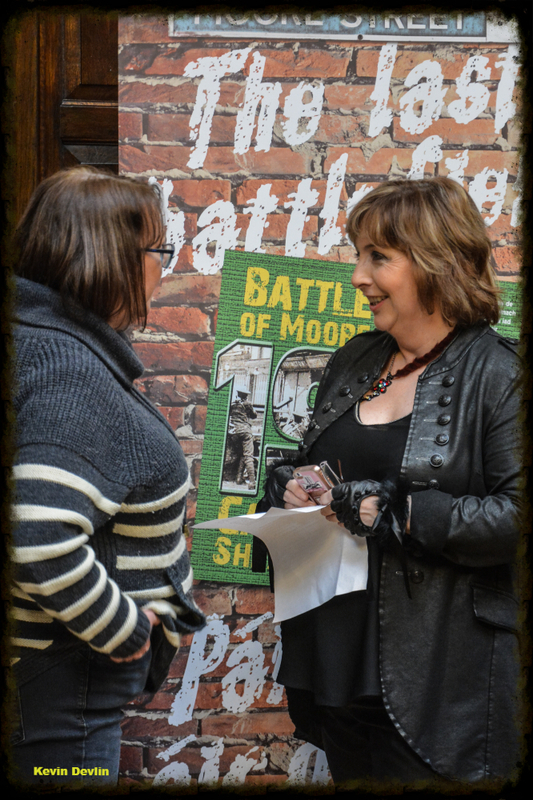 We feel it is a superb record of a great day which acknowledged the fantastic achievement of those brave and valiant women of 1918. 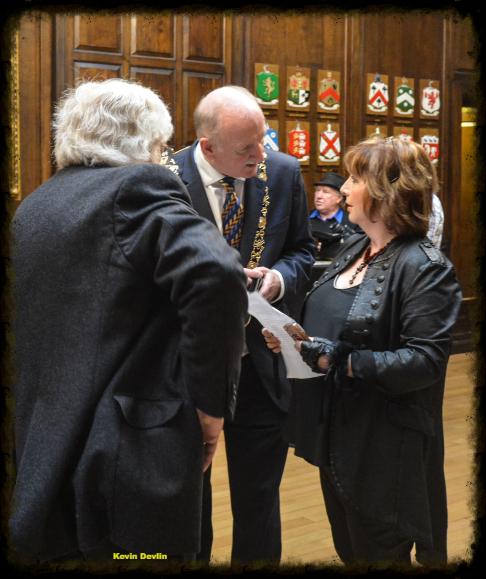 On Saturday, 29 June, Liz Gillis - author of "May 25 - burning of the Custom House 1921" and several other books on the Easter Rising, Irish War of Independence and Civil War - was granted The Lord Mayor's Award by Árd-Mhéara Áth Cliath Mícheál MacDonncha. 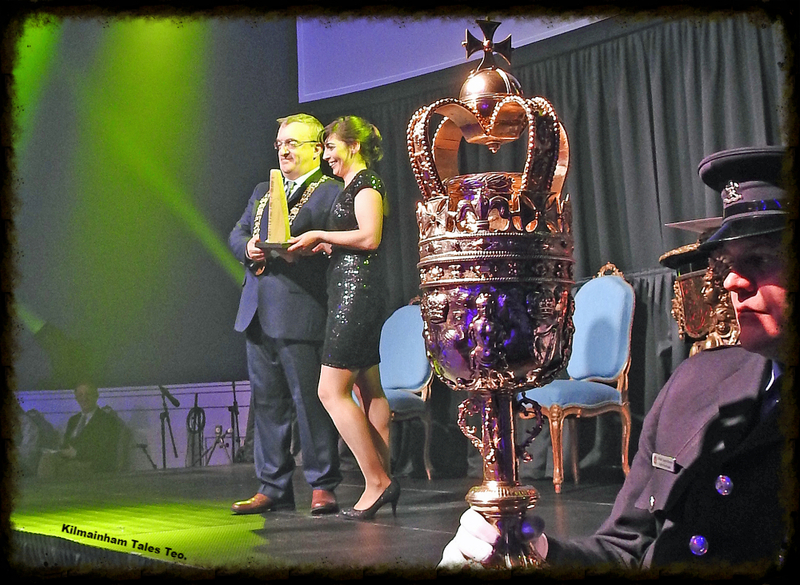 "Since 1989 the Lord Mayor's Awards have honoured individuals and groups who have made a special contribution to both Dublin and its citizens. 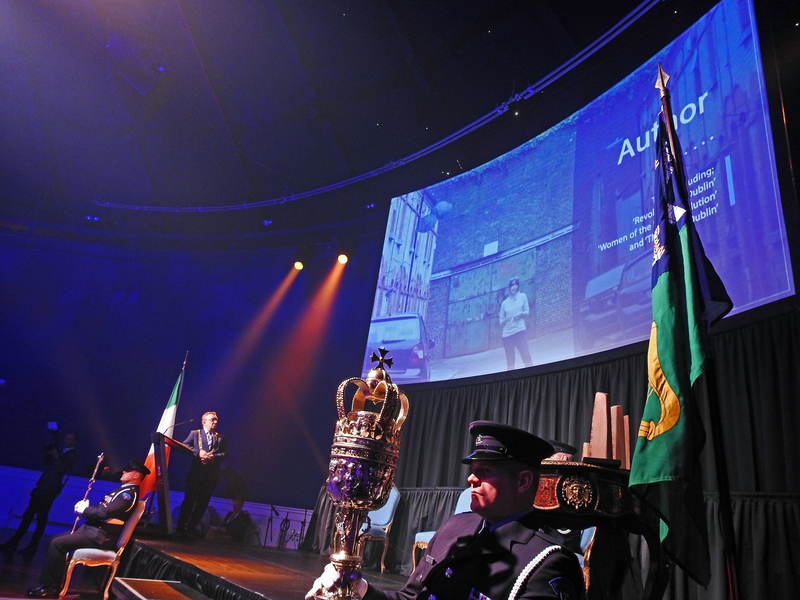 These awards, held annually, are Dublin City's way of acknowledging and congratulating them for the extraordinary work they do". 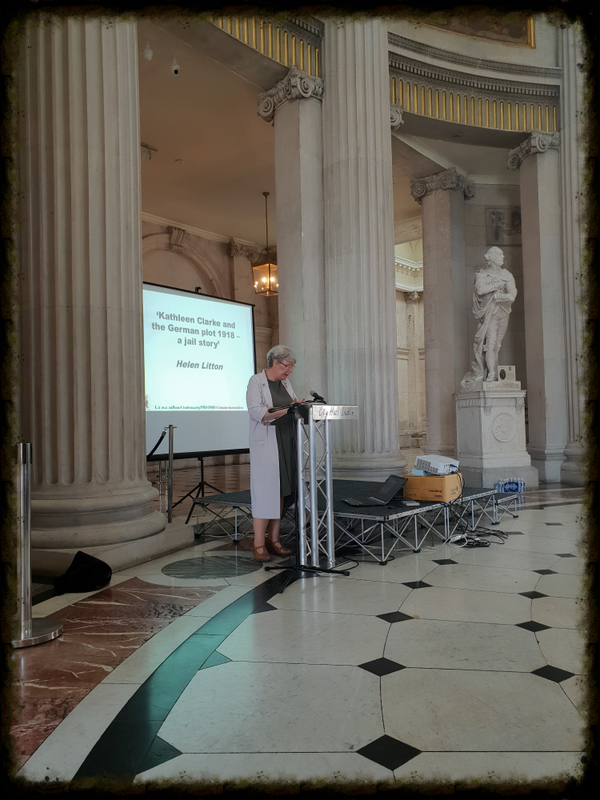 The Árd-Mhéara presented Liz with her award "in recognition of her outstanding contribution to the city as a historian of Dublin and a pioneering chronicler of women in the Irish revolution". 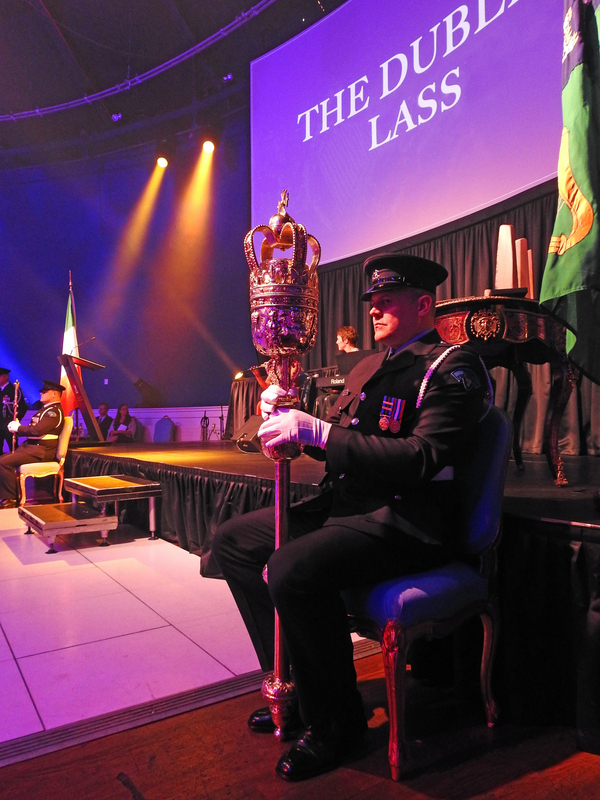 There ceremony took place in the Round Room of the Mansion House, before invited guests. A meal was served, and there was dancing til late! 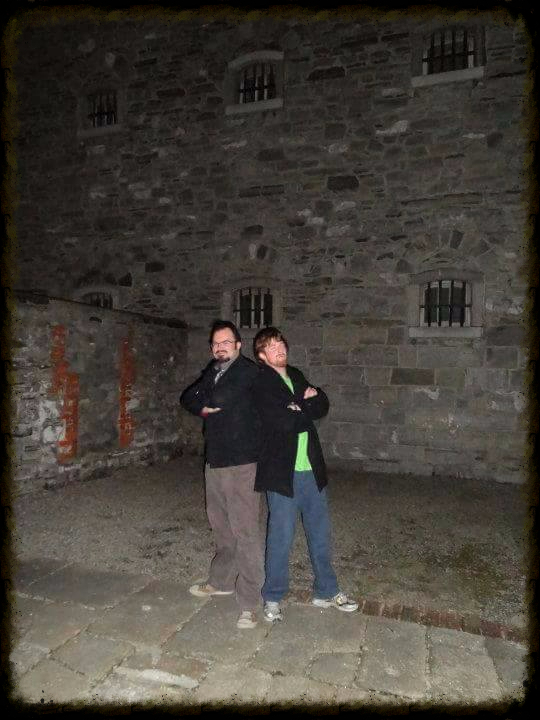 We in Kilmainham Tales Teo. 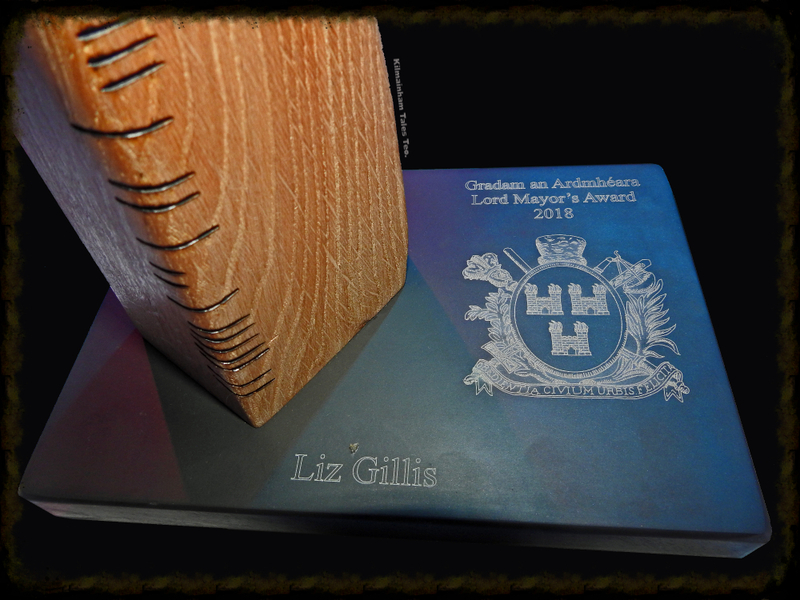 Congratulate Liz on her well-deserved award and recognition of all she does, and are proud to be associated with her. Sunday, 10th June 2018 - one of the finest days of the year. 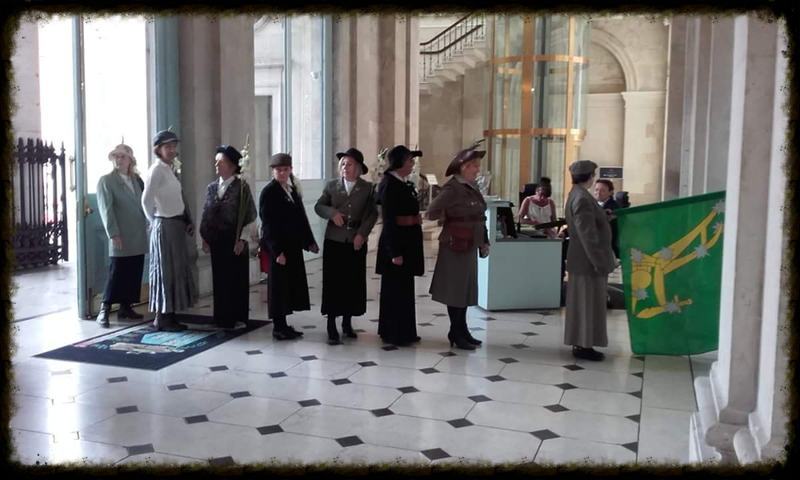 100 days to the day after Sunday 9th June 1918, when 3/4 of the women of Ireland, in one of the greatest shows of solidarity and unity ever, signed a Pledge not to take the jobs of anyone who lost his job through refusing to be conscripted into the British army. 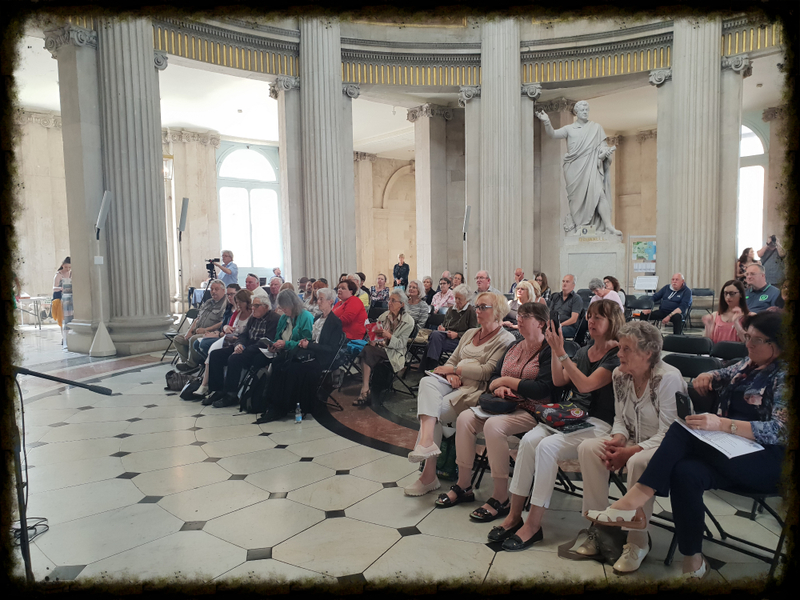 The centenary was commemorated in Dublin's City Hall at an event organised by Liz Gillis and Mícheál Ó Doibhilin Ten speakers - young and old - re-enactors, displays and a bookstall all came together to make this a memorable day for the over 250 who attended. 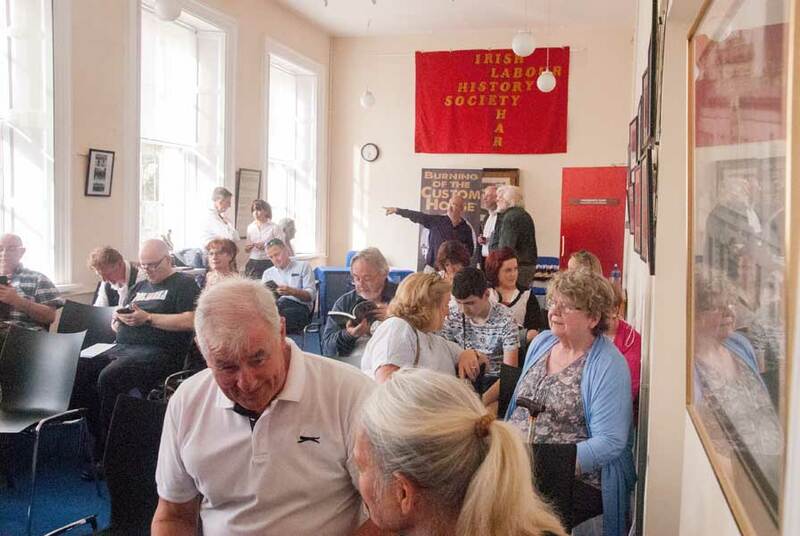 An average of 50 people attended each talk, and all were fulsome in their praise afterwards for the quality of those talks and the depth of the research undertaken. "Flames not Flowers - part re-enactors and part performance artists - interspersed the day's programme with songs and actions, looking magnificent in their period costumes. Many in the audience dressed in period garb too. All in all - a triumph and a show of solidarity across the century. 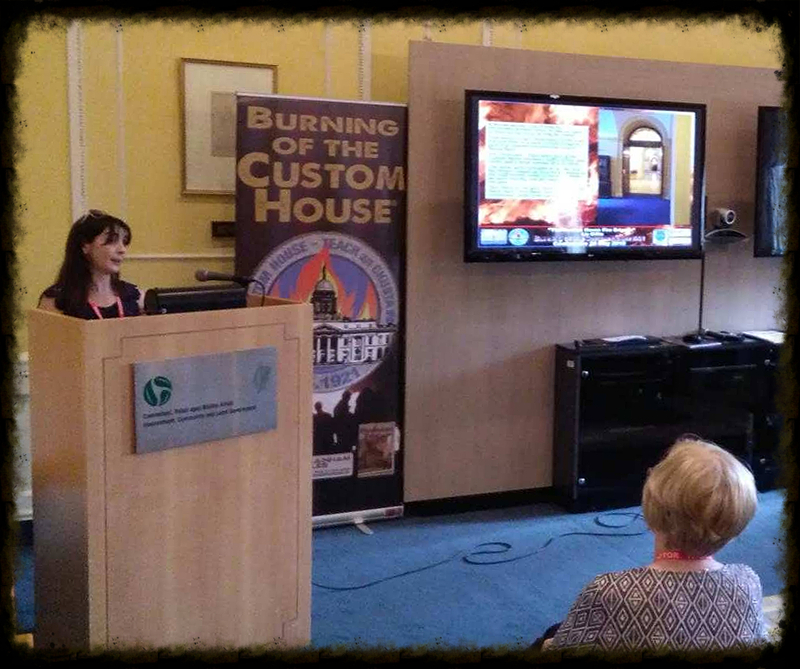 This, our 8th successive Annual Conference on the Burning of the Custom House 1921, was a major success. 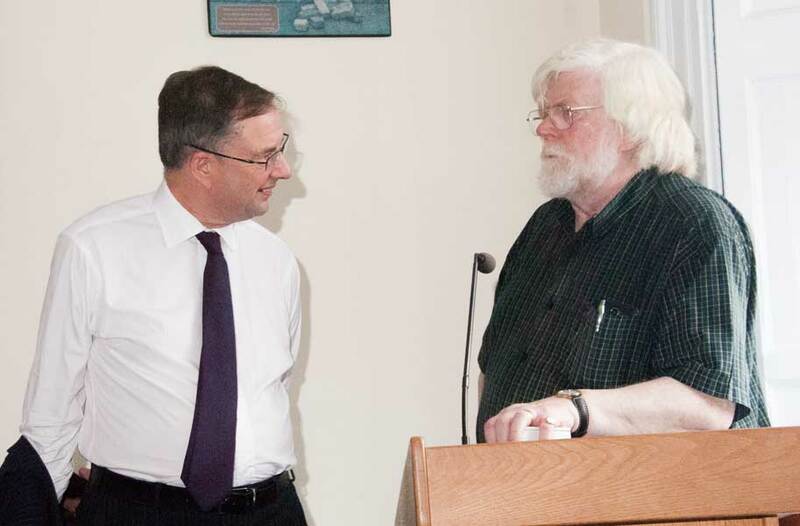 With several new researchers presenting, and some seasoned ones, this was a mix of the old and the new. 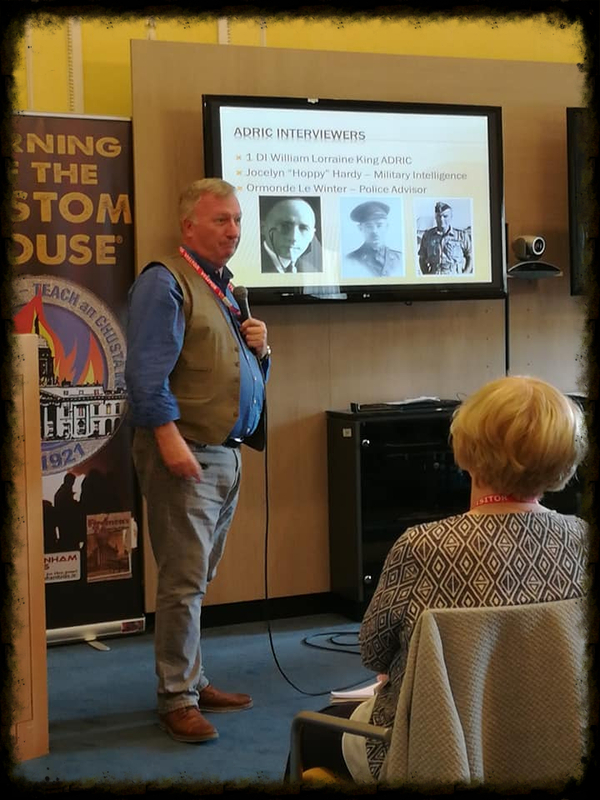 Some subjects were possibly controversial - such as Ernest McColl's talk on the Auxiliaries - but all were stimulating and gave rise to much discussion among the participants. 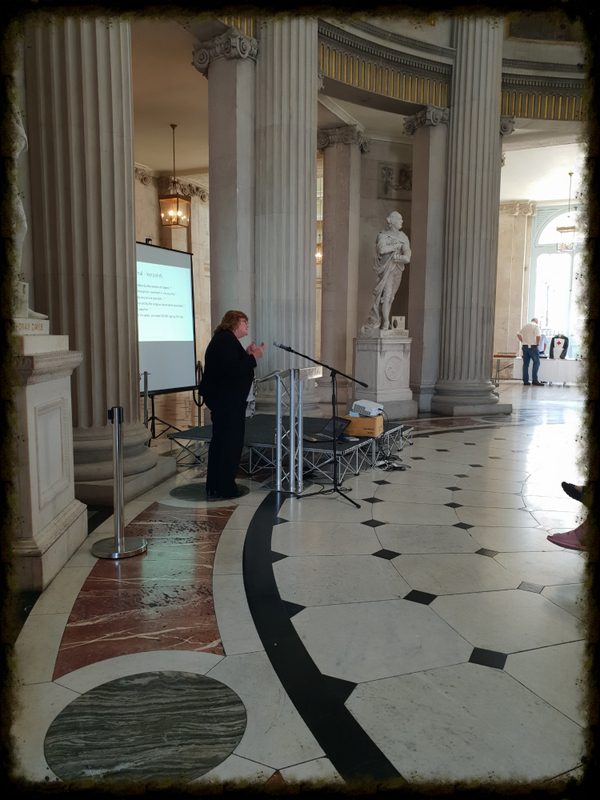 Once again the Custom House did us proud as regards facilities and refreshment, and we were looked after with courtesy, humour and enthusiasm. 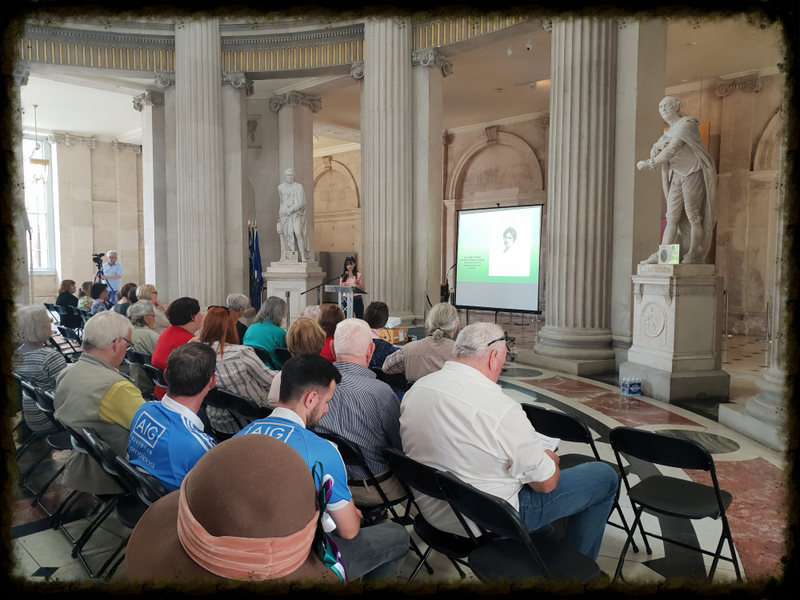 Independence, we are conscious Gillis' Rebellion Walking Tours in Dublin, and Micheal O Doibhilin's Kilmainham Tales Teo., without whom this could not have been the success it was. 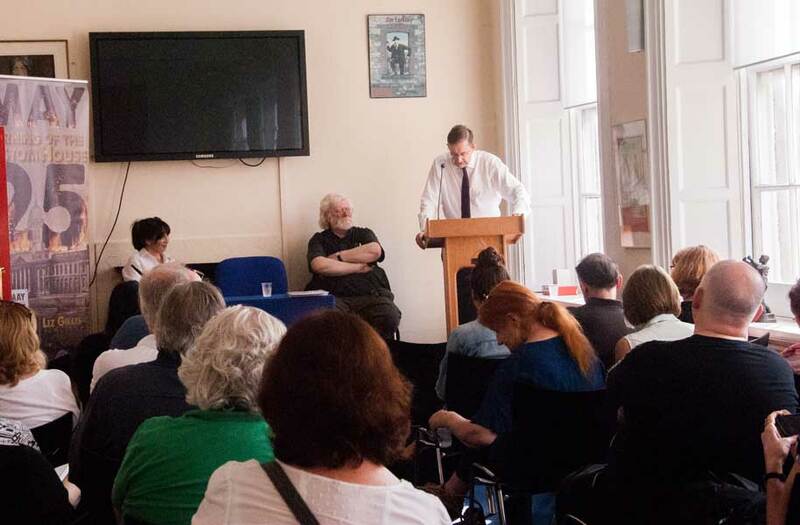 "War of Words - kindling the media interest" by Mícheál Ó Doibhilín. 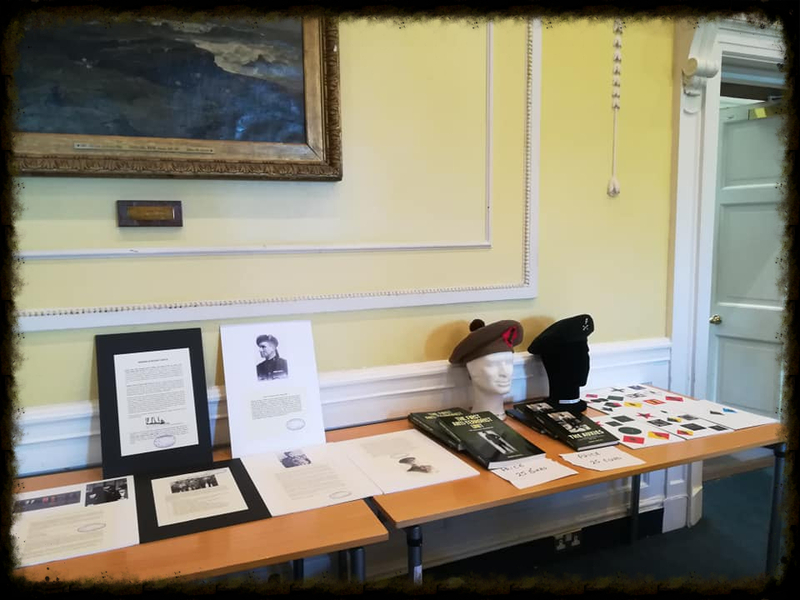 Apart from the talks, we had an excellent range of relevant books and lapel badges, capably curated bu Olive Kenna, proud mother of our sorely missed friend and fellow historian, Dr. Shane Kenna. 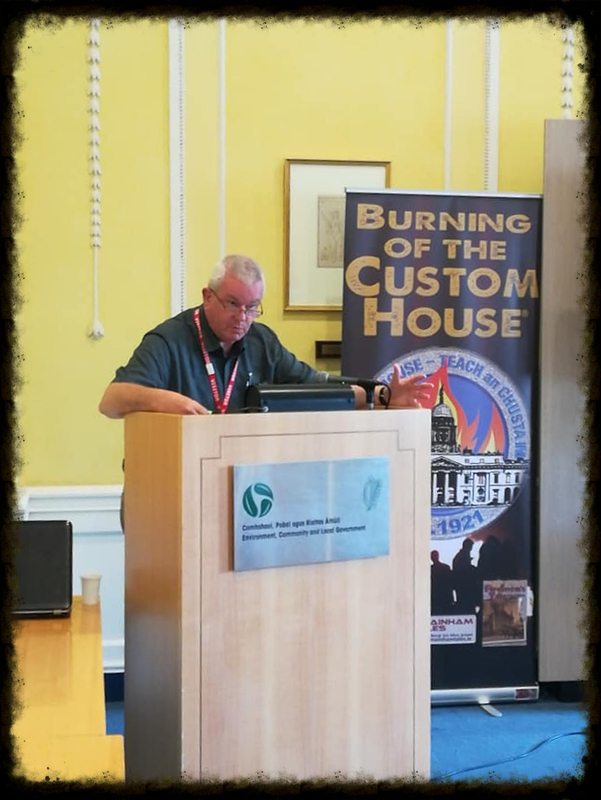 It is never too early to start planning, so this is preliminary call for papers for next year's conference which will be on Saturday May 25th, the exact date when, 98 years before, the Custom House was attacked. 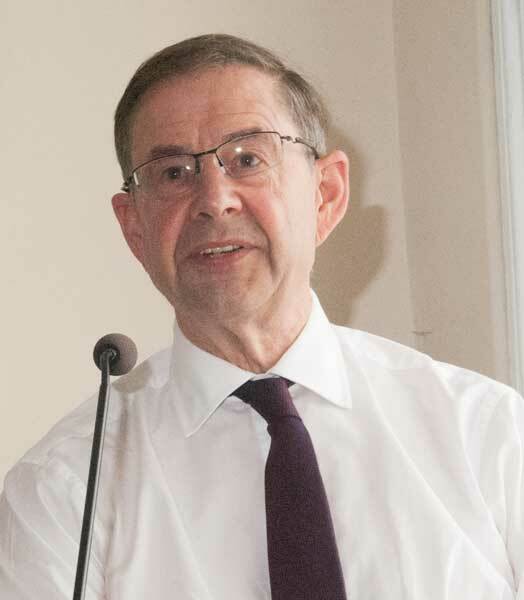 If you have an idea for a paper to present, we'd love to hear from you. At this stage all we want is the outline of the idea in as many or as few words as you think necessary. 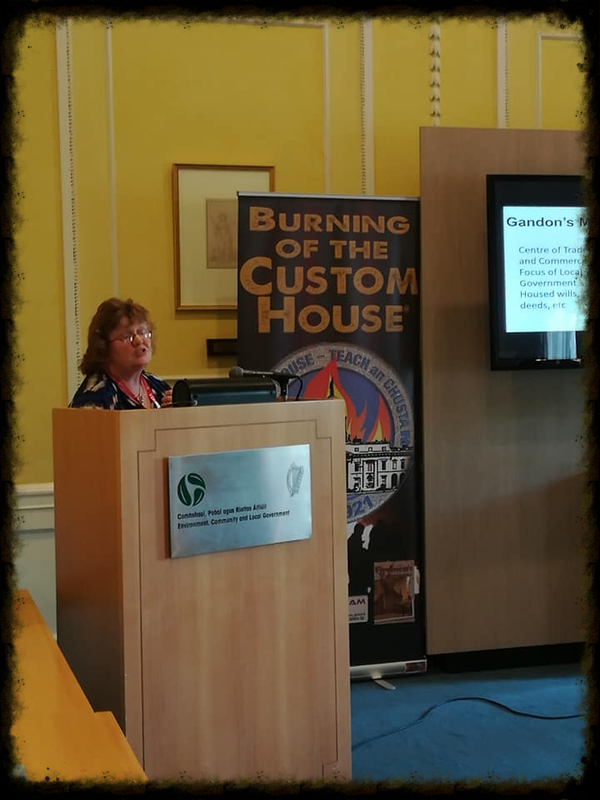 Burning of the Custom House Conference 2019 at editor@annedevlin.ie. 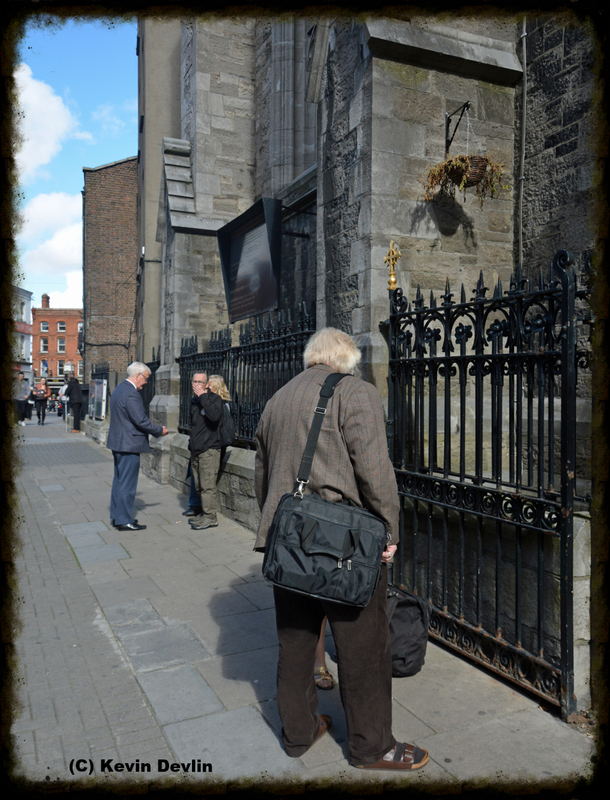 During the 1916 Easter Rising the greatest worries of the Rebels were manpower and weapons. The loss of the Aud with its 20,000 rifles, 10 machine-guns and ammunition had dealt their plans a fatal blow. Now they had to face an enemy with modern rifles, machine-guns and artillery armed only with limited out-dated, clandestinely purchased and, in the case of ammunition and explosives, often hand-made ordinance. 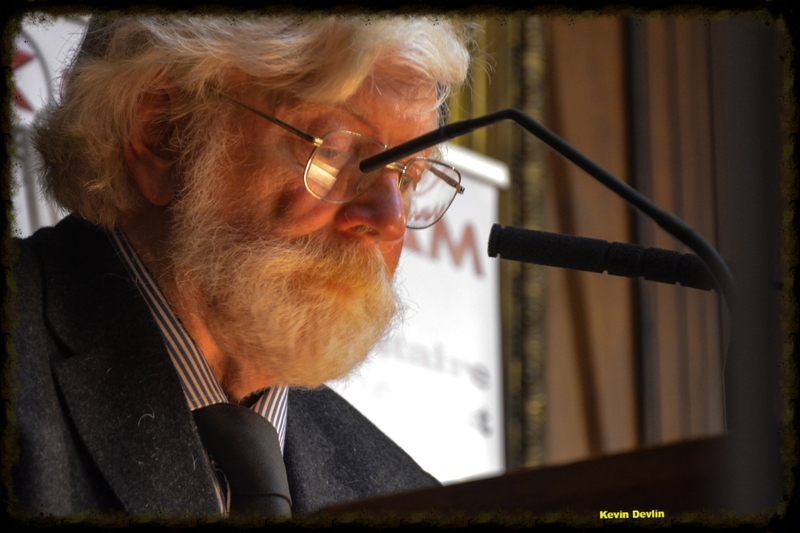 In “Weapons of the Easter Rising” Kieran describes not only their weapons, but those the British Army used in retaliation. 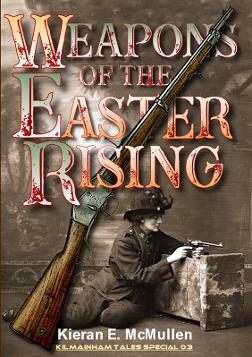 While not claiming to be the definitive guide to every weapon used, this book – copiously illustrated with photographs and illustrations (many of the Author’s own collection of historic weapons) and written with the lay reader in mind – is the ideal introduction to this hitherto overlooked but vital aspect of the Easter Rising, 1916. 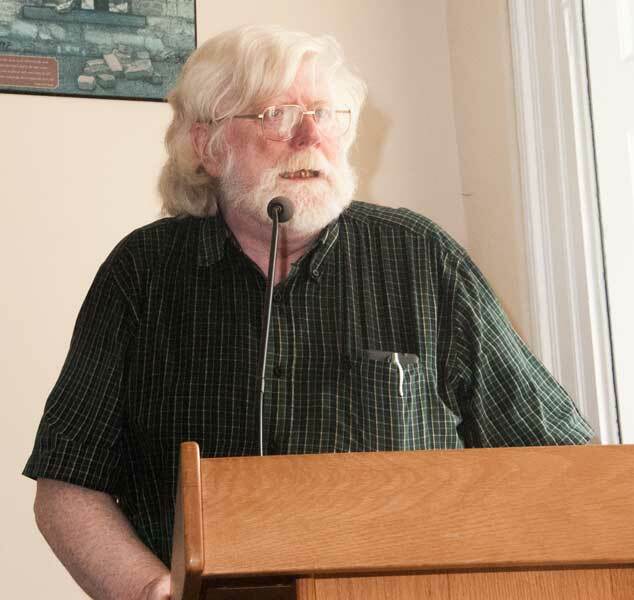 A retired US Army Lt-Col of Field Artillery, veteran of the Korean DMZ and Operation Desert Storm, Kieran McMullen also served 14 years in law enforcement. 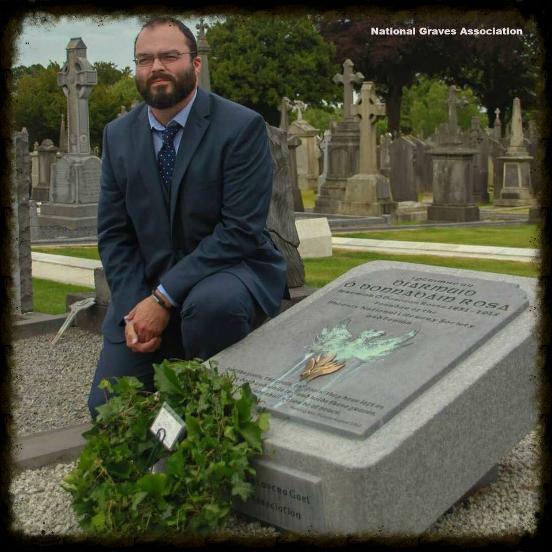 A trained shooting reconstructionist and firearms instructor, he also has a BA in Irish History. 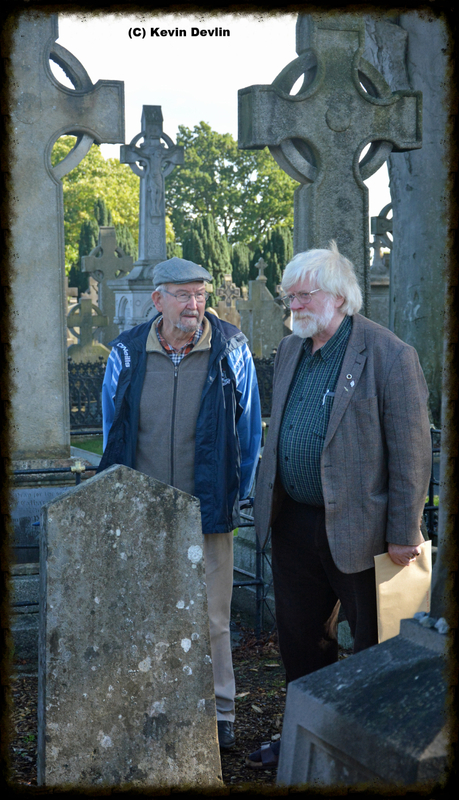 Kieran and his wife Christina have a small farm in coastal Darien, Georgia with horses, chickens, and an Irish Wolfhound, and frequently visit Ireland, where his affinity with the Easter Rising is explained by his recently-uncovered relative, Patrick Murray, who was in the GPO in 1916 and took part in The O’Rahilly’s charge in Moore Street. 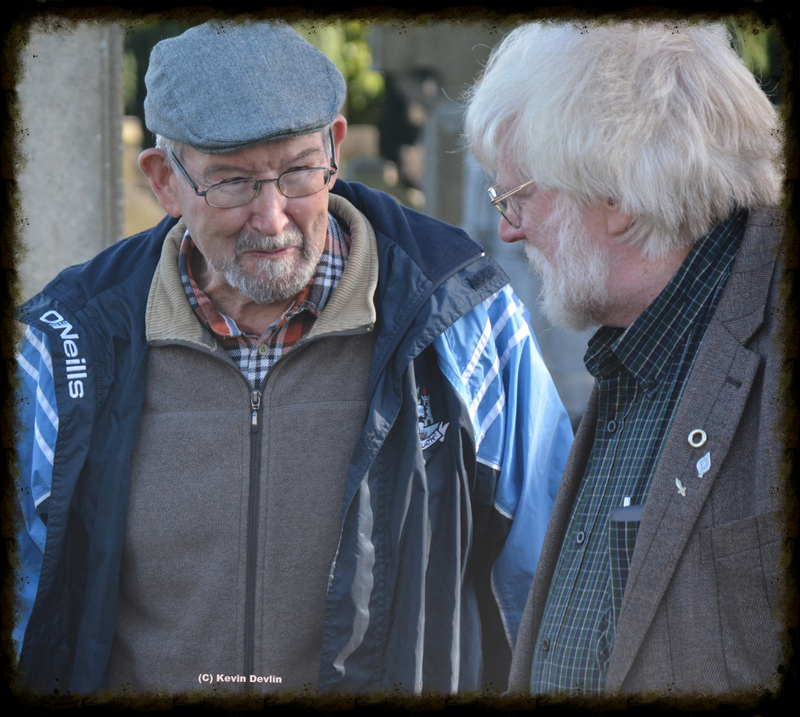 Wounded, he was sent to Frongoch and later fought in the War of Independence. 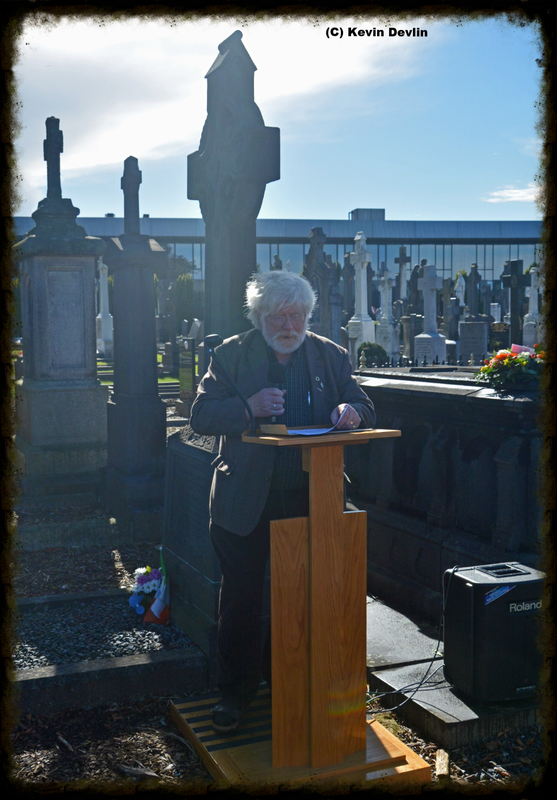 The author of several published works of fiction including "Sherlock Holmes and the Irish Rebels". 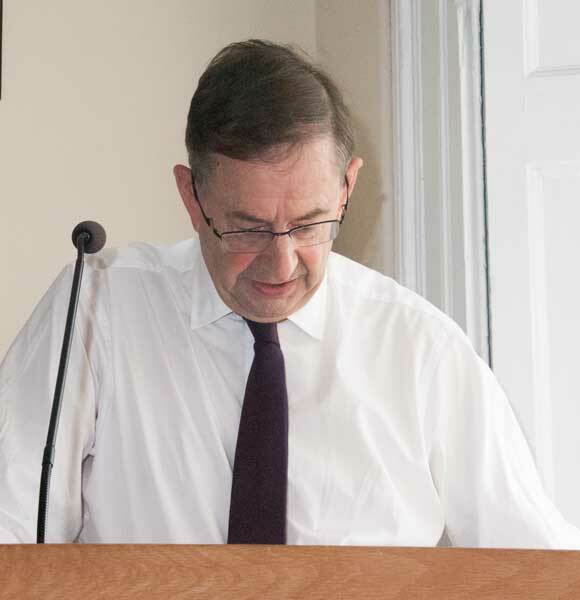 In “Weapons of the Easter Rising”, Kieran has drawn on his encyclopaedic knowledge of historical weapons to produce an accessible and comprehensive overview of the weapons used in the struggle to create a free and independent Ireland. 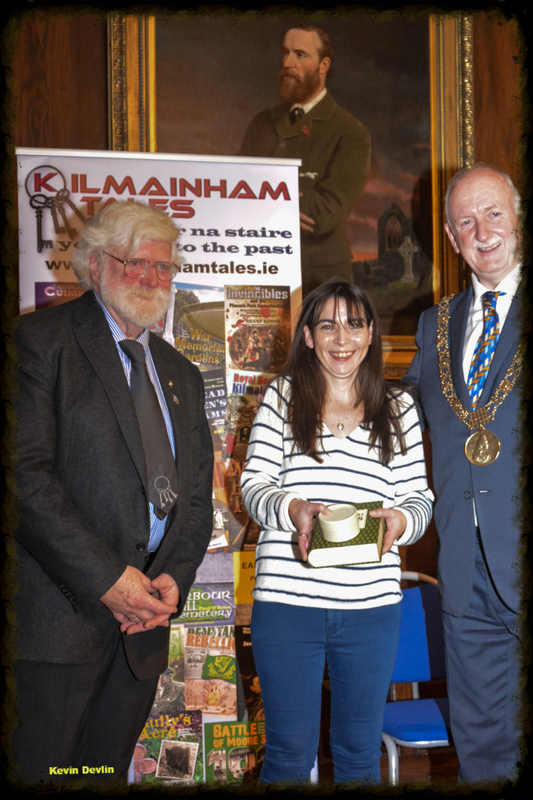 Our latest publication in the Kilmainham Tales series - No. 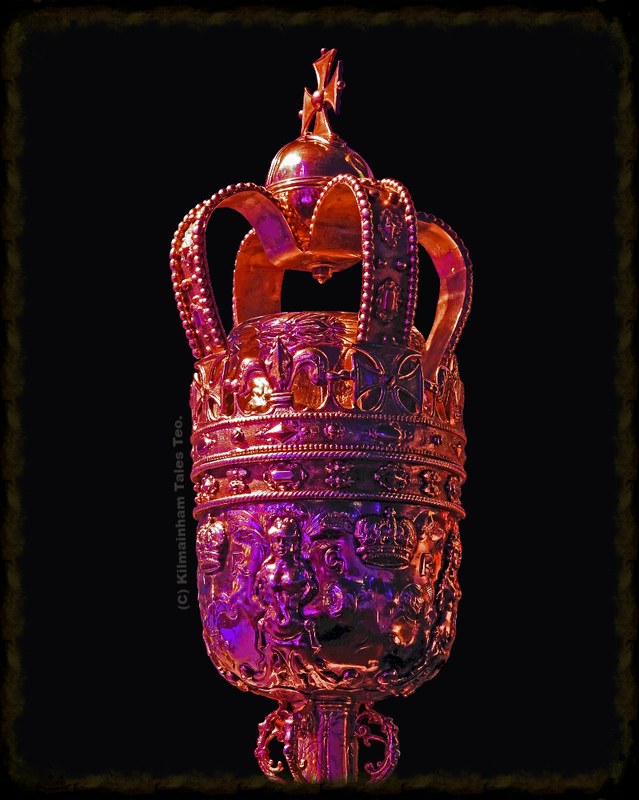 18 - was published on Saturday 24 February 2018. 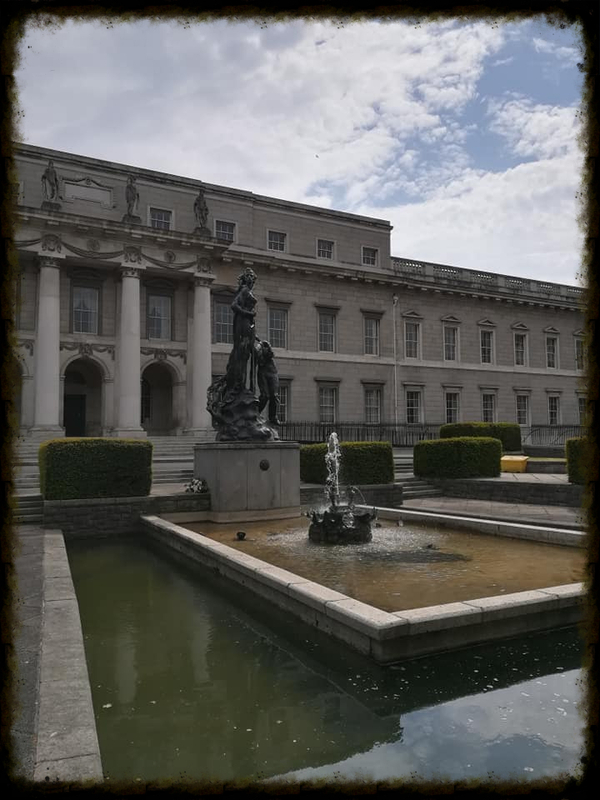 Titled "The Irish National War Memorial Gardens", it tells the history of this beautiful memorial to the almost 50,000 who died in WW1. 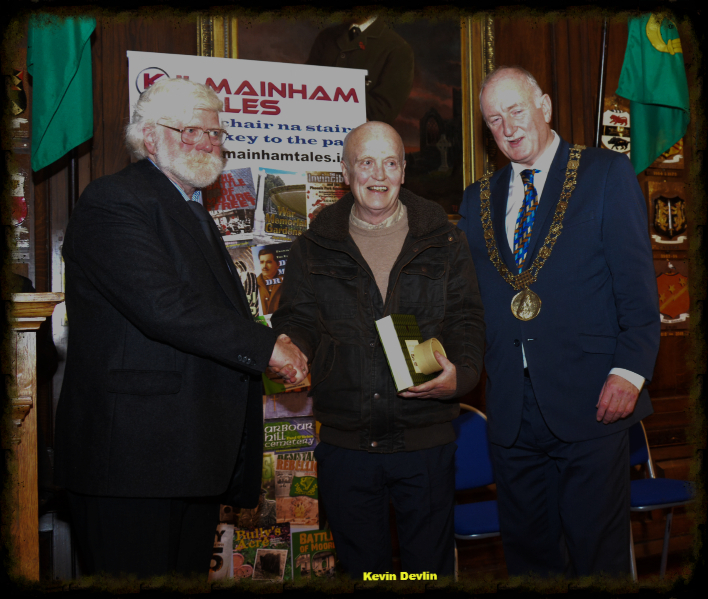 The book is written by acclaimed military historian Paul O'Brien, and is his fourth title in the Kilmainahm Tales series. 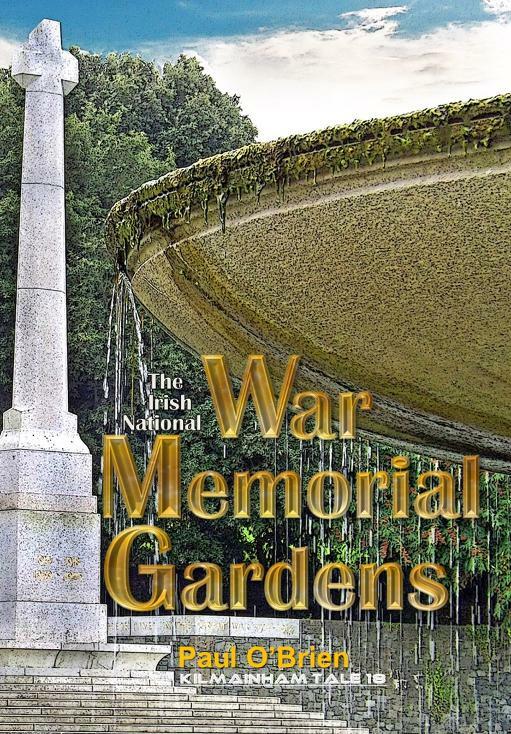 This is the first ever history of this iconic memorial, recognised world-wide as one of the most impressive and beautiful War Memorials. 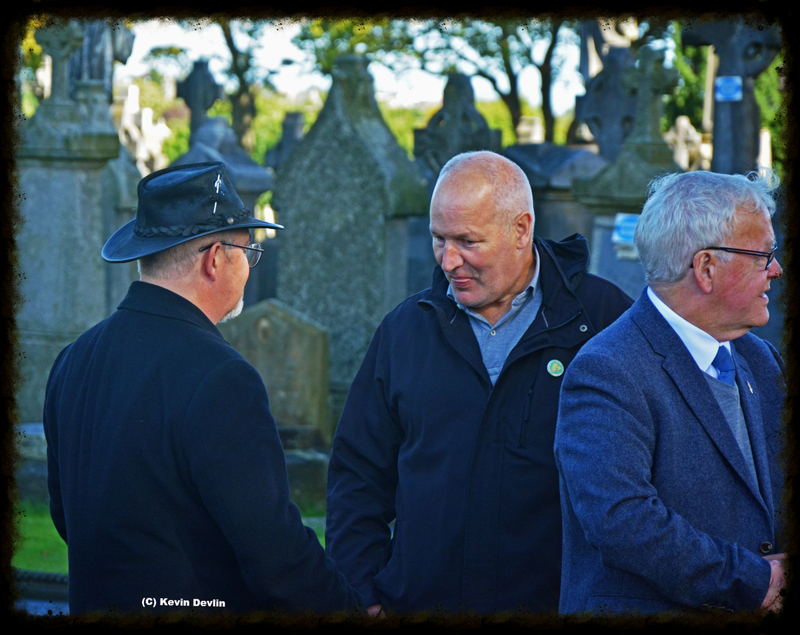 Designed by renowned designer Edwin Lutyens, the Memorial site is a place of rest and beauty, and hosts annual commemorations for these fallen Irish. 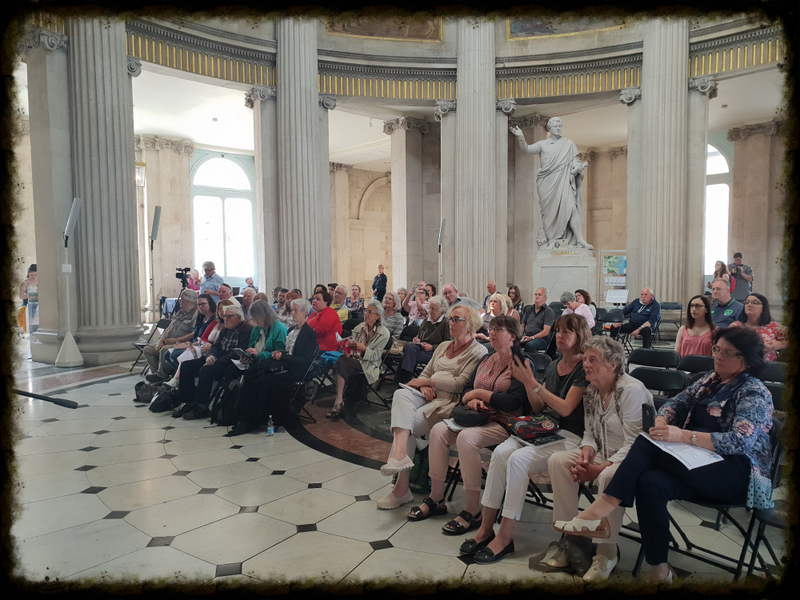 The book will shortly be available in major Dublin bookshops, including Books Upstairs, Hoddges Figgis, and Alan Hanna, and is now available on our website here at €6 plus post and packing. At last, our 2018 Catalogue is ready and you can access it online Here. 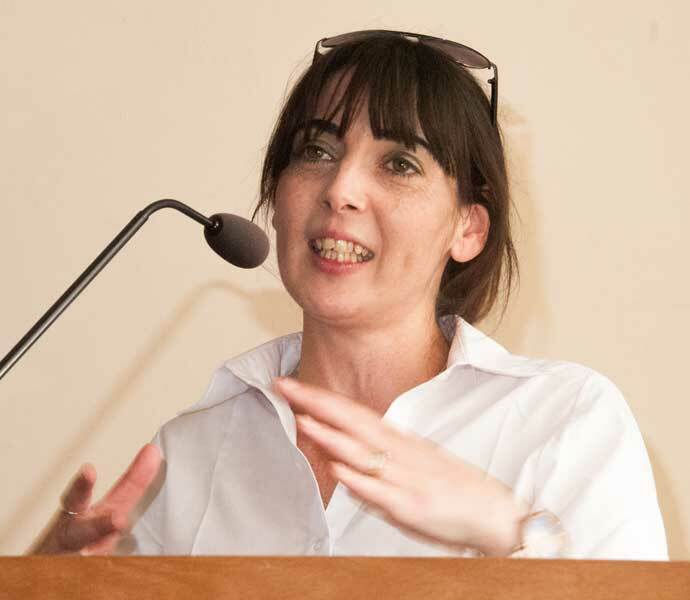 In it you will find details on all our publications to date, and some information on publications to come. 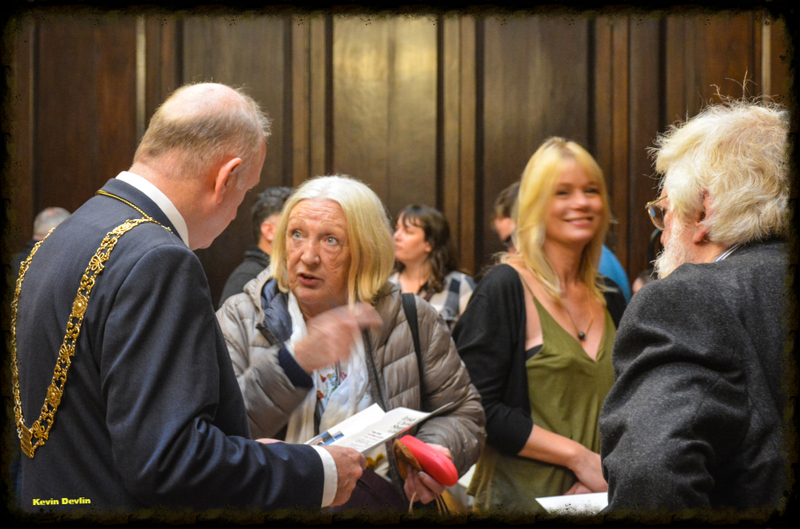 Please note that the catalogue will be updated as our plans evolve, so it is worth checking back occasionally. 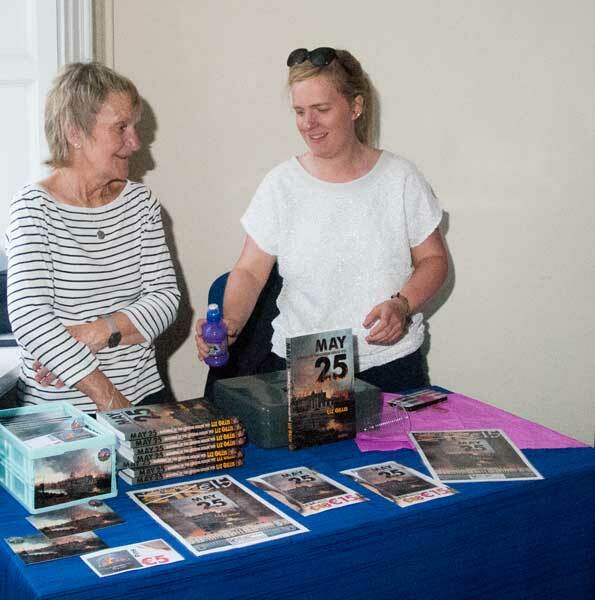 Any book in the catalogue is available from this website. Simply click on the link "Publications" at the top of any page and select from the drop-down list for the book of your choice. 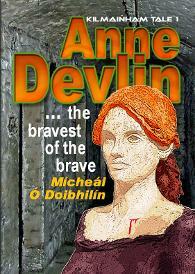 Kilmainham Tales started in 2008 with just one book - "Anne Devlin, bravest of the brave". 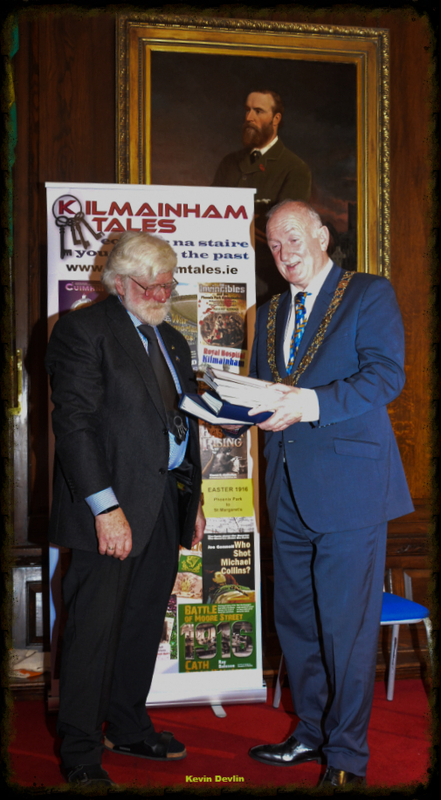 One of our slimmest books, it had just 32 pages and cost €5. 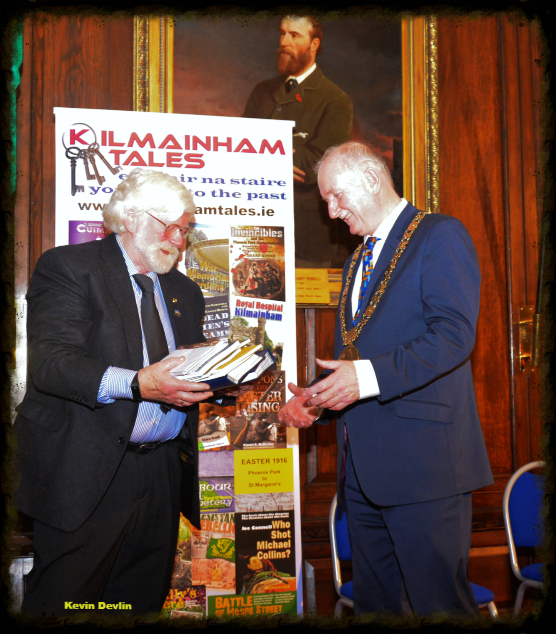 We never imagined in 2008 where we would be 10 years later but if you peruse our catalogue (see above) it shows our list consists of 17 of the original Kilmainham Tales books and three full, conventional paperbacks by some of the best historians and writers available. 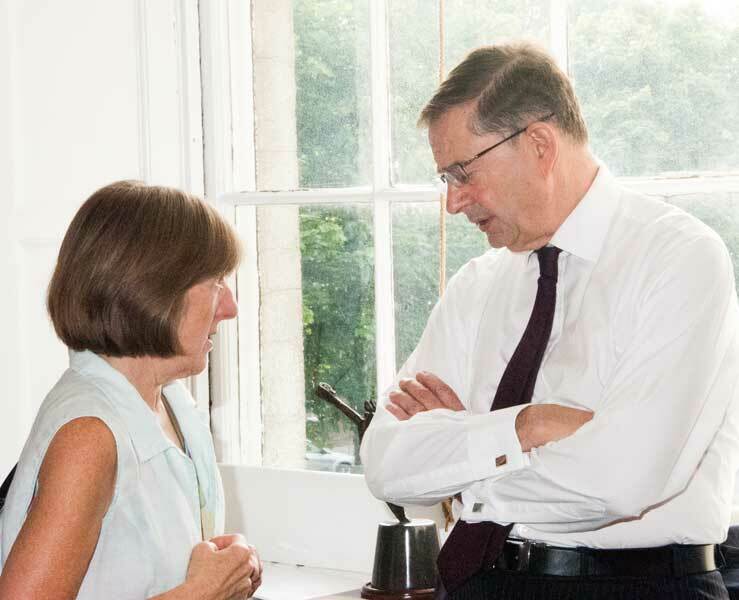 We have been delighted with the support and encouragement we have received over the decade since we began, and look forward to your ongoing support. 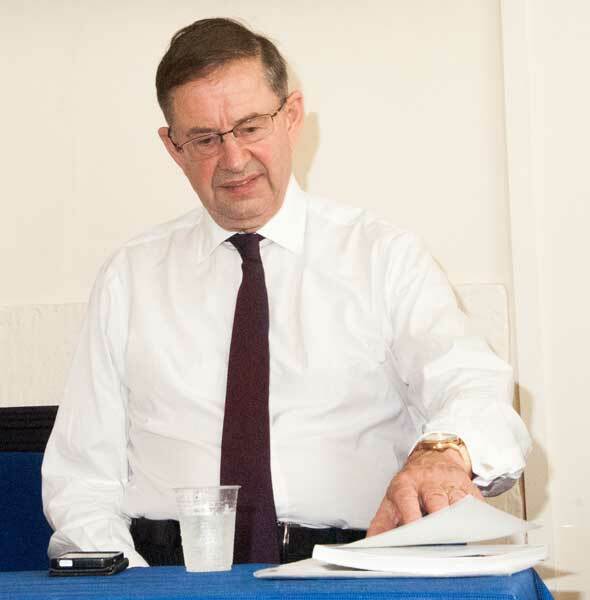 However, it was a struggle even in 2008 to get the price down to a fiver, and since then there have been increasing costs, in particular printing. Yet we never raised our prices, even as these costs spiralled. Finally, however, we have reached the point where we cannot hold our prices any longer and must increase the original series from €5 to €6 per copy. Yes, we know this is 20%, but that equates to just 2% per year, and is only €1, but it means a lot to us and hopefully will help us to continue publishing these books. 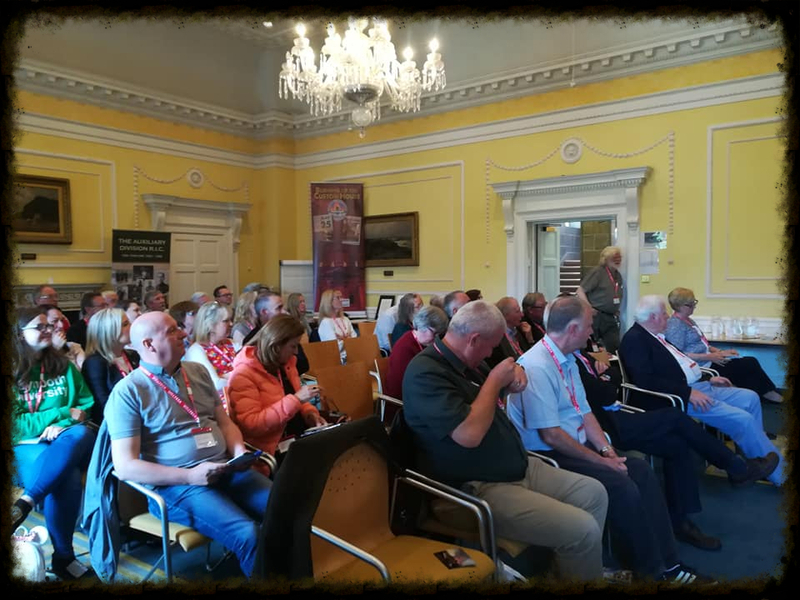 A glance at our catalogue will show our plans for some very interesting books well advanced, and there are another 20 or so books we are in discussion with the authors about including, hopefully, a series on the prisons of Ireland, of which the Wicklow book is only the beginning. However, as this increase may have been unexpected, we have agreed to defer it until the end of January. 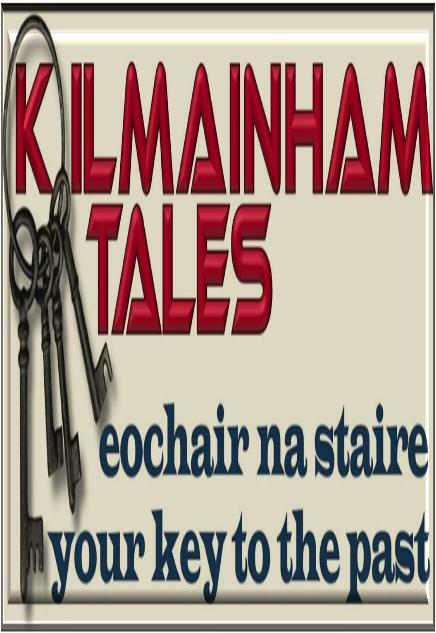 So, for anyone buying an original series Kilmainham Tales book through this website in January, the price will be €5 per copy. From 1 February 2018, however, that will increase to €6. So, buy now and save 20%! 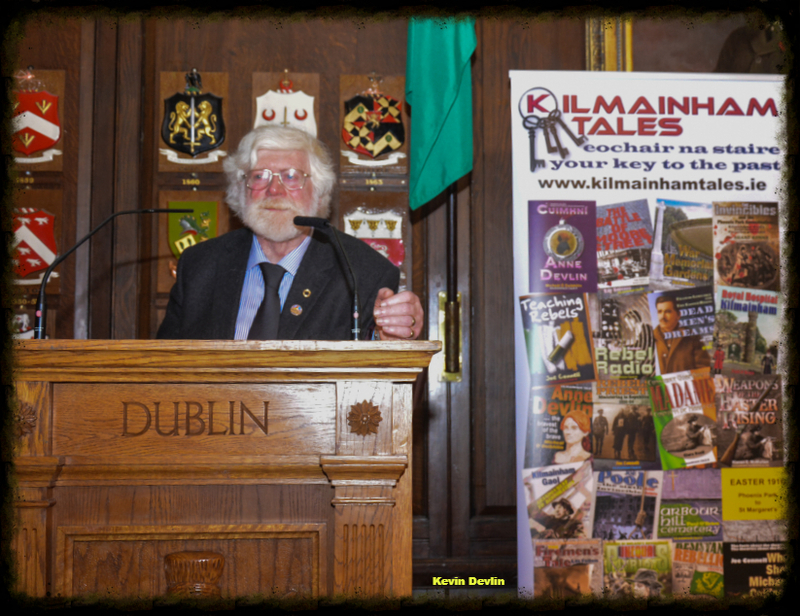 Note that this increase only applies to the Kilmainham Tales Original Series. 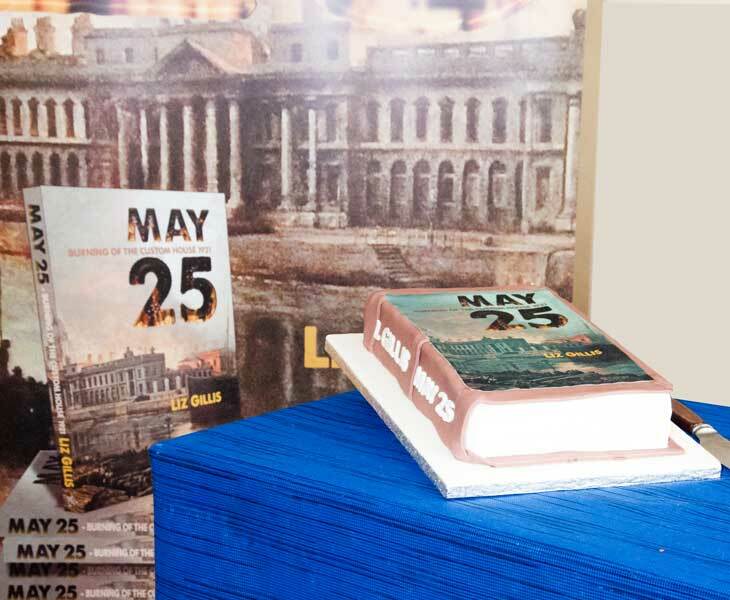 All other books from us, including the marvelous "MAY 25 - burning of the Custom House", and our latest "1916 - Battle of Moore Street/Cath Shráid Uí Mhórdha" - remain as before. 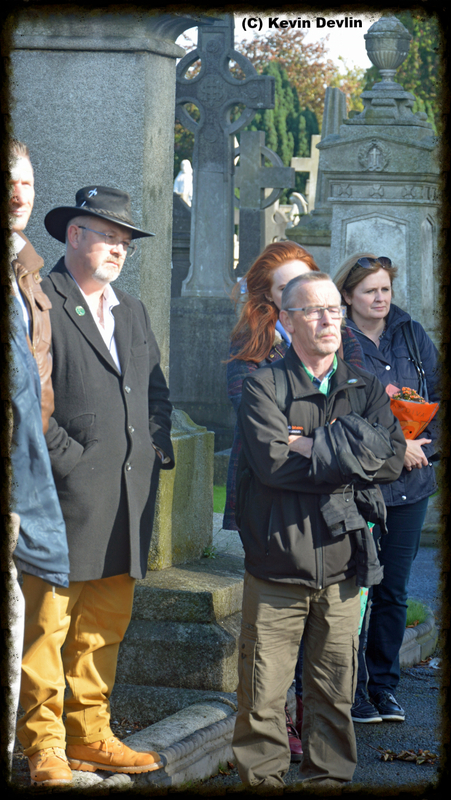 A bi-lingual history of the final battle of the Easter Rising in the words of those who were there. 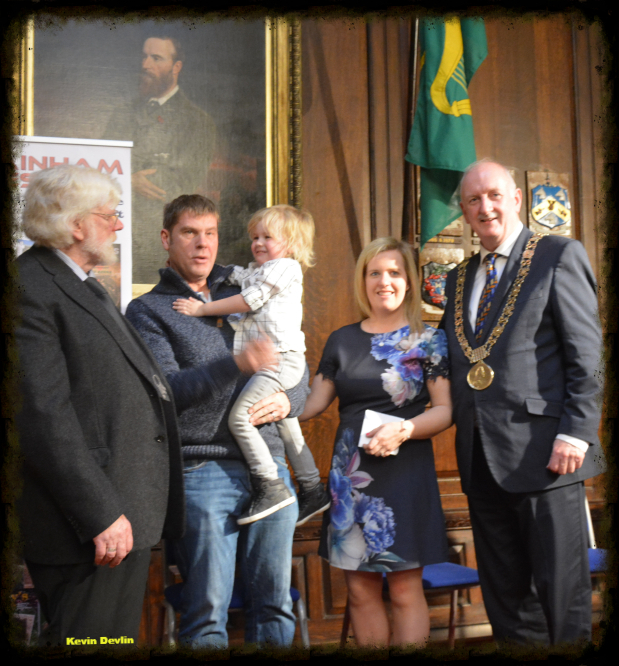 Stair dhá-theangach chath deiridh Éirí Amach na Cásca i bhfocail iad siúd a bhí i láthair. 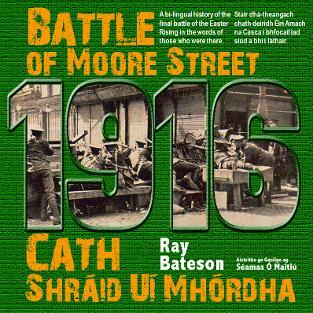 "To give a relatively small street in Dublin's City Centre the title of "Birthplace of the Republic" may seem audacious, bold or even brazen, but anyone who reads Ray Bateson’s account of Moore Street and its pivotal role in the 1916 Easter Rising cannot but be convinced, not only that the title is justified, but that the story of Moore Street must take its rightful and prominent place in our history, especially when the 1916 Rising is being discussed". So wrote Cllr. 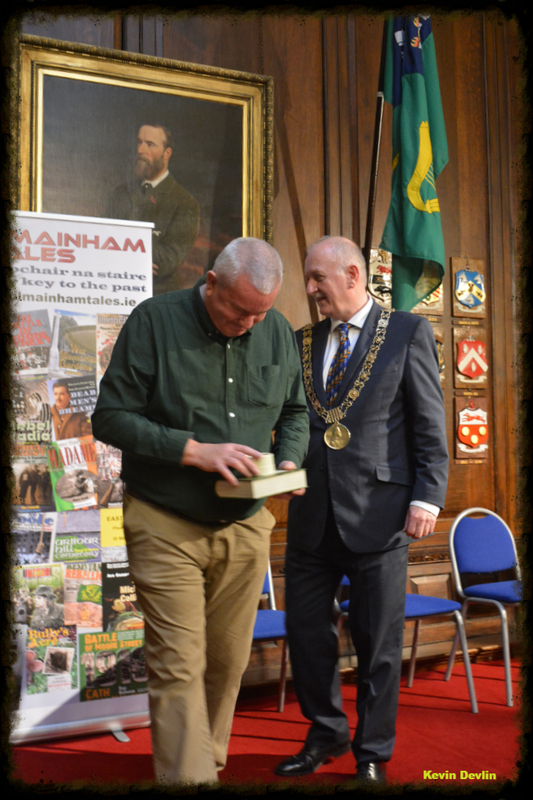 Nial Ring, in the Introduction of this unique book launched in Dublin's iconic Mansion House by Lord Mayor Mícheál Mac Donncha on December 11th. 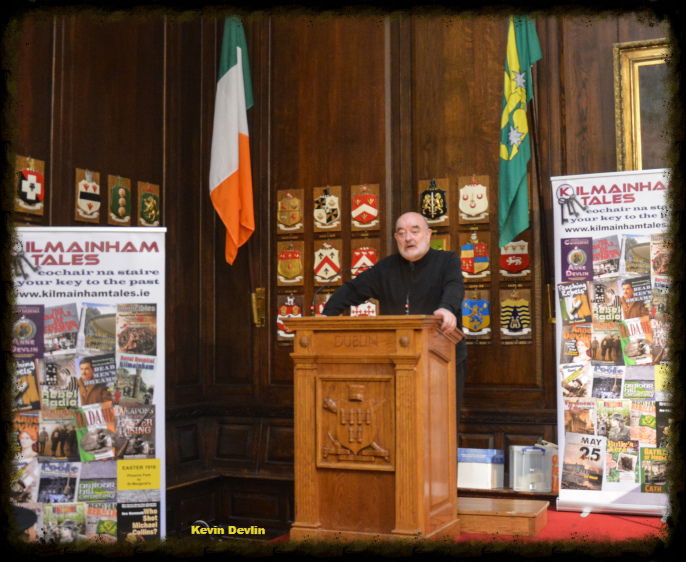 Read more here, and/or buy the book (at €12.50 per copy) here. 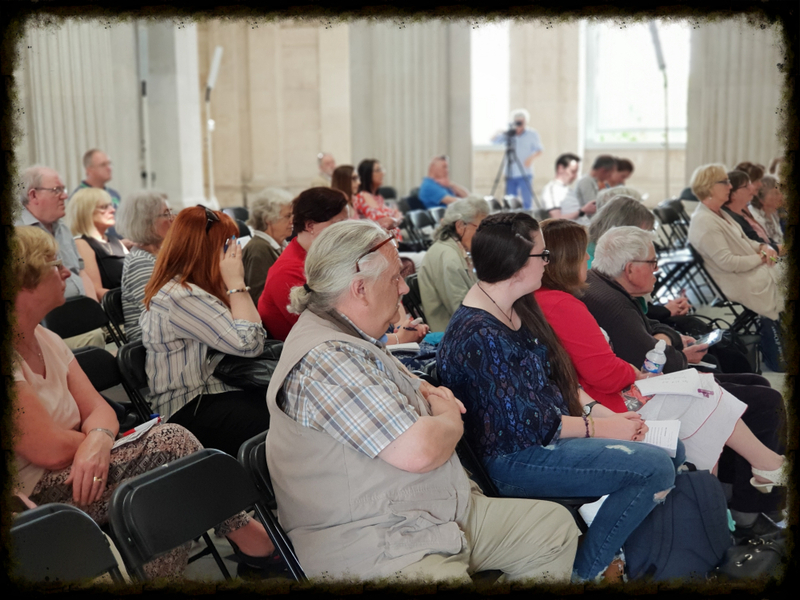 "B’fhéidir go mbreathnaíonn sé dána, dínáireach fiú, an teideal “Áit Bhreithe na Poblachta” a thabhairt ar shráid sách beag i mBaile Átha Cliath. 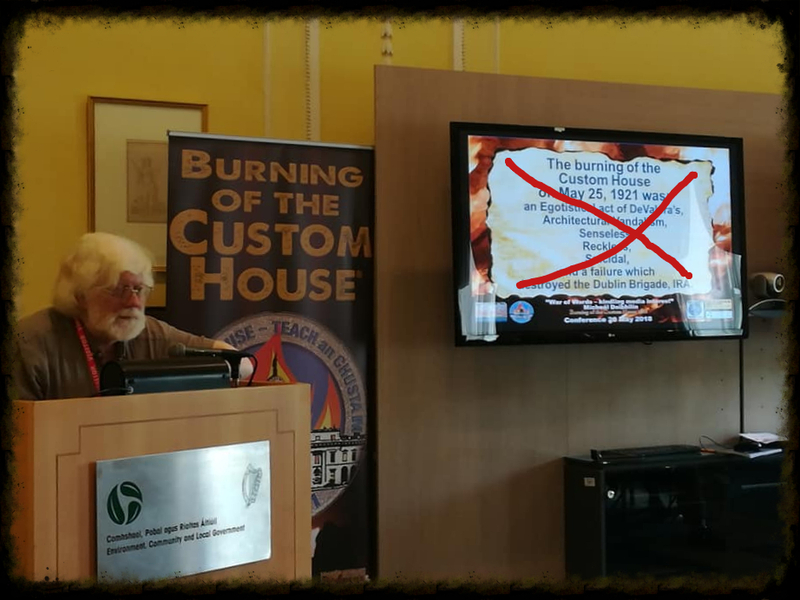 Ach duine ar bith a léann cuntas Ray Bateson ar Shráid Uí Mhórdha agus an pháirt lárnach a bhí aige in Éirí Amach 1916 ní fhéadfadh sé ach a chreidiúint go bhfuil ní hamháin an teideal cóir, ach gur cheart do Shráid Uí Mhórdha á háit cheart thábhachtach a ghlacadh sa stair, go háirithe nuair a bhíonn Éirí Amach 1916 á phle". 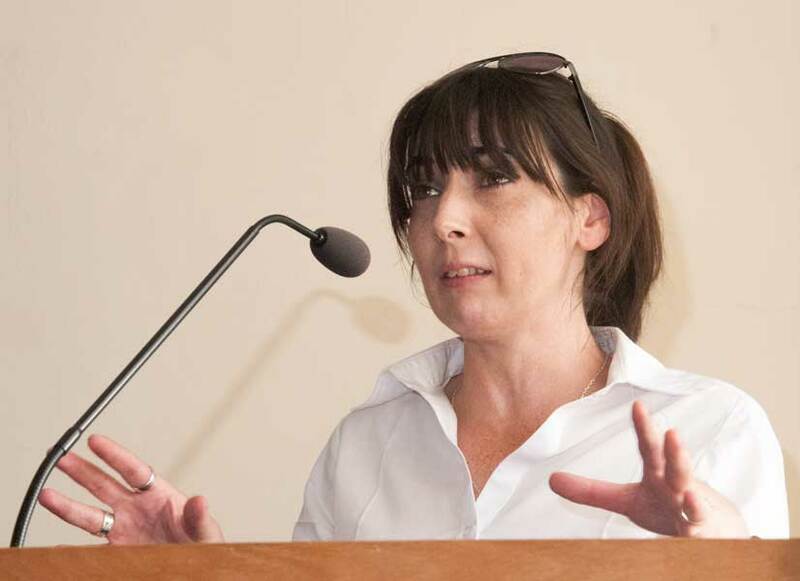 Sin a scríobh Cmhrlr. 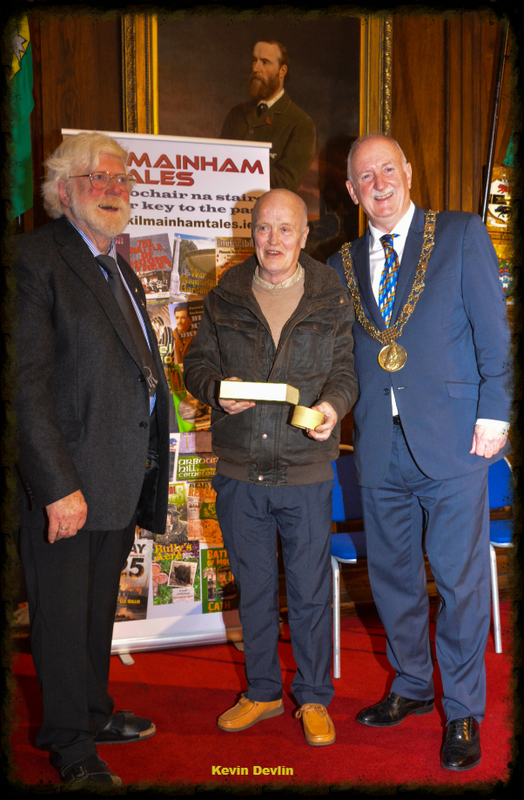 Nial Ring ina Réamhrá do'n leabhar sainiúil seo a sheol Árd Mhéara Bhaile Átha Cliath Mícheál Mac Donncha ina theach íocónach féin ar 11u Nollaig. 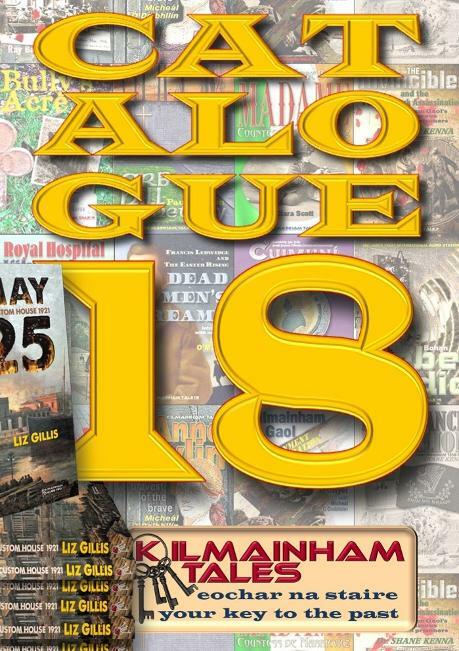 Léigh tuille anseo agus/nó ceannaigh an leabhar (ar €12.50 an cóip) anseo. 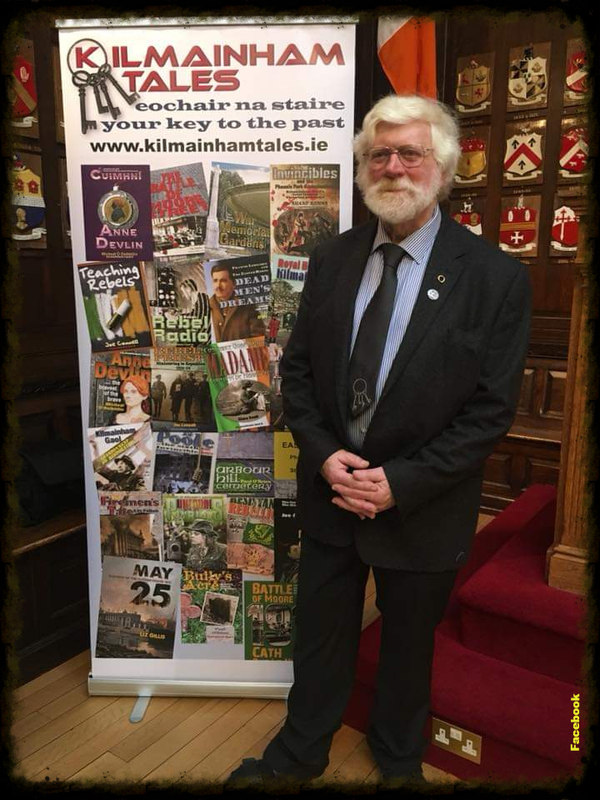 Éist le foilsitheor Mícheál Ó Doibhilín ag labhairt faoi an leabhar seo agus an scéal taobh thiar de'n leabhar seo ar an clár raidió "An Chearta" a craoladh ar Raidio na Gaeltachta anseo. 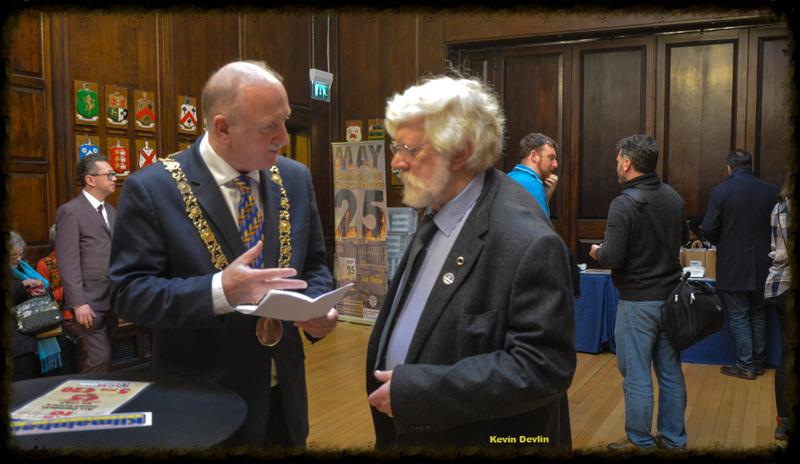 Craoladh seo ar Domhnach 14 Eanáir 2018. 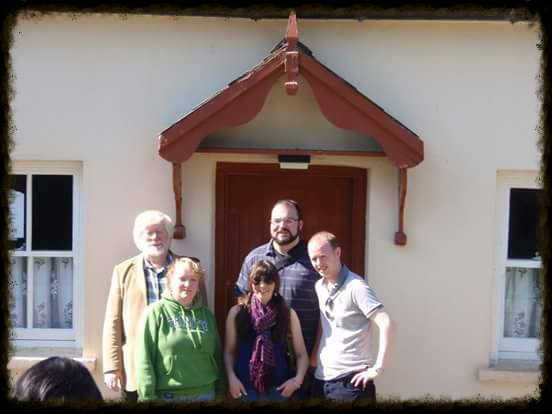 Sé An Cheárta clár ealaíona seachtainiúil RTÉ Raidió na Gaeltachta, léirithe agus láithrithe ag Cearbhall Ó Síocháin. Domhnach 1.15in. 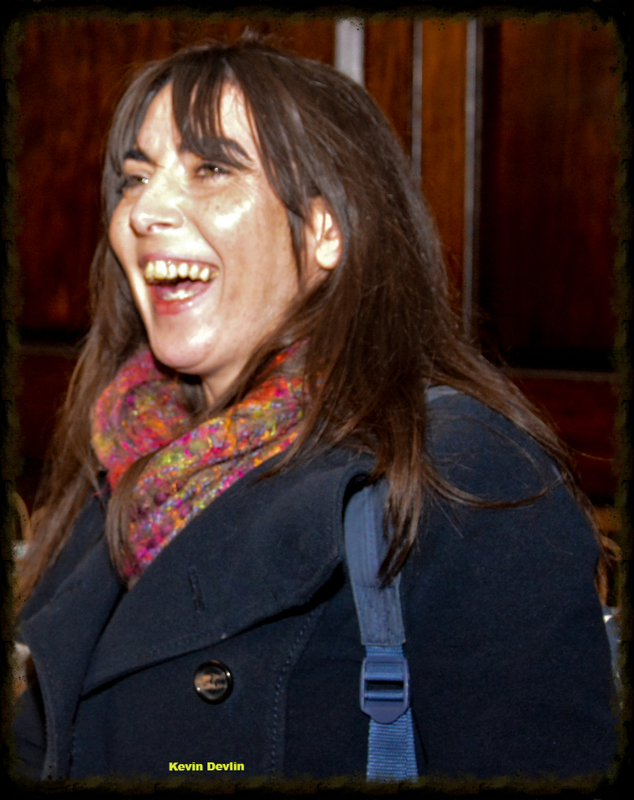 An Cheárta is RTÉ Raidió na Gaeltachta's weekly arts programme, produced and presented by Cearbhall Ó Síocháin. Sunday 1.15pm. 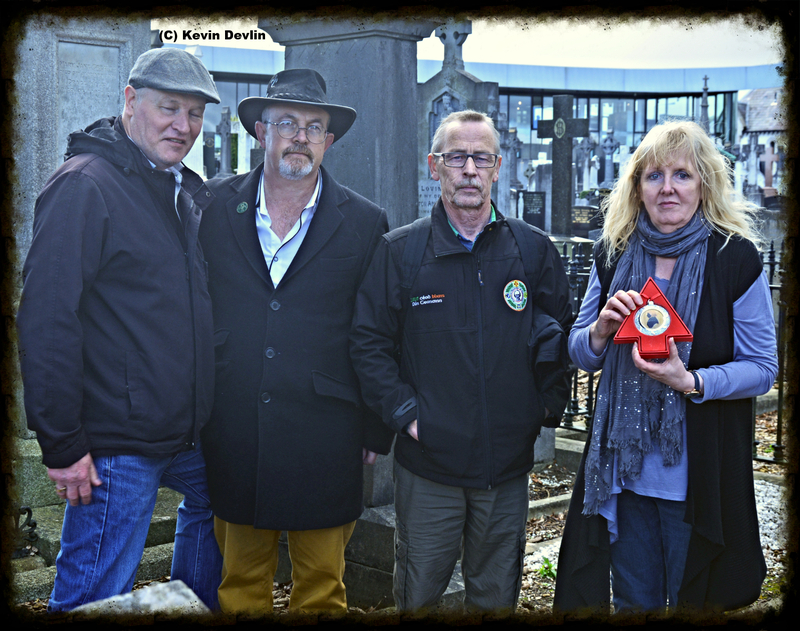 To commemorate the life of Anne Devlin, one of our greatest heroes and first female political prisoner, Cuimhní Anne Devlin commissioned this beautiful plaque from Artist Joram (“Jerome”) Drori and cast by him in his workshop and bronze finished in a limited edition of just 71 - one for each year of her life. 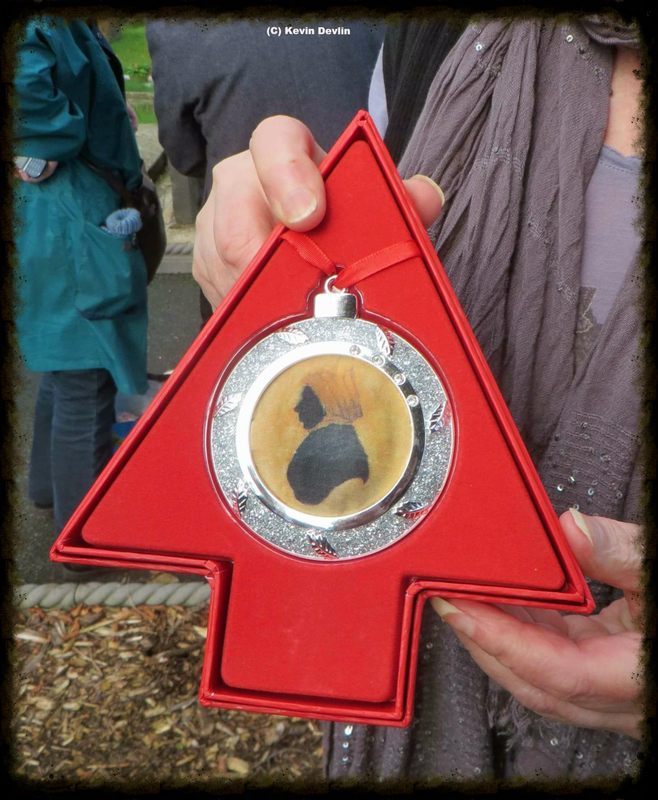 Now you can be the proud owner of this limited edition tribute to a great Irish patriot. Click here for further details. 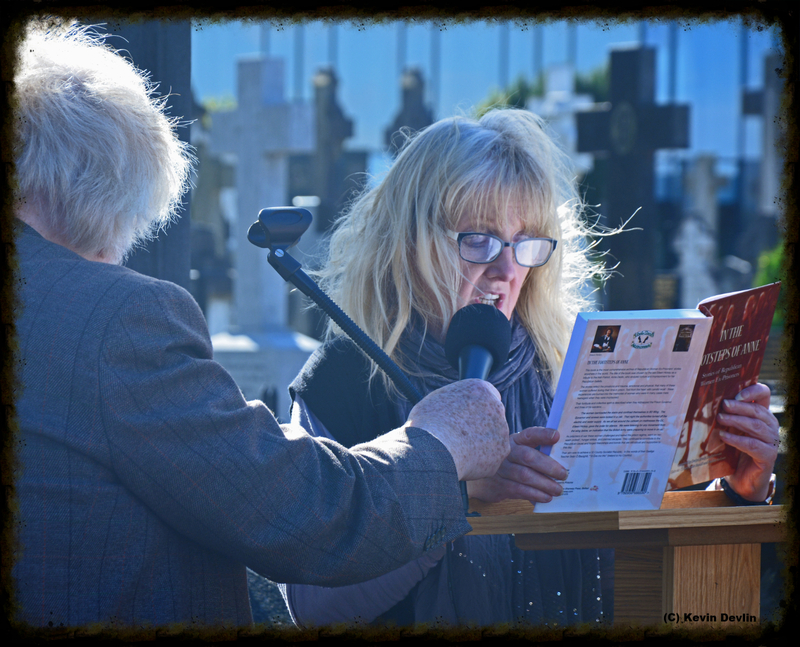 This year's commemoration of Anne Devlin was a huge success. 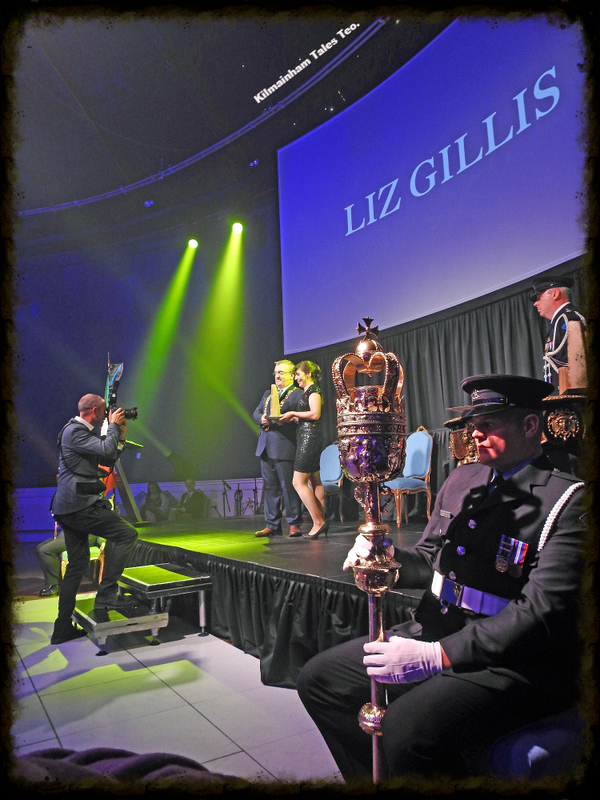 Our biggest crowd to date (with many new and old friends), a great guest speaker, a terrific new song, a guard of honour of pikemen, coupled with incredibly good weather - all combined to ensure that a wonderful lady and Irish hero was remembered as she should be. 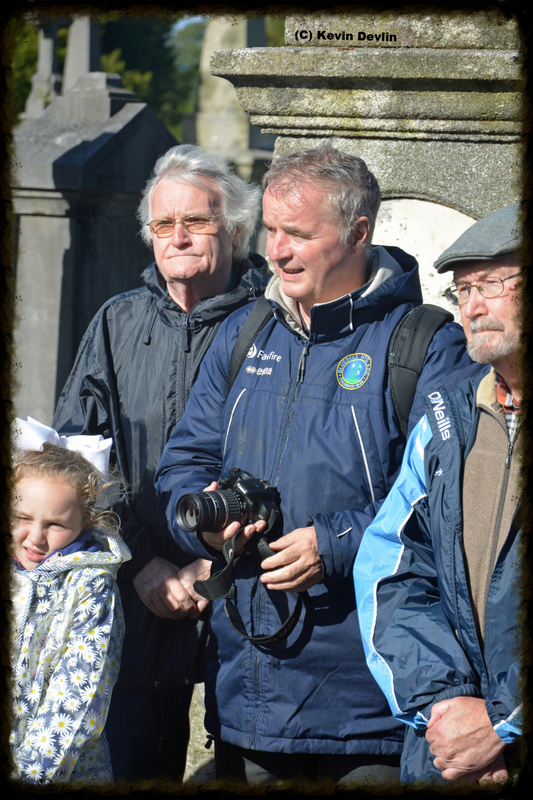 Our thanks go first to the priests of St. Catherine's Church in Meath Street for facilitating us in the initial part of our ceremonies. 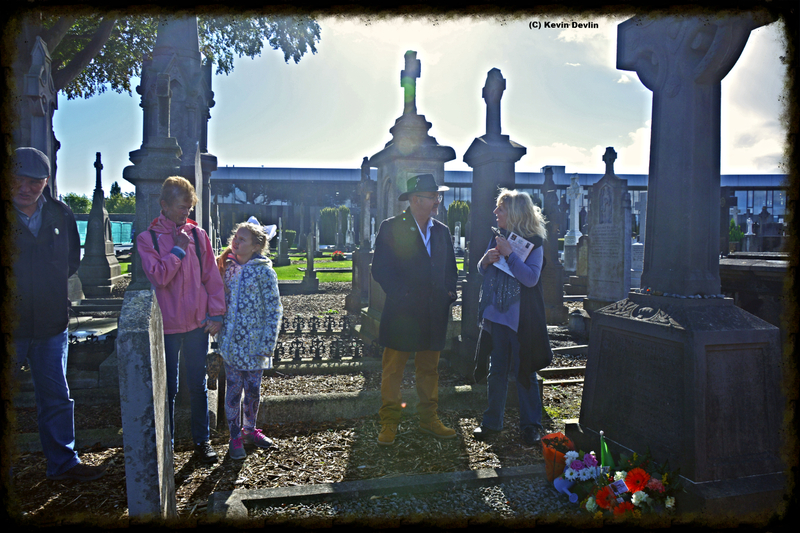 A big thanks must go to Glasnevin Cemetery and the staff there for facilitating us so willingly and well. 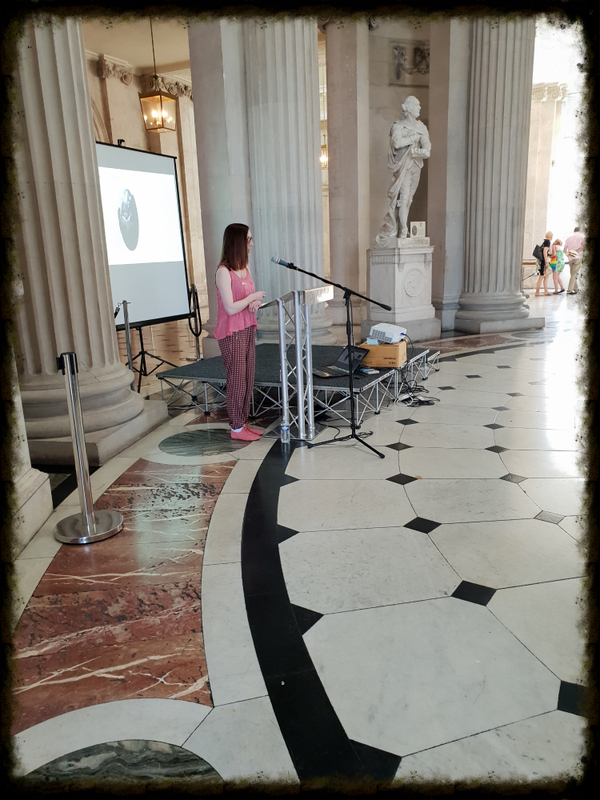 Historian and author Helen Litton was the Guest Speaker and spoke well and a length of Anne before laying the Commemorative Wreath on her grace. 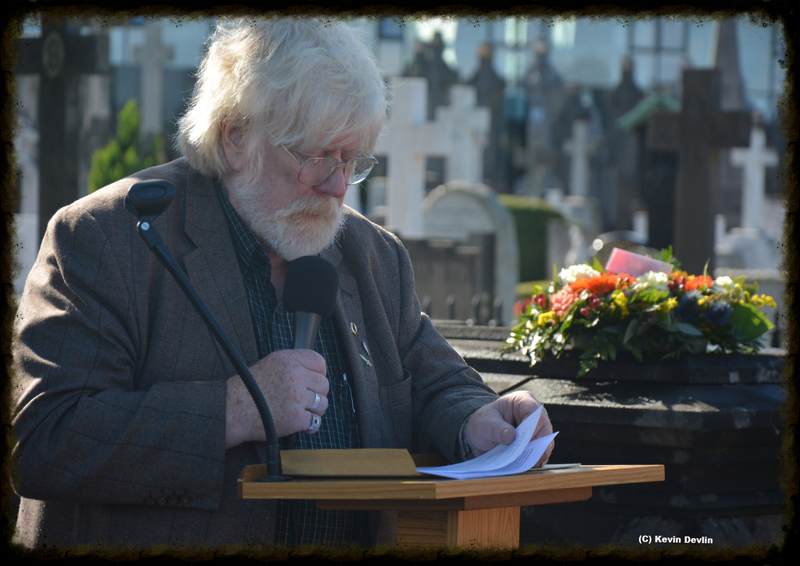 Frank Callery sang the song he had composed specially for Anne, and received rapturous applause before also laying a wreath. 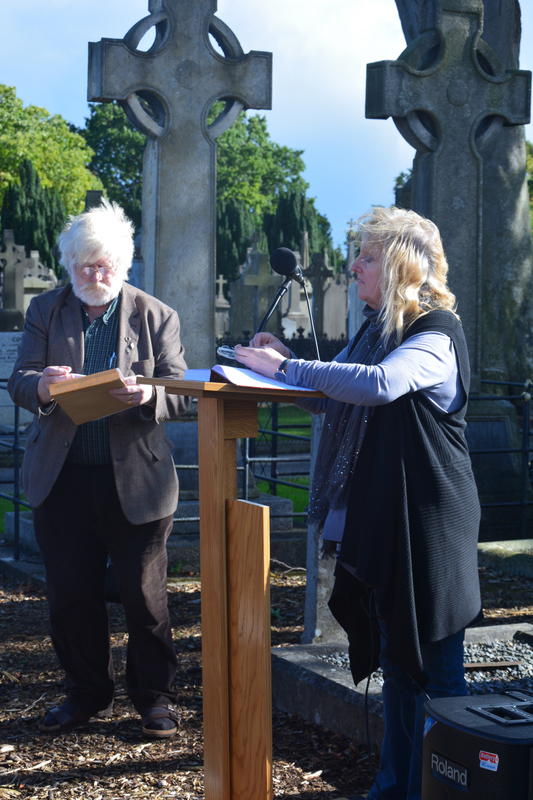 Ó Doibhilín also paid tribute to Anne and chaired the proceedings. 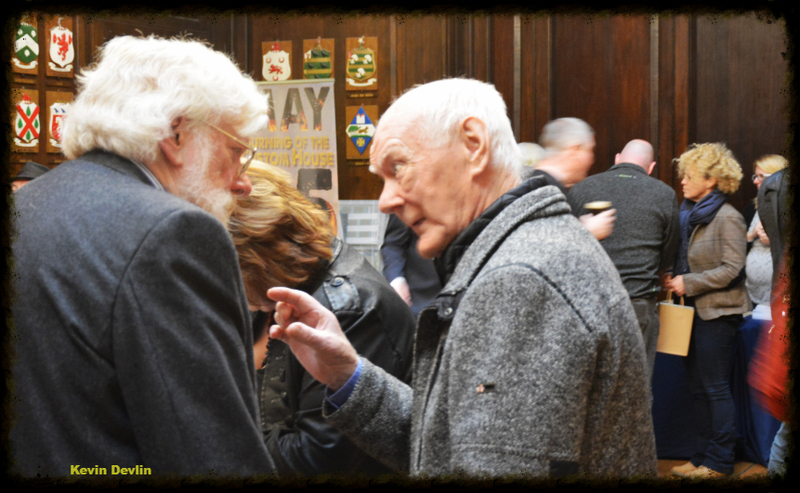 Light refreshments in the Cafe allowed us to chat and get to know one another afterwards. 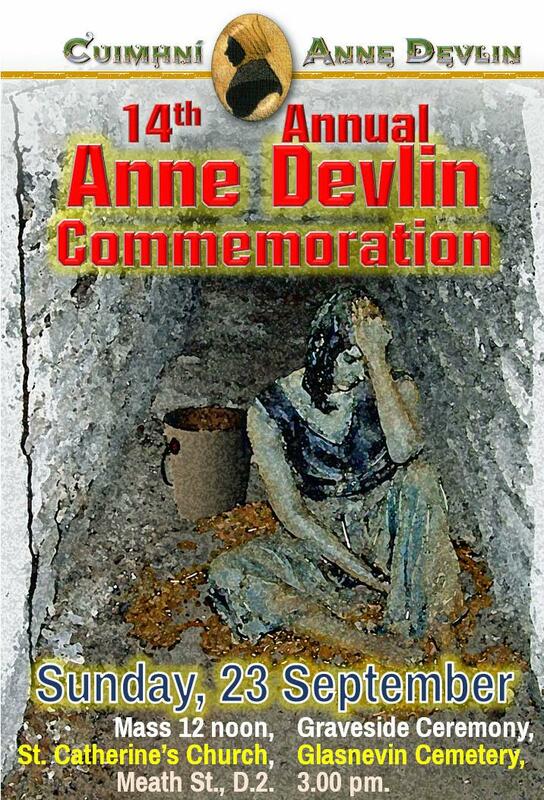 On September 18, 166 years ago, Anne Devlin was buried, after 48 years’ struggle against the mightiest empire in the world. 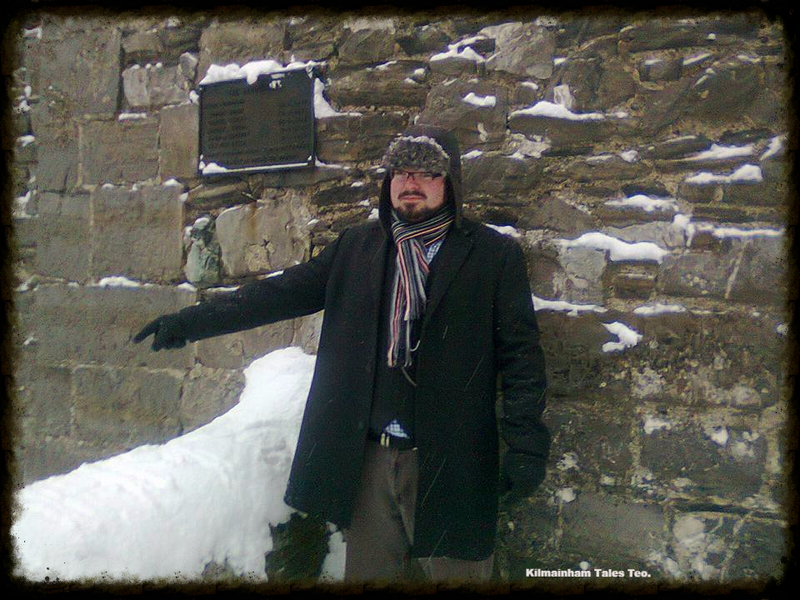 because she had been abandoned by those she was protecting, those involved in Robert Emmet’s failed 1803 Rebellion. because she was widowed, ill, unable to work and unsupported by the so-called Republicans she protected. 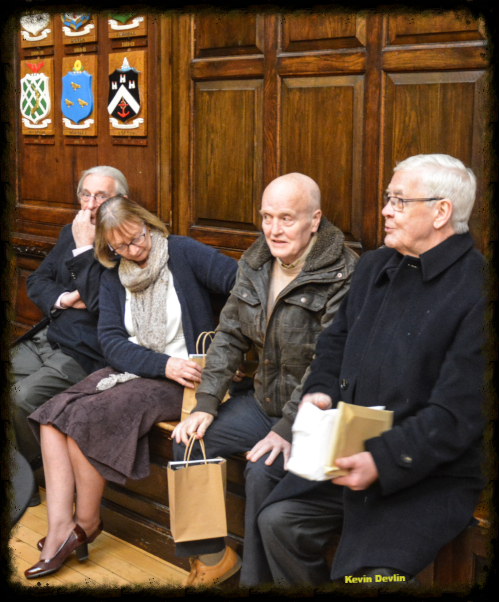 because she was still suffering – after 45 years – the effects of her time as a “guest of the nation” in Kilmainham Gaol, and the evil attention of Dr. Edward Trevor. 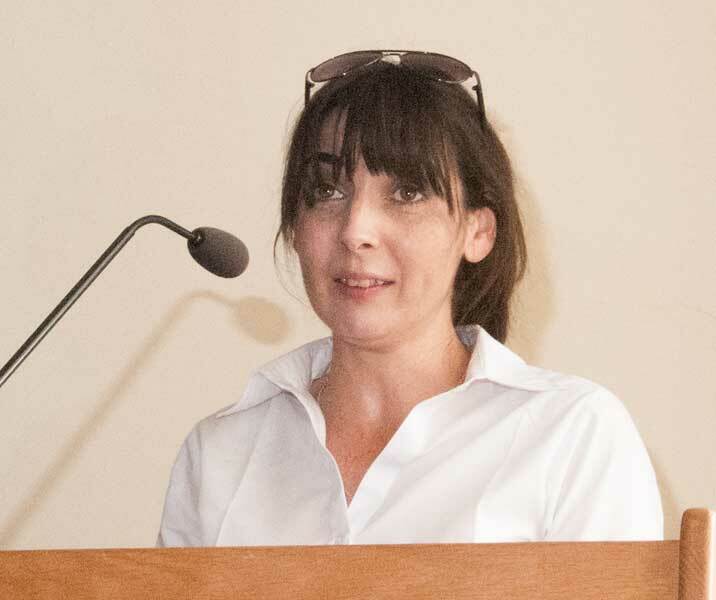 because the Administration deemed her so dangerous a policeman followed her everywhere, every day of her life, from the day she was released from prison so that she could not collude with anyone, and those who might speak to her were marked as ‘Trouble’ and interrogated. because only she was brave enough to resist the British Empire and refuse its bribes and ignore its tortures. 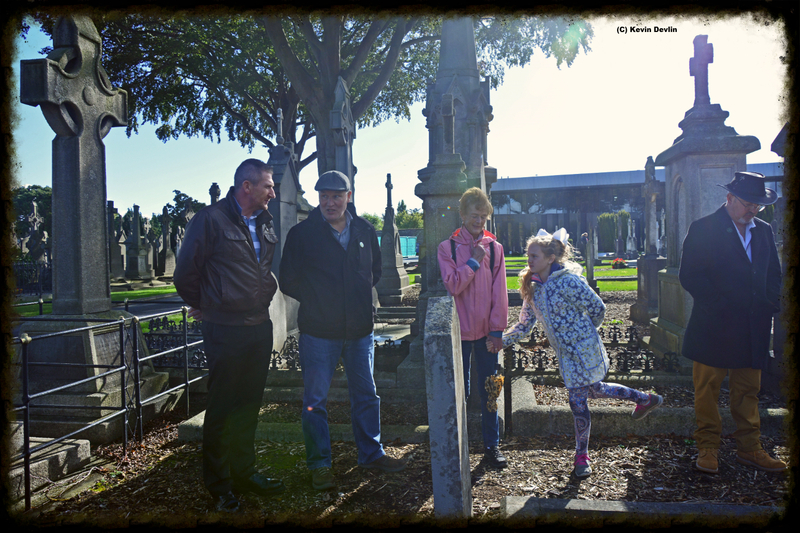 because she spent her last money honouring her faithful husband by buying him a grave in Glasnevin and, unable to work due to rheumatism and erysipelas, she had pawned every stick of furniture, every rag, for a few crumbs of bread. because no-one wanted to be seen to be associated with her. 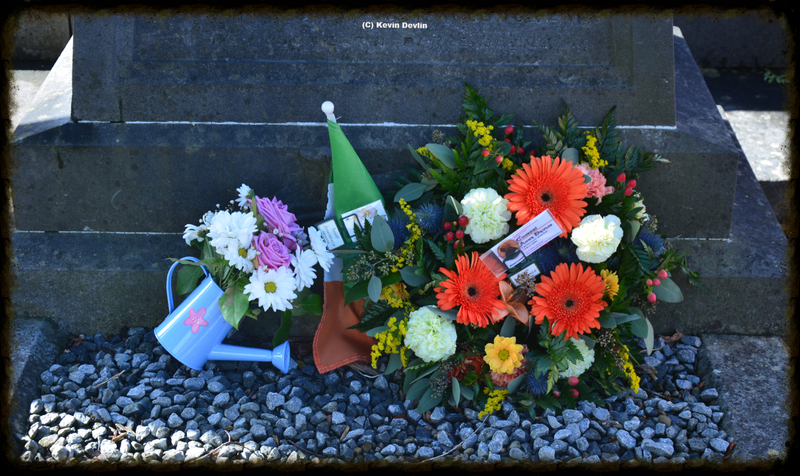 because she stood, alone, against the British administration and preserved the spinal chord of Irish Nationalism through the Young Irelanders, the Fenians, up to the men and women of 1916 and beyond, and the ultimate overthrow of the invader on the bulk of this island..
Anne was buried in a pauper’s coffin in an unmarked grave in Glasnevin. 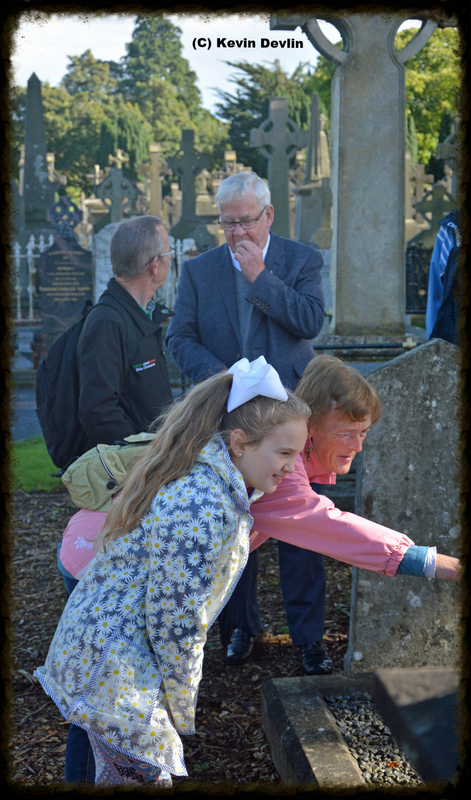 Eventually, the historian RR Madden raised a headstone and unwittingly committed the final insult when he described Anne Devlin as Robert Emmet’s “faithful servant”, which she was not. No, she was Emmet’s co-conspirator and the proud bearer of his ideals until her death. 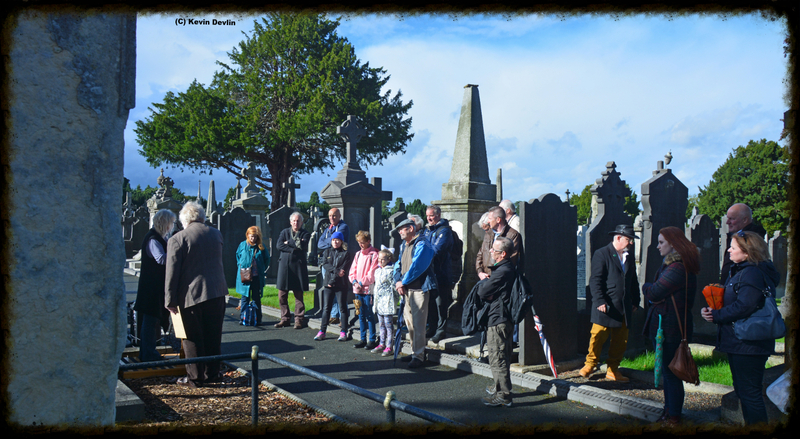 She was Ireland’s first female prisoner … and today has been forgotten by almost everyone. 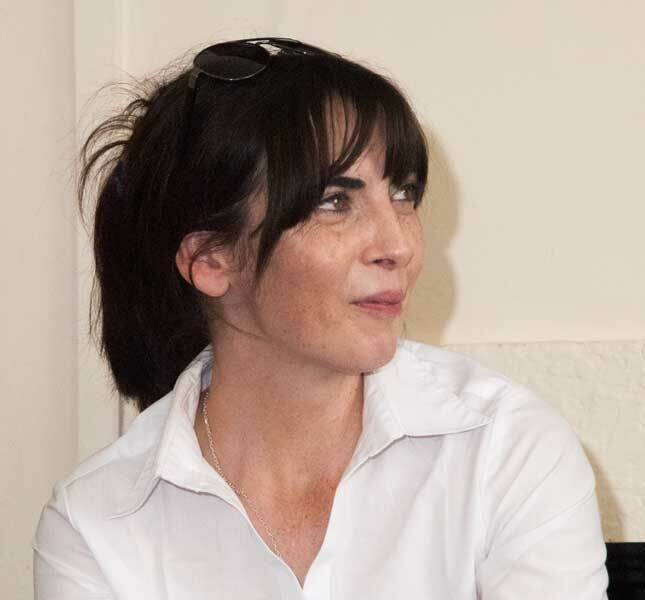 On Sunday, September 24th, we marked her life as we have done for the previous 12 years, first at 12 noon mass in St. Catherine’s Church, Meath Street (where she was married and her children were baptised) and then, at 3.00 pm, at her graveside in Glasnevin, where many joined with us to remember and honour one of our greatest. or any good bookshop. If they don't have it ask them to order it in. 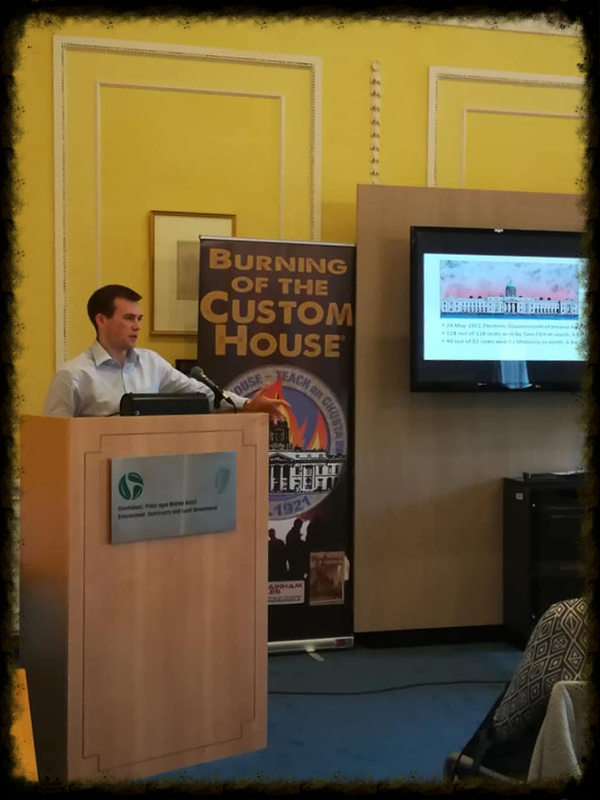 We launched "MAY 25 - burning of the Custom House 1921" on June 21, in the Irish Labour History Society, Beggars' Bush to a full house. Éamon Ó'Cuív was the guest speaker, Mícheál Ó Doibhilín the MC, and Liz Gillis the guest of honour! 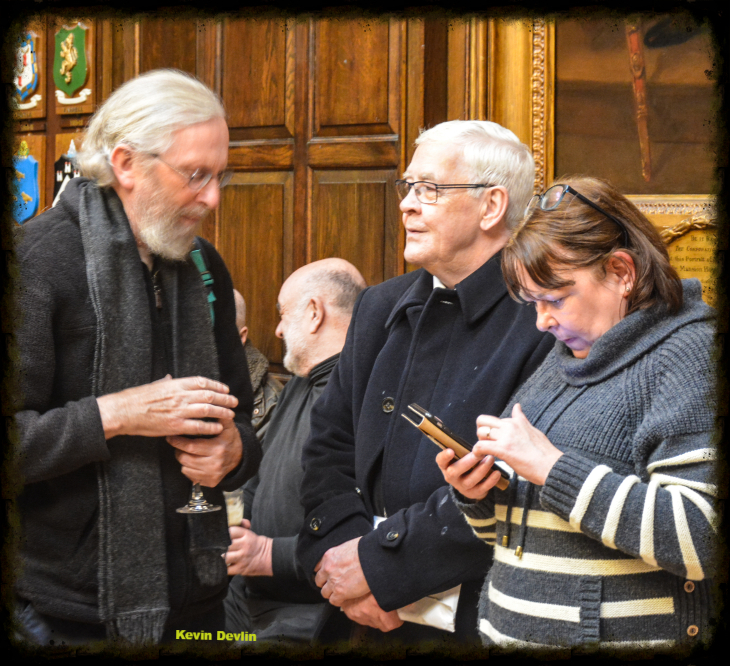 It was a swelteringly hot evening, which ensured that the water, mineral water and chilled white wine were all firm fvourites with the attendees. 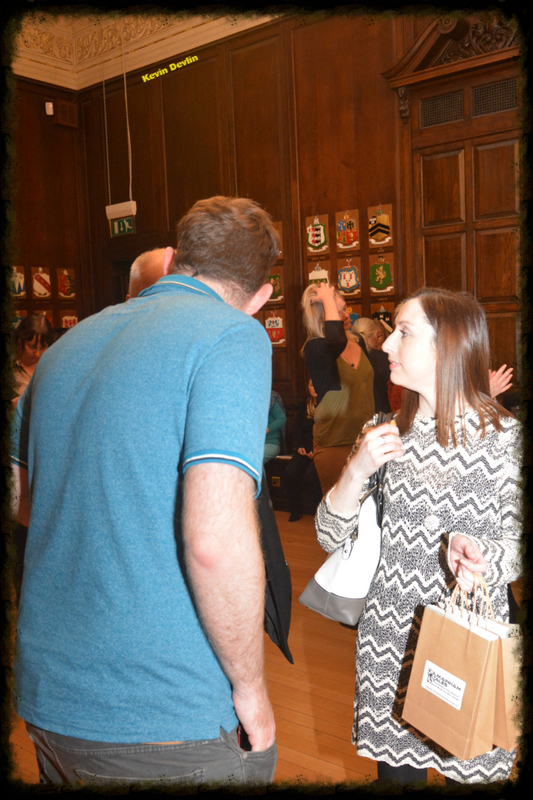 It was great to see so many familiar faces - but also so many new ones present. 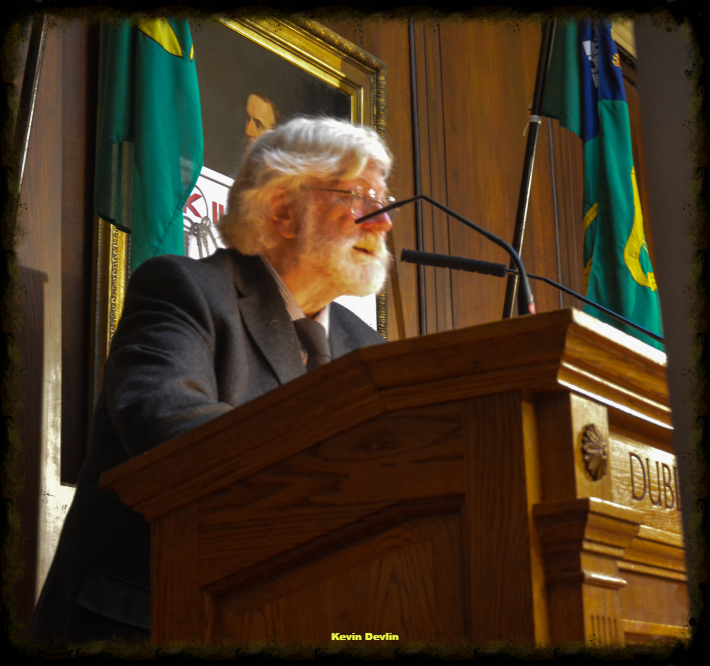 Rather than give a full account of the night it is simpler to link to Pól Ó Duibhir's blog here where he reports on the night - and reviews the book. 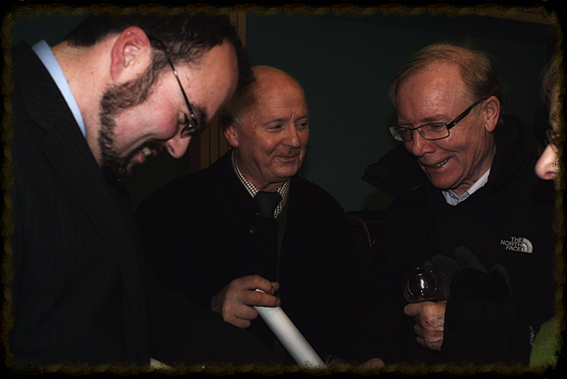 Pól and James Langton both photographed the event and we reproduce Pól Ó Duibhir's photos below. James Langton's are here. As will be seen by these there was much one-to-one discussion between the attendees and the speakers. 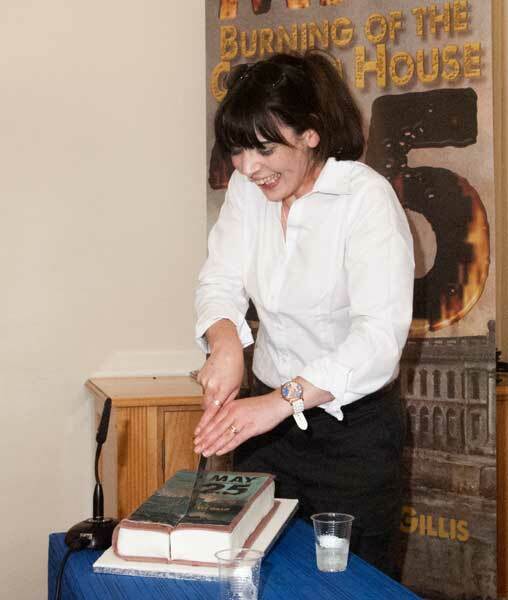 One unusual feature was an extra version of the book - in cake! 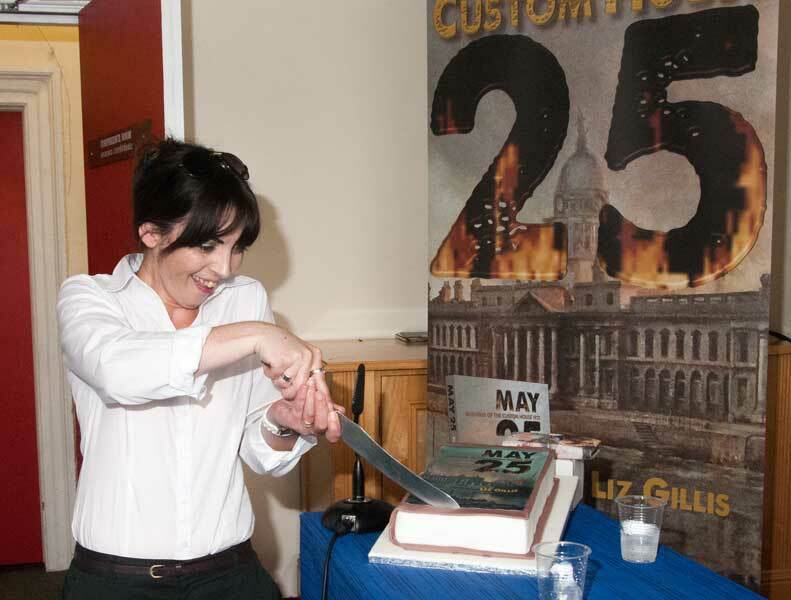 Created by Aisling Whelan of Icing on the Cake by Aisling Whelan, this was possibly the first time when an author had to eat her words at her own book launch! 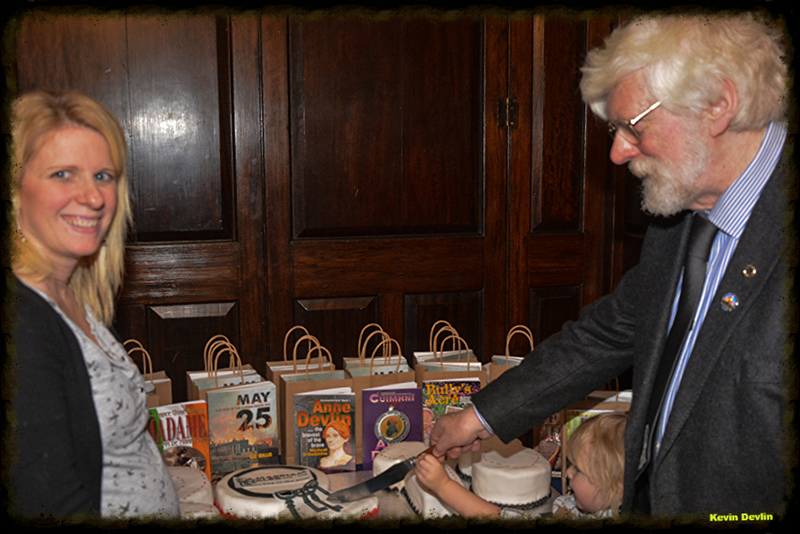 The cake was as popular as the book, and all agreed it was as good. 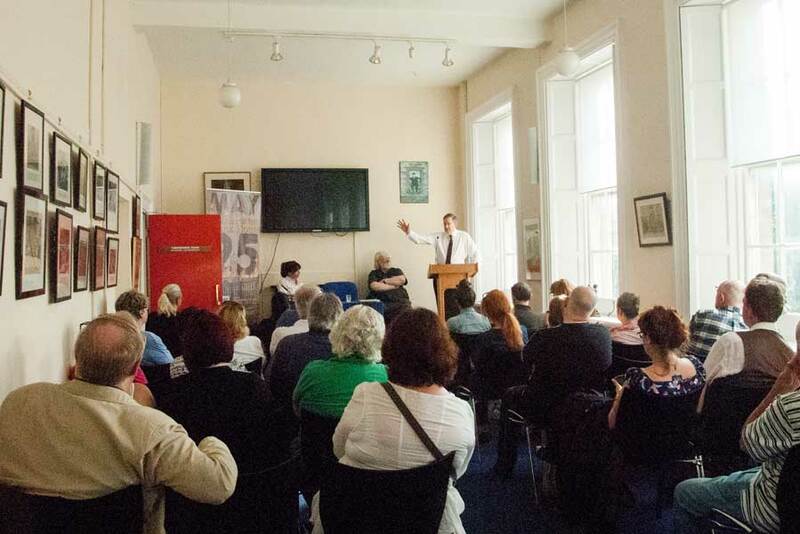 We are grateful to all who attended on such a warm evening, but especially to our Guest Speaker Éamon Ó Cuív who spoke so passionately about the book and the events in it. We are proud to have added this book - and author - to our collection. 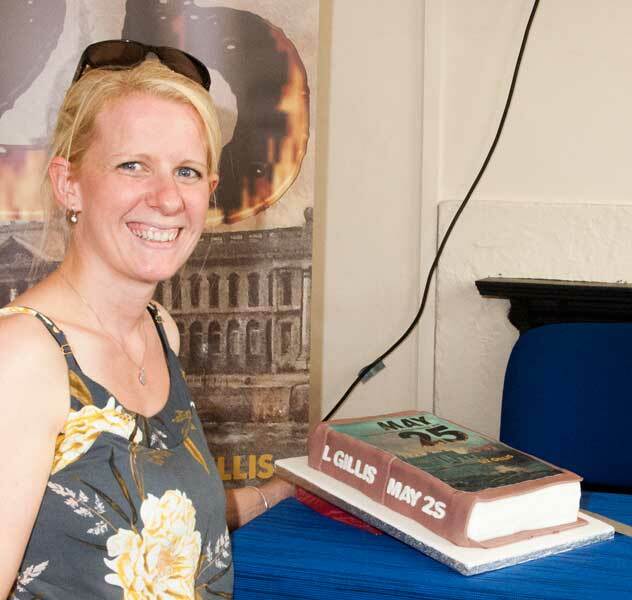 Liz Gillis, of course, has six previous best-selling history books to her credit, and has worked for over eight years with publisher Mícheál Ó Doibhilín to bring this book to fruition. 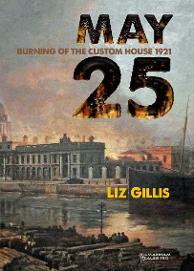 Liz Gillis has written the first comprehensive history of perhaps the most important event in the irish War of Independence - the burning of the Custom House. This account puts the attack in context and explains in great detail the events of the day and its aftermath. This book is unique inasmuch as it tackles a subject which many have claimed to have been a disastrous failure. 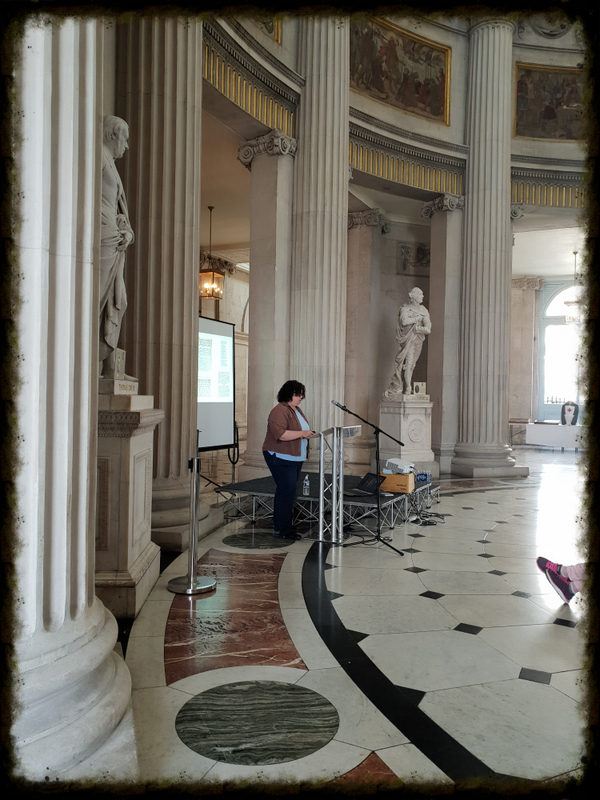 Liz explains the objectives, the context, the planning and the consequences in detail. 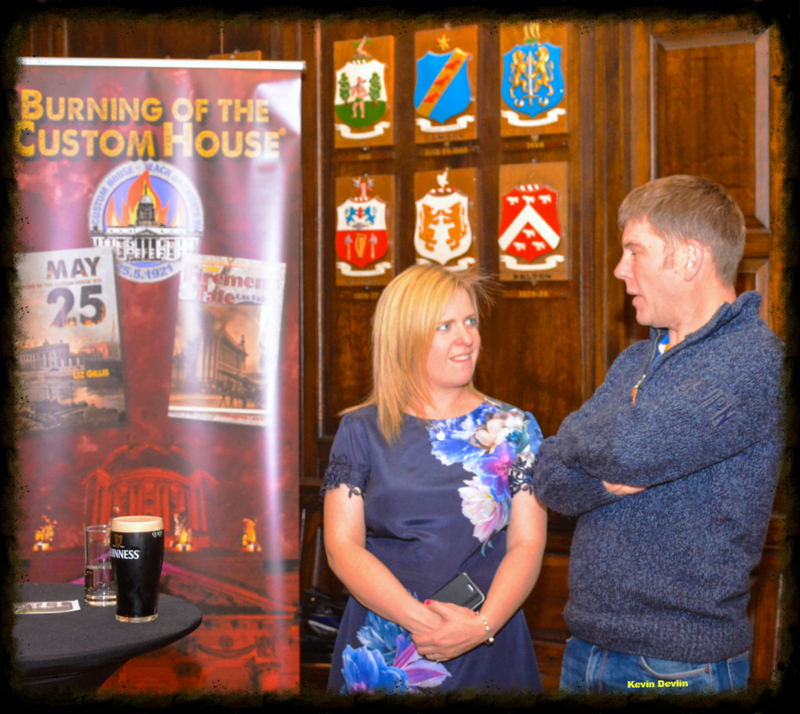 The book is now available to buy direct from us here. 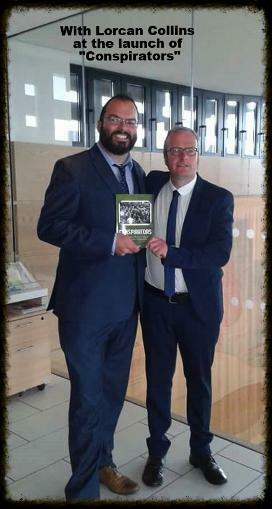 is the first to stock this great book - and even have some signed copies so, don't delay and get yours quick! 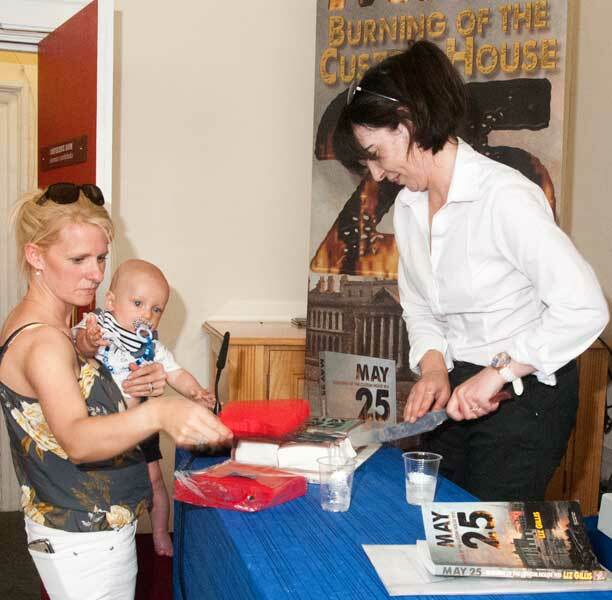 Books Upstairs, D'Olier Street is quick to follow suit. 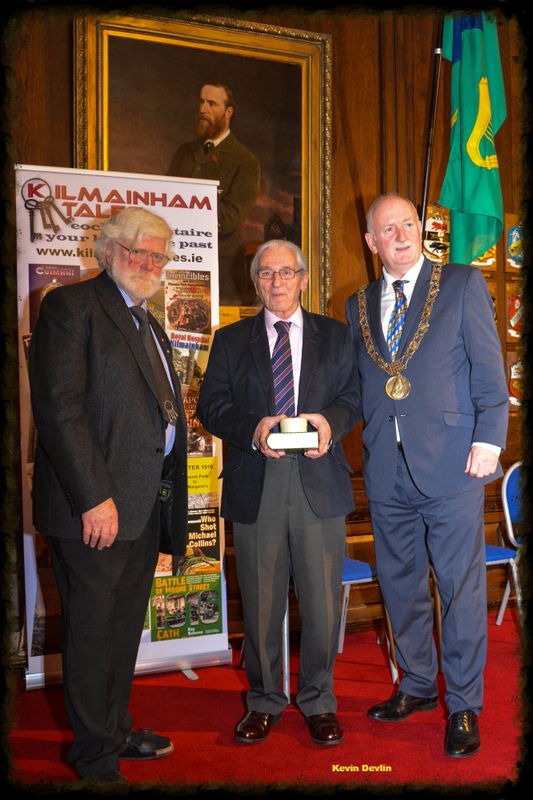 Alan Hanna, Rathmines is the latest to stock our complete range. If you can't get to any of these stockists, check with your local bookseller - if they don't have what you want ask them to order it in. 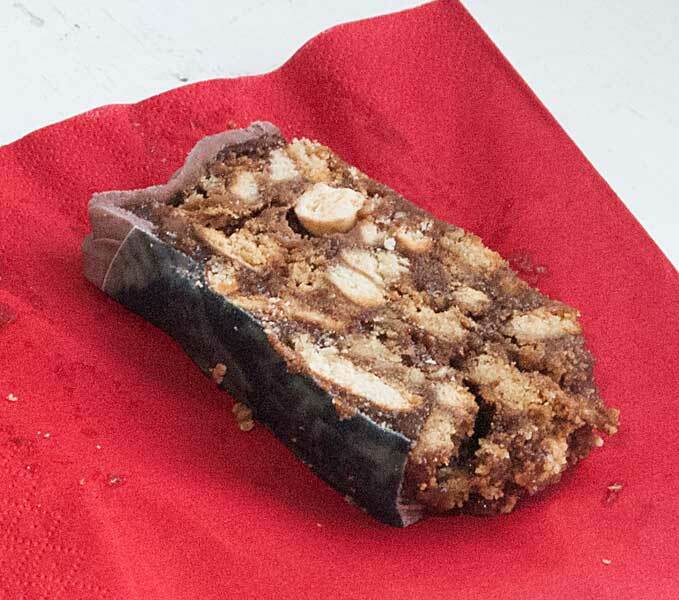 Available from either their regular suppliers or from us here. 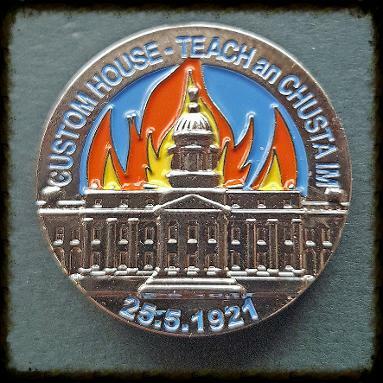 A special badge has been produced to commemorate the burning of the Custom House on May 25, 1921. 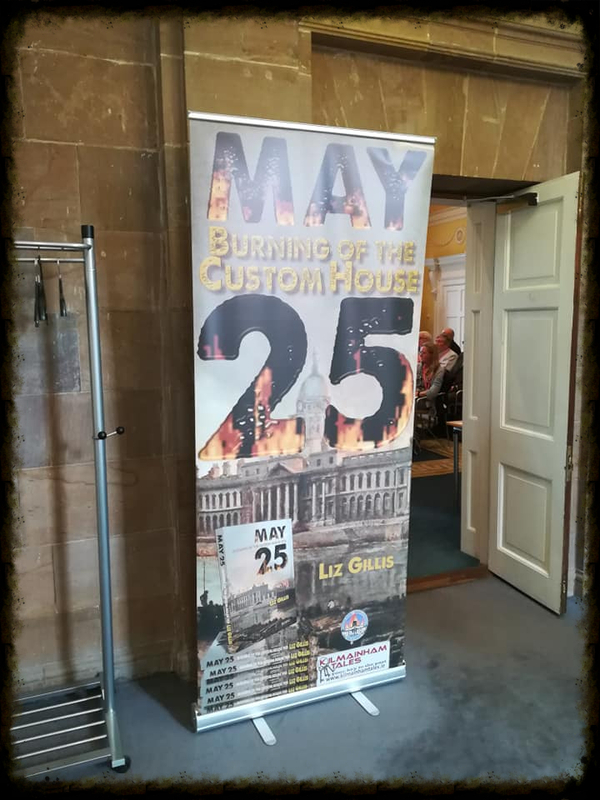 On May 25, 1921 the IRA launched one of its largest and most audacious operations when it attacked Dublin’s Custom House, the heart of the British administration in Ireland. 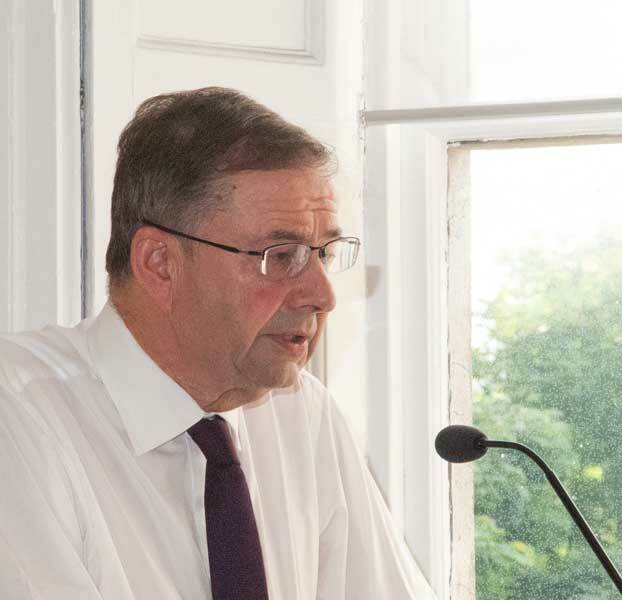 Many still view this as a military failure that destroyed the IRA’s Second Battalion in Dublin but, over the last number of years, this view has grown to be challenged. 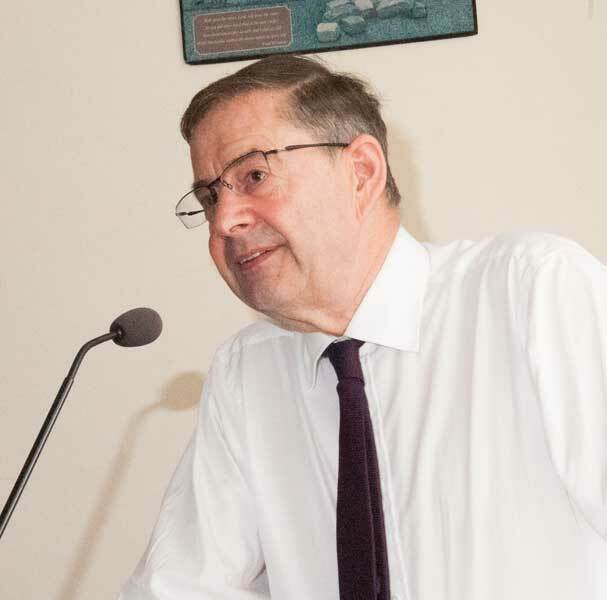 Now it can be argued that the operation was, in fact, a success which probably helped bring about a truce and the subsequent Treaty negotiations. 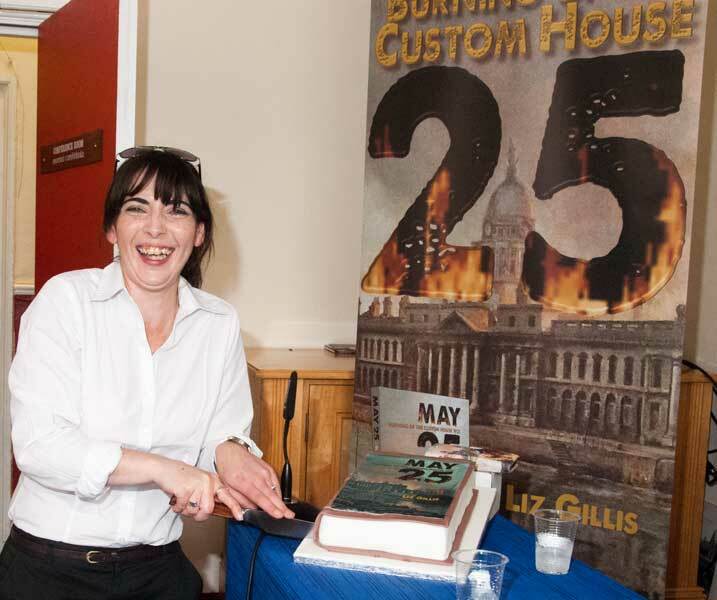 Liz Gillis (historian and author of six books on Ireland’s early 20th century revolutionary period) and Mícheál Ó Doibhilín (author of four books and publisher of books on Irish history) organised a full-day a conference in the Custom House, Dublin on the burning of the Custom House, Dublin, 1921, on Saturday, May 27 2017. This attack was a pivotal moment in the War of Independence and, less than seven weeks later, a truce was arranged between both sides as England called for peace talks. 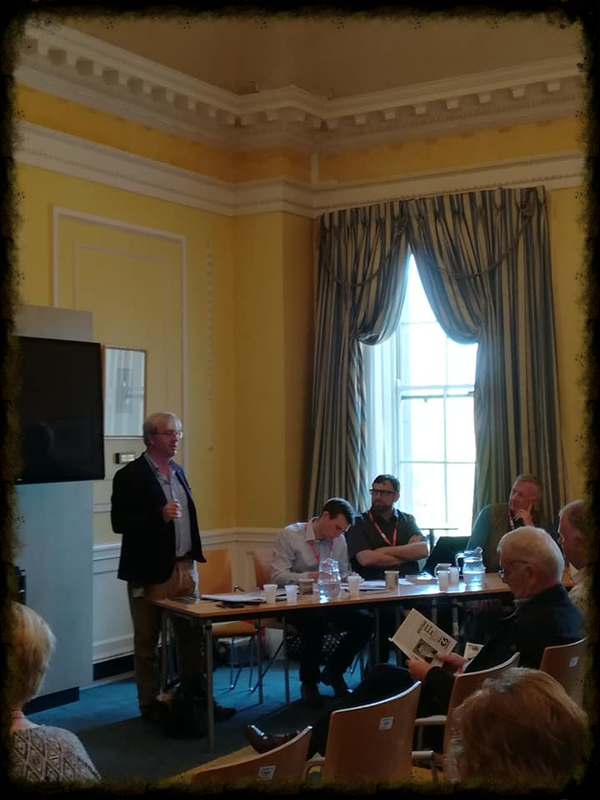 Speakers including historians Seán Hogan (author), Las Fallon (two books), Paul O'Brien (eight books), Liz Gillis and Mícheál Ó Doibhilín presented the results of their research into the attack and its consequences. 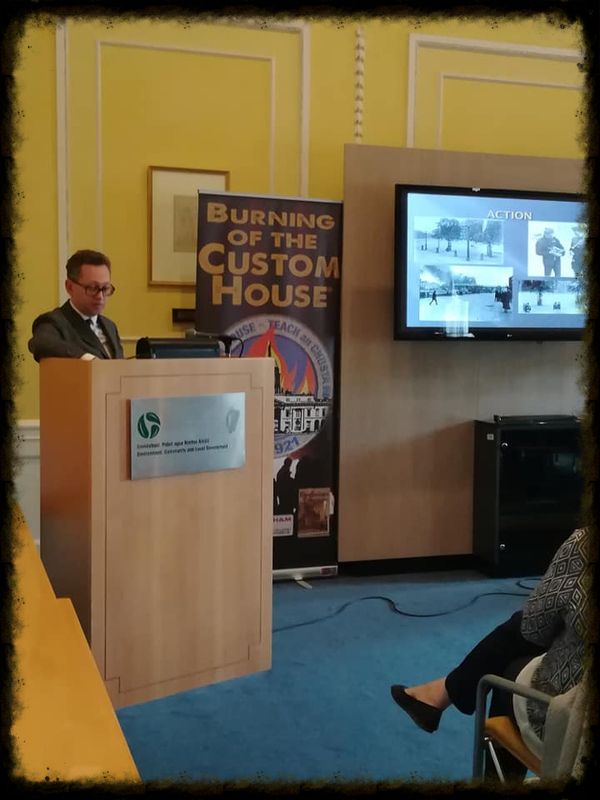 Topics included the attack itself, the role of the Fire Brigade, a military analysis of the attack, fire as a weapon in the War of independence, and what it was like to be in the building during the attack. 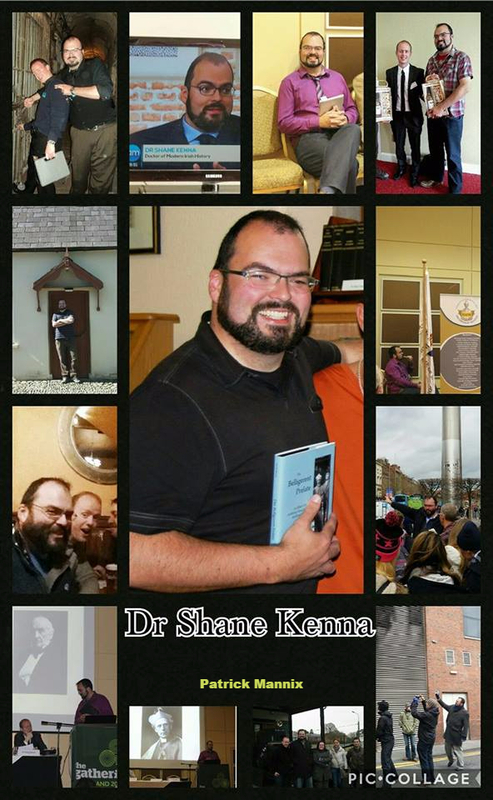 It is with the deepest regret that we record the untimely death of our friend, historian and author Shane Kenna, following a long and hard battle against cancer bravely fought. 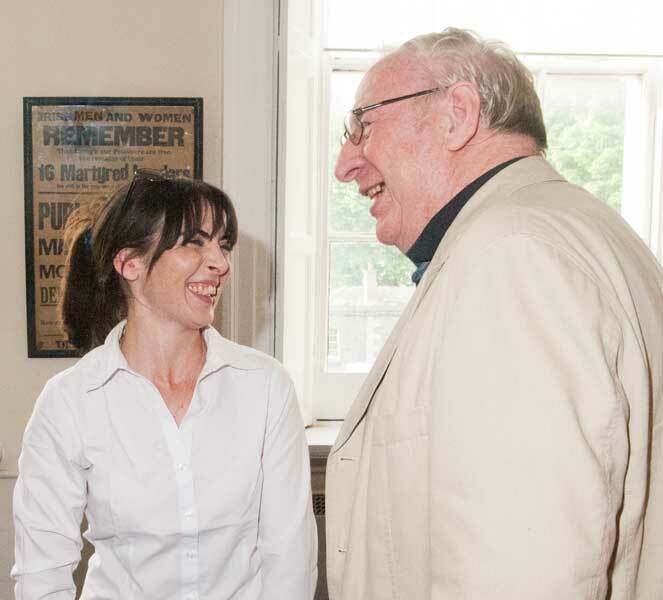 Words cannot describe our loss – not just of one of our best authors – but a best and generous friend too. 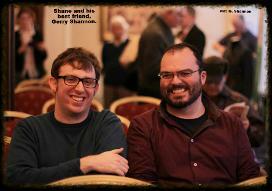 Shane was that rare creature – a really nice and genuine person who was also an expert in his field. 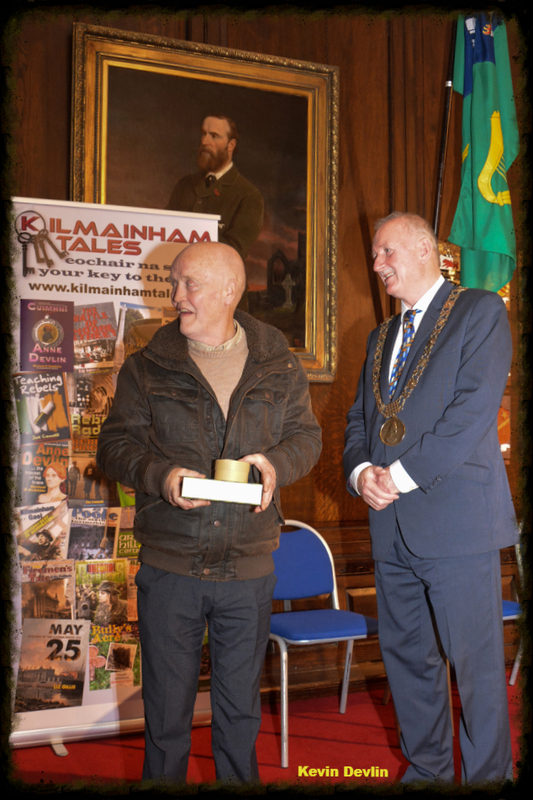 He wrote two books for Kilmainham Tales and had promised us more. 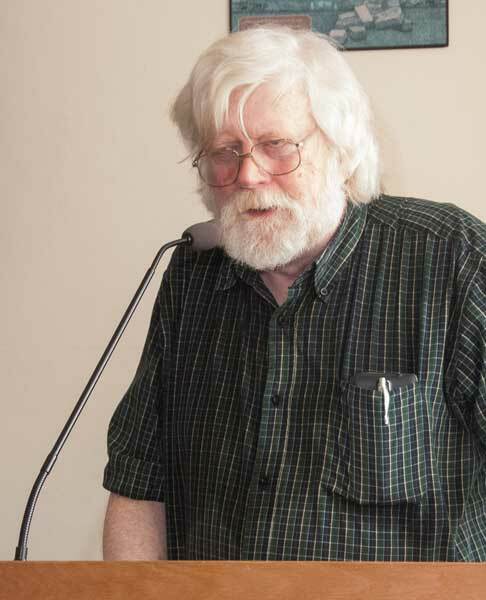 He wrote major books for other publishers. 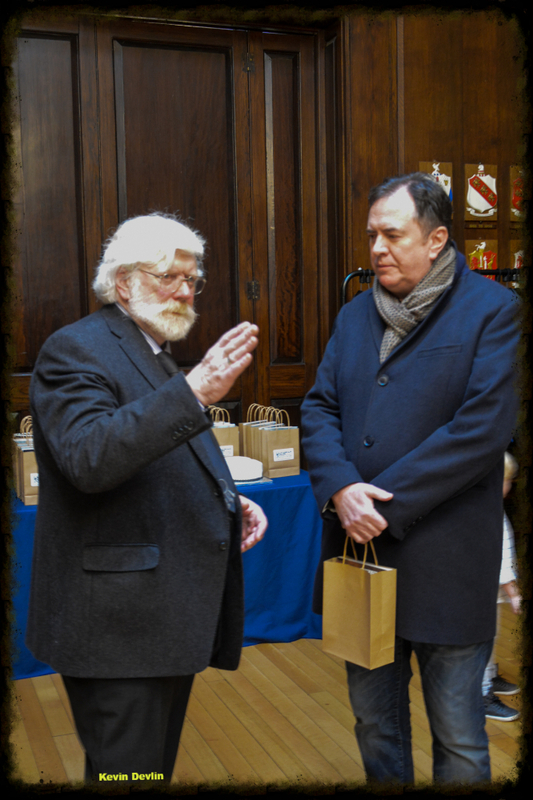 But he was also generous to us with his knowledge on other projects and so helpful always. 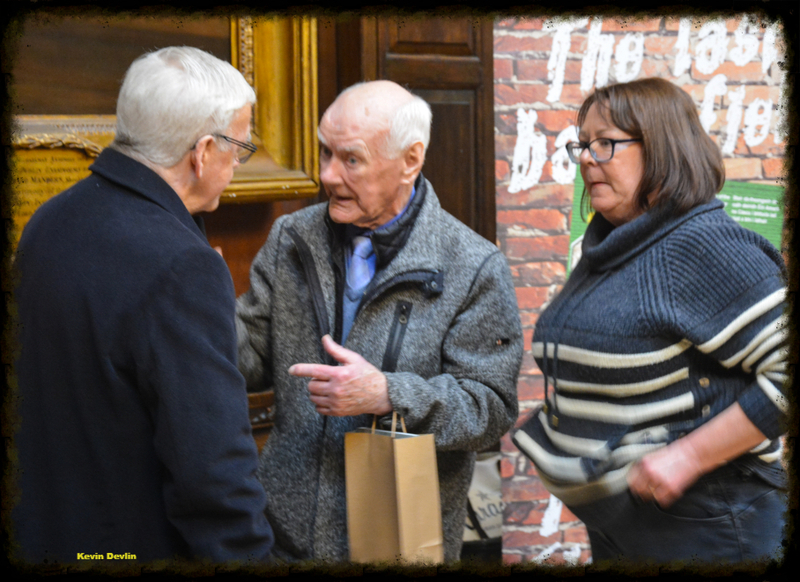 It was our great pleasure to work with him in Kilmainham Gaol when he was there and every day in his company was a valuable learning experience to be treasured. 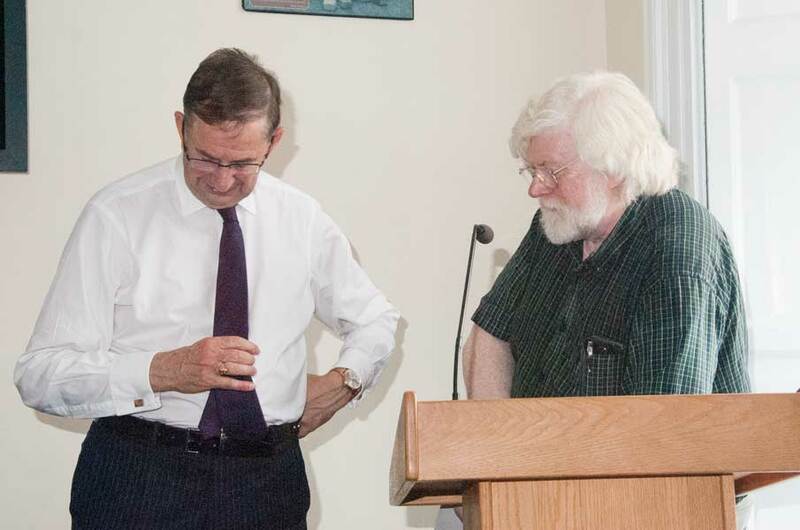 Road trips with him were memorable, and to get to listen to him give talks on diverse subjects including Tom Clarke was a privilege we shall sorely miss. 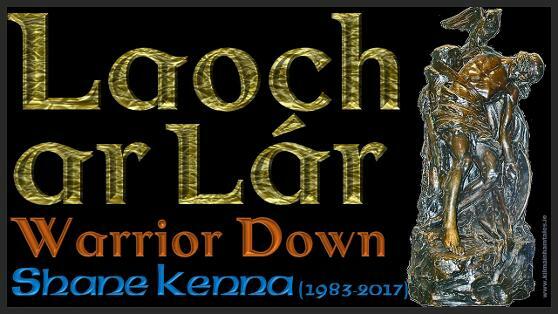 As one tribute online wrote: "Laoch ar lár" - "Warrior down" (we've borrowed this for our title, it is so apt). 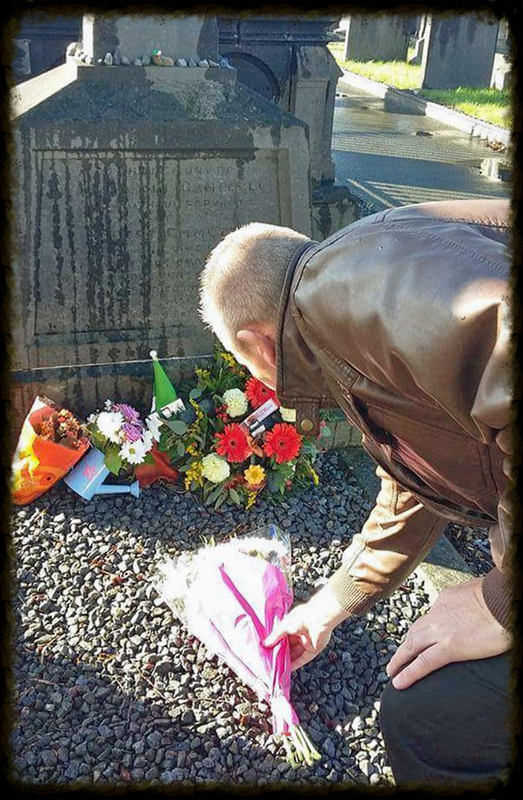 But, in falling, Shane has joined that great panoply of heroes we rightly revere, heroes who loved our country, heroes who lived for it, heroes who gave their all to immortalise it. 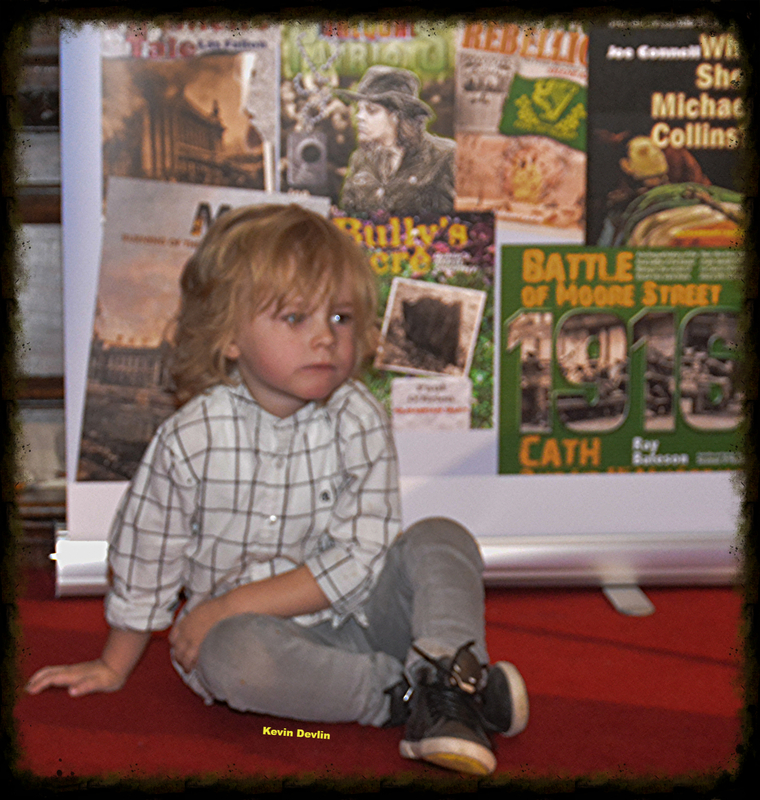 Shane has now entered the pages of that history which he loved so well. But not as some mere footnote - no, he will have a chapter all his own, where he will stamp his authority on our past for our future. 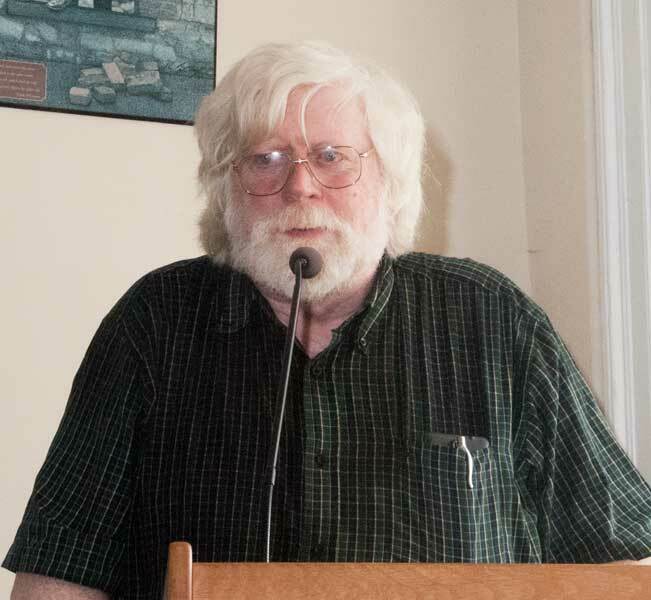 He will not be forgotten as long as any of us lives, as long as his books exist. 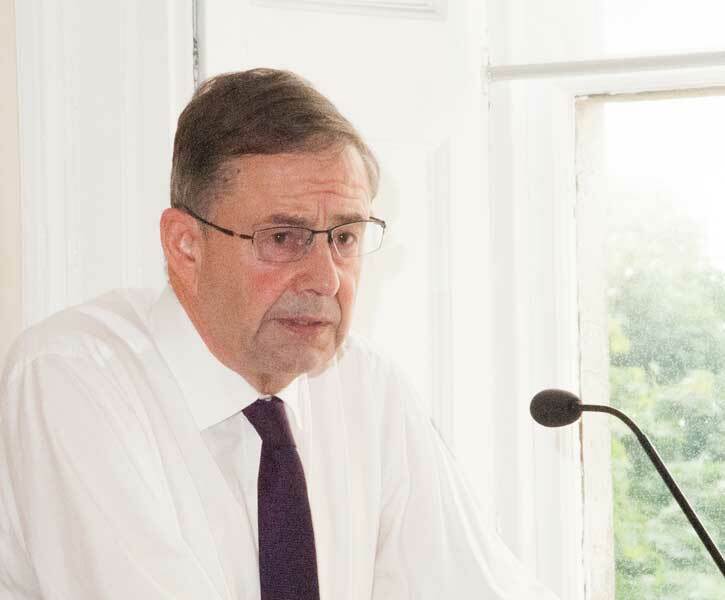 Even when we have all passed on and his books, eventually, may be forgotten, he will still have contributed to the richness and depth of our understanding of who and what we are as a nation and, even if forgotten in name, by clarifying our past, he will have shaped our future. 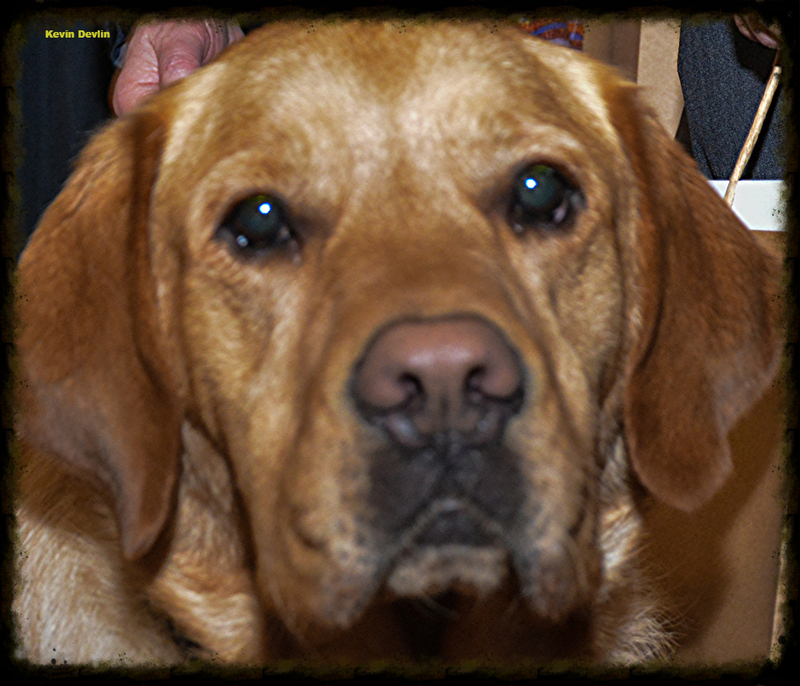 Shane may not have lived long, but he will live longer and have greater influence than all the rest of us together. 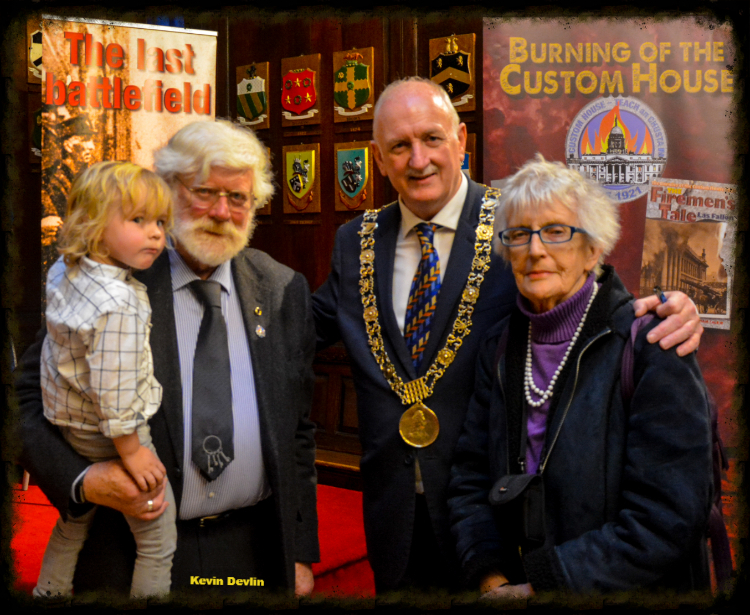 To his mother Olive, his brother John and his fiancée Edel, we can only offer our deepest and sincerest sympathies. We do not envy you your grief, though we share it. We offer our support, and assure you that we will be with you whenever you need us. Your loss is our loss and we suffer with you in your pain. The world .. your world ... our world ... is a poorer place today. 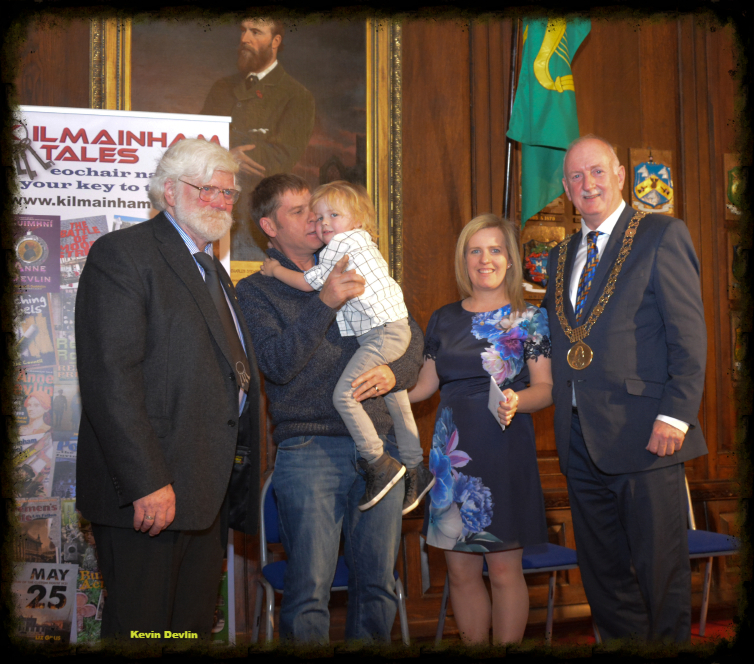 To Shane we say “Slán, a cara, agus míle buíochais. Thank you for all you did and gave. You remain part of us. Rest in peace, brave soldier, your work here is done”. There are some online videos of Shane. Two of the best are here and here. 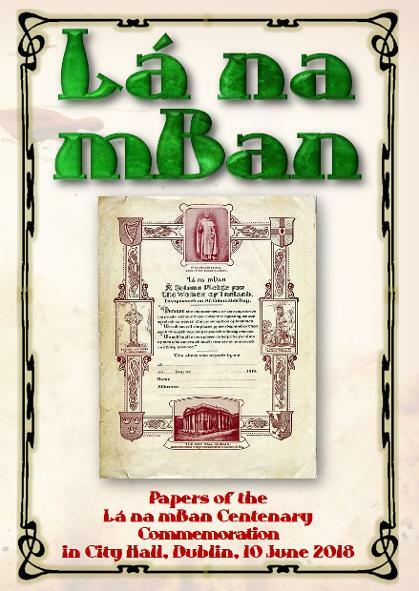 The GPO Cumann na mBan nursing contingent in the battlefield, Easter Week, 1916 ... the forgotten heroism of 12 brave Cumann na mBan Women is told in a major new two-part article by Maeve O'Leary, granddaughter of Lucy Smith (Byrne). 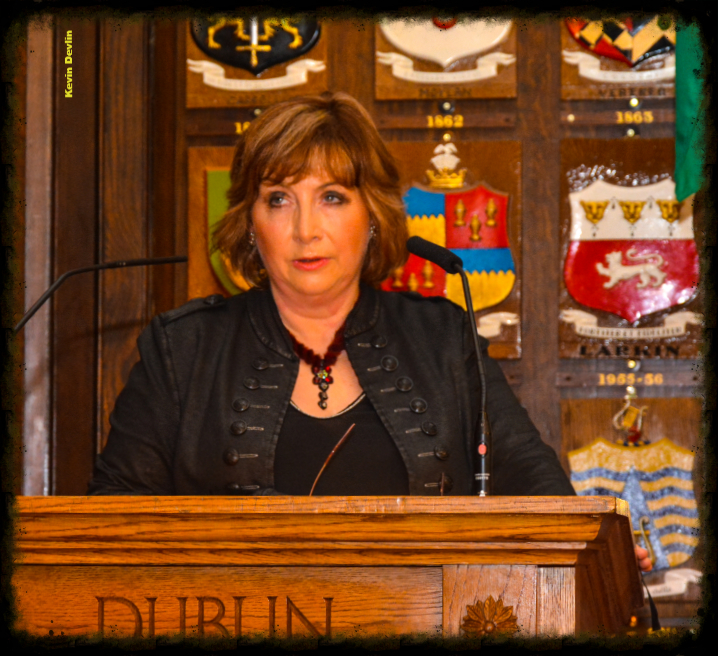 We attended the European Premiere of "Death or Liberty" in the Australian Embassy, Dublin, on Friday November 18th. 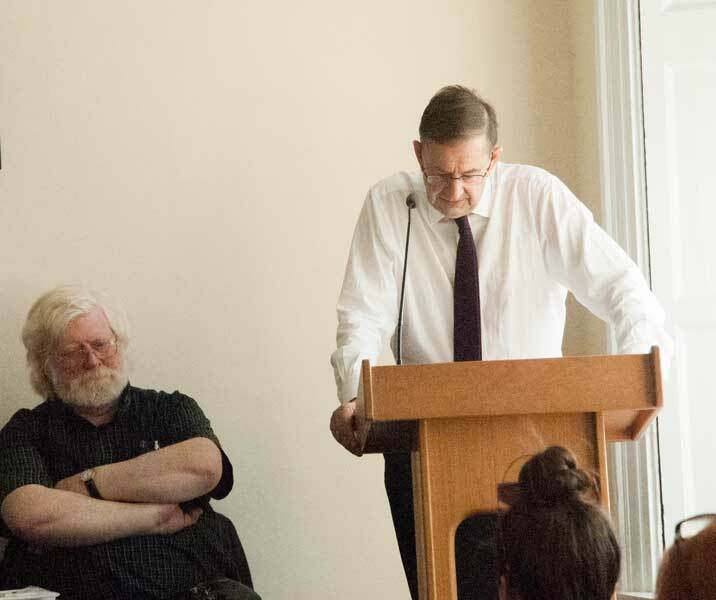 with a capacity audience. 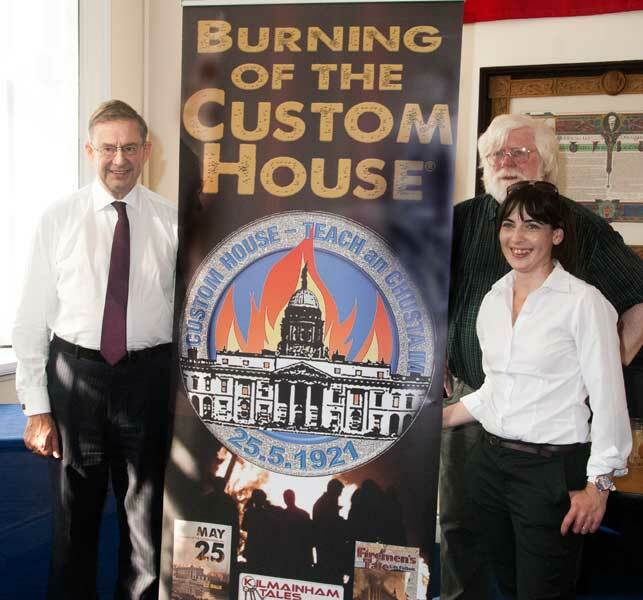 This feature-length film (80 mins) tells the story of British and Irish political transportees to Australia - their life and after-life. 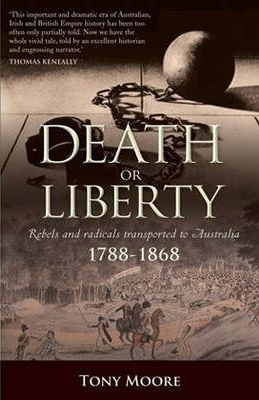 Between 1793 and 1867 the British Government banished its radicals, dissenters and rebels to harsh prison colonies at the very edge of the known world - Australia. Some were to escape and return home as heroes but many stayed in this alien new land ... and made a difference. 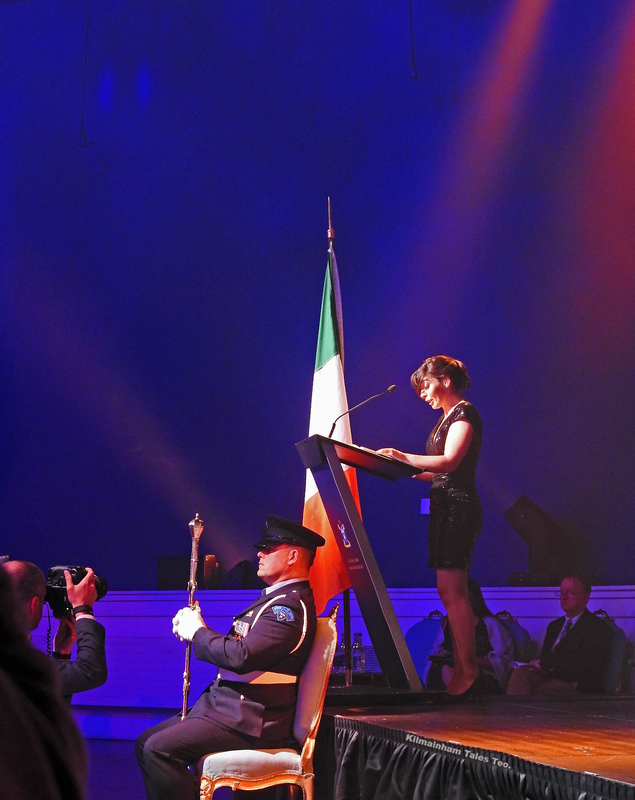 Their stories are full of astonishing acts of bravery and derring-do. Here, in their own words, they tell tales that are at once stirring, heart-wrenching, dark, sometimes funny. Based on Tony Moore's book of the same name, this film brings to life the forgotten history of these convict rebels, transported in chains but unbowed and unsilenced. 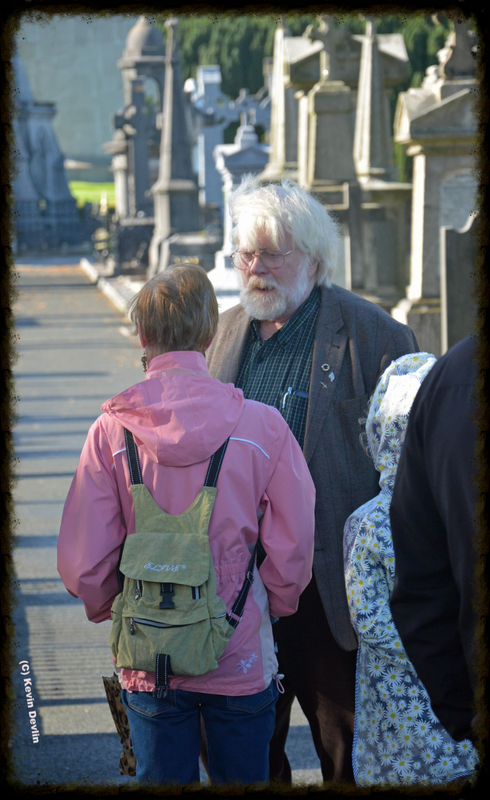 Death or Liberty features celebrated troubadours Billy Bragg (England), Mick Thomas (Australia) and Lisa O'Neill (Ireland) as well as historians including Thomas Keneally, Dr. Tony Moore and our own Mícheál Ó Doibhilín. With an international cast of actors, this film tells a tale long forgotten by all but the few. 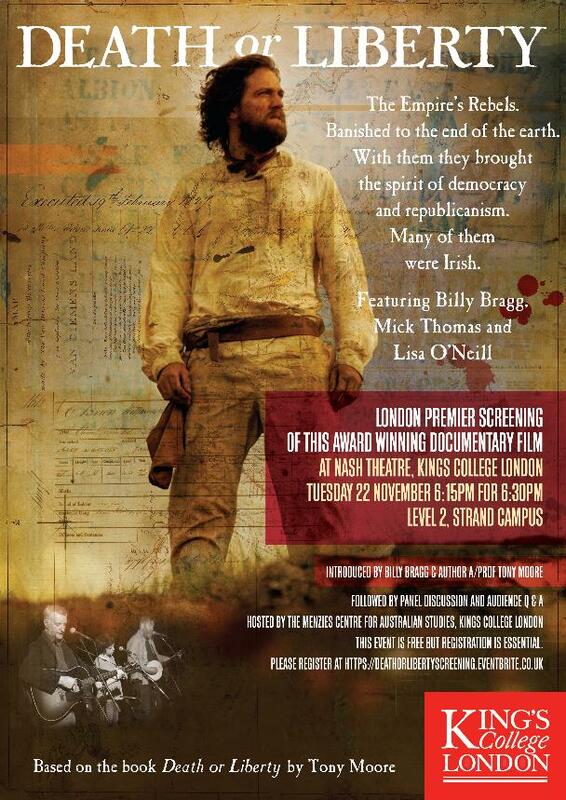 The Irish showing was booked out, with a long waiting list, but for those who can get to London there will be another chance to see this amazing film before it goes on general release at Nash Theatre, King's College, London, (see poster) onTuesday 22nd at 6.15 pm. Admission is FREE but must be booked. 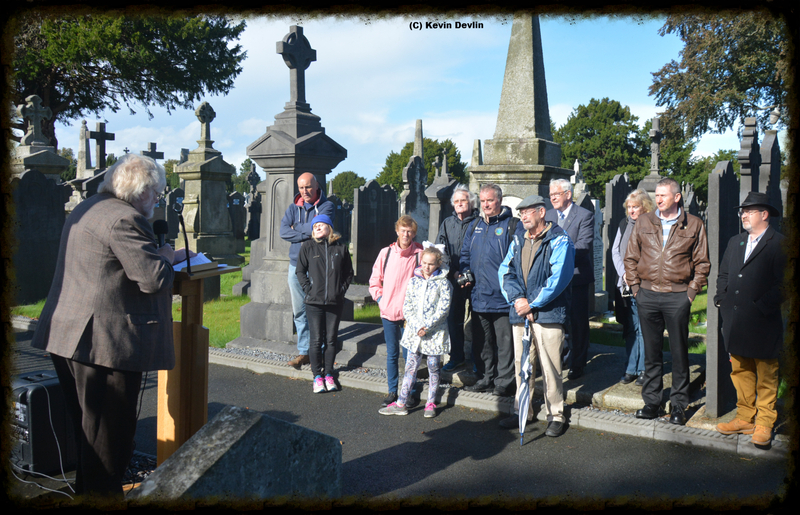 The Annual Anne Devlin Commemoration was held this year on Sunday September 25th, one week after the 165th Anniversary of her death in 1851. 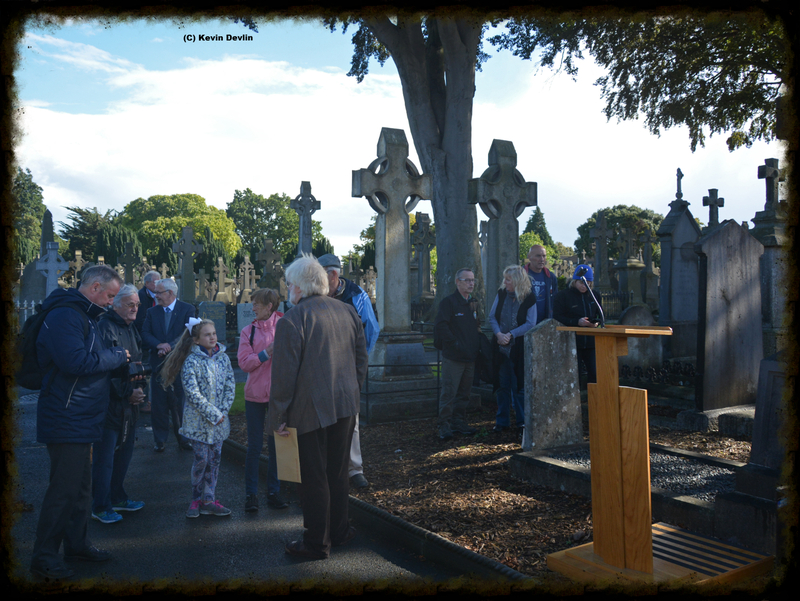 The Commemoration followed the usual format, with mass at 12 noon in St. Catherine's Church, Meath Street, Dublin 1, followed by a graveside oration and wreath laying at Anne's grave in Glasnevin Cemetery at 3 pm. 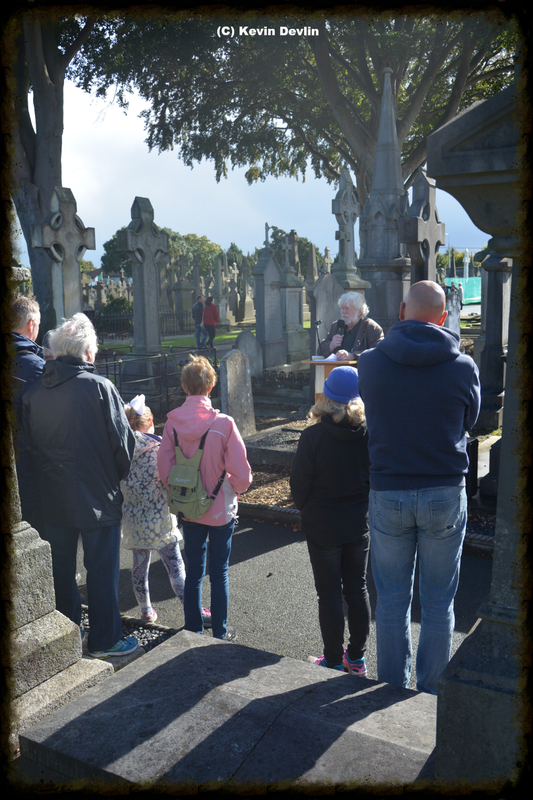 This year, for the first time, we were granted permission by the Cemetery management to make this a formal occasion, and they actively supported us in this, including the supply of sound equipment for the oration. 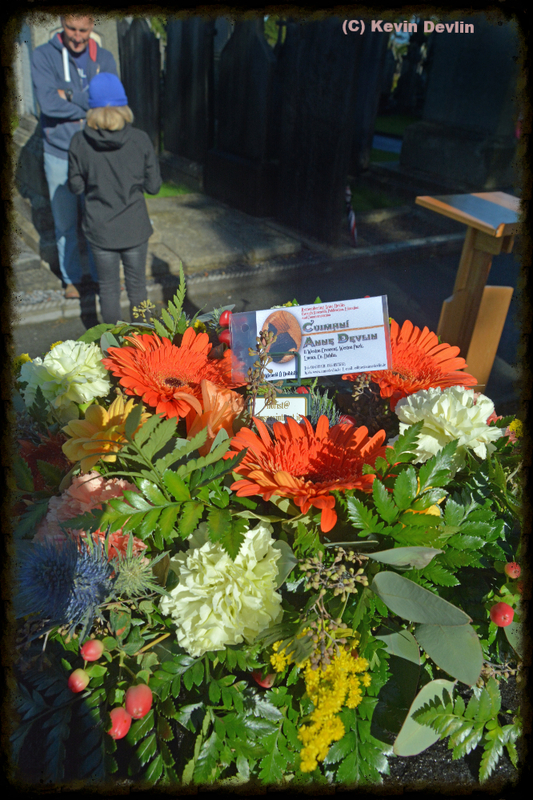 As this is the 165th anniversary of Anne's death in 1851 (she died on September 18th) we made a special request to as many as possible to attend either or both parts of the ceremony, and were particularly pleased to see a crowded church for the midday mass, and the great round of applause for this brave woman that followed Mícheál Ó Doibhilín's address. 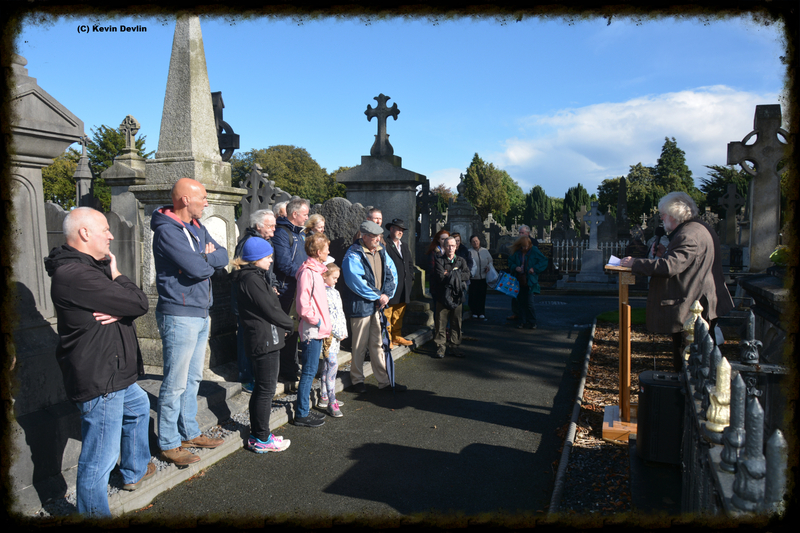 We were delighted to have, as our first guest speaker at the graveside, Nuala Perry of Belfast's Anne Devlin Society, a society specifically established and named in honour of Anne. 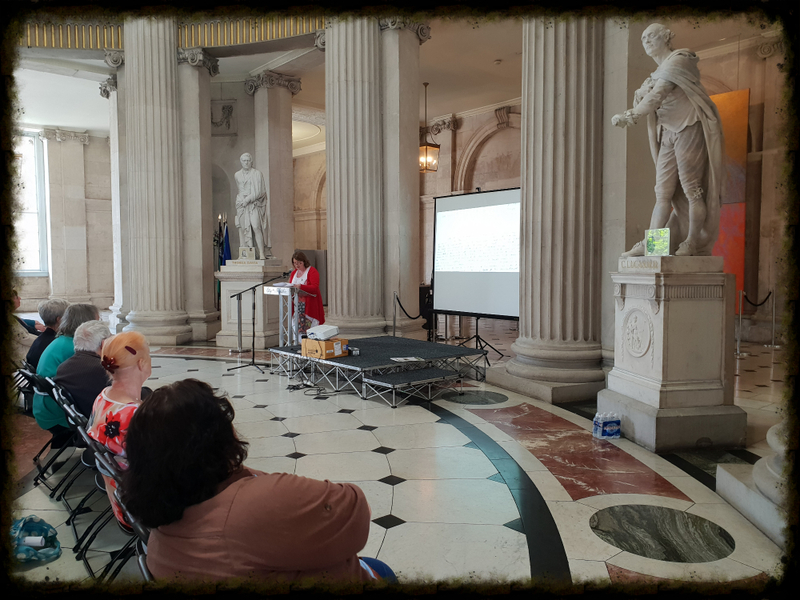 Nuala, as part of her address, read a passage from the introduction to "In the Footsteps of Anne" - a book by Republican women ex-prisoners, which noted the influence of Anne's memory on these women, and their admiration for her suffering for a free Ireland. 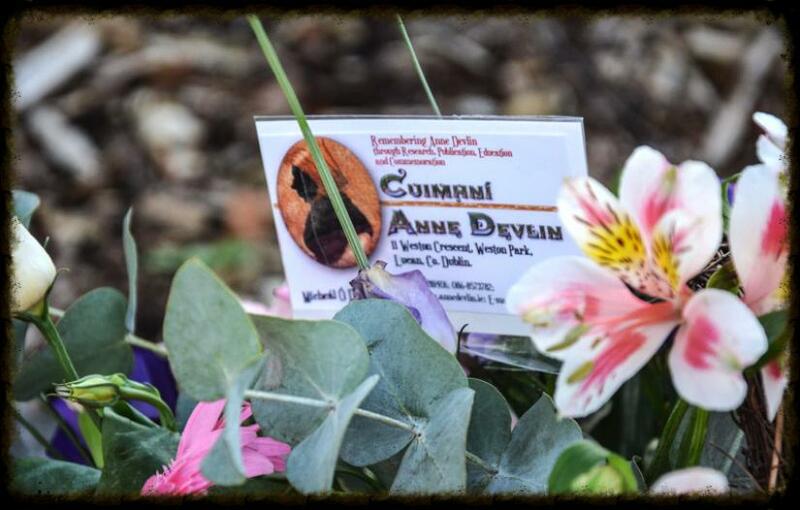 A new group has been established - Cuimhní Anne Devlin - to "remember Anne through Research, Publication, Education and Commemoration" and it is this group that organised the special service for Anne Devlin this year and will do so into the future. 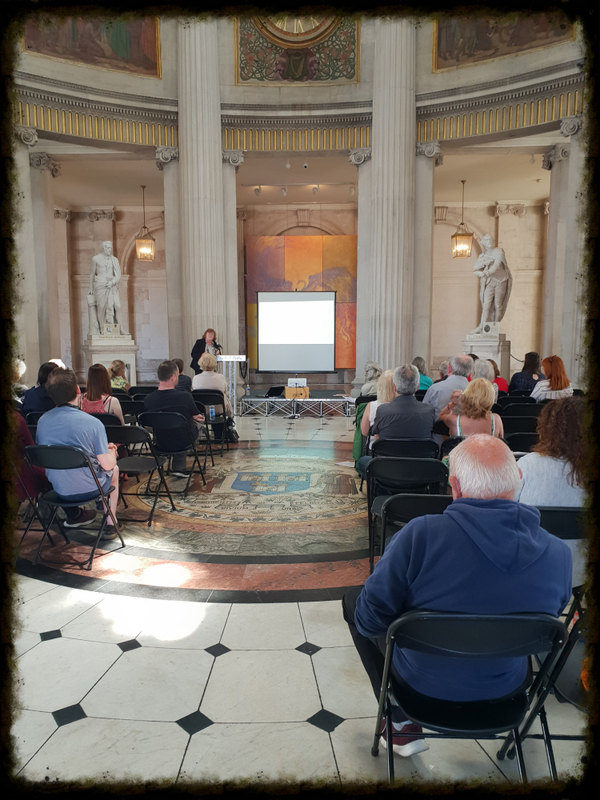 Cuimhní is Irish for Remember, Consider, Think and Remind and is used to define the purpose of the group - to co-ordinate ongoing research, public talks, publications, research etc. 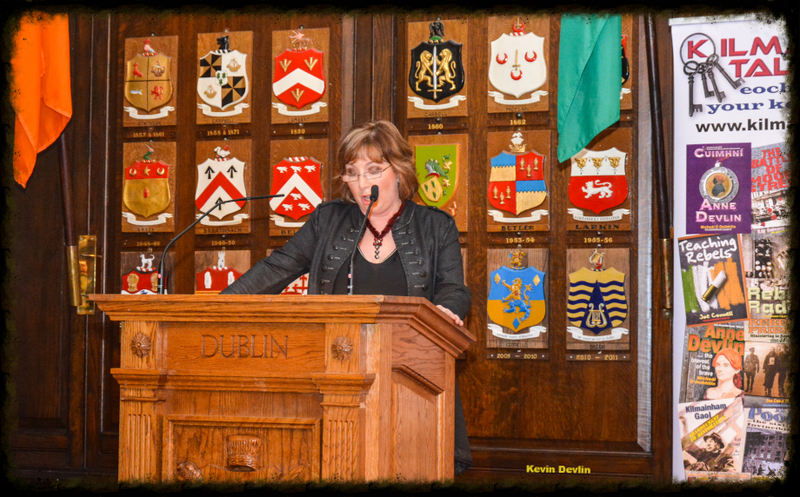 to further consolidate the memory of Anne Devlin as one of Ireland's most important heroes. 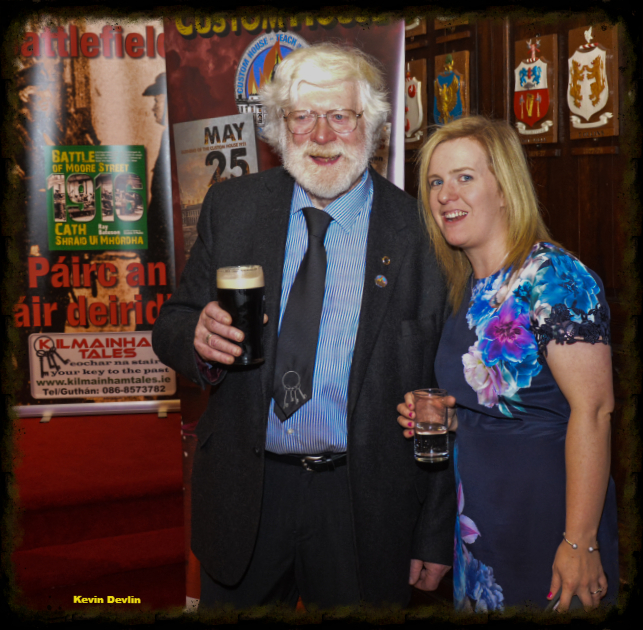 Further details can be obtained on the Cuimhní Anne Devlin Facebook page here and other events will be posted on this page also. 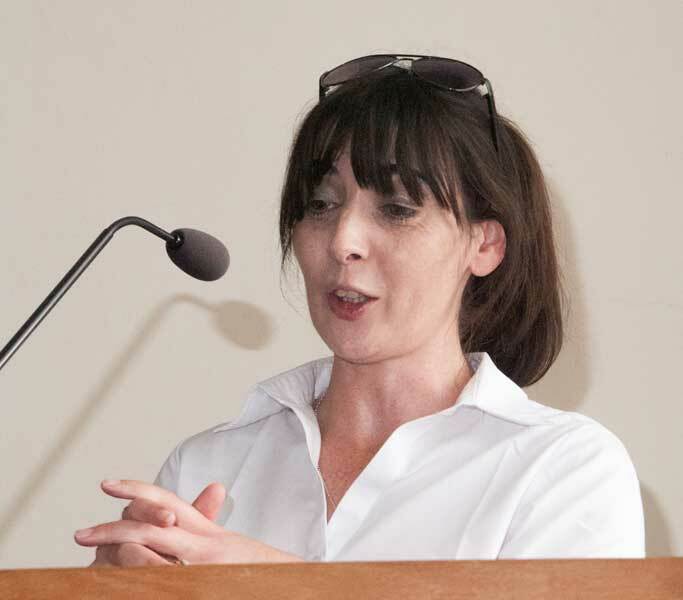 On Thursday September 8th Mícheál Ó Doibhilín gave a talk on Anne Devlin - "The Pawn and the Castle" - in the Presbyterian Church, Lucan at 8.00 pm. 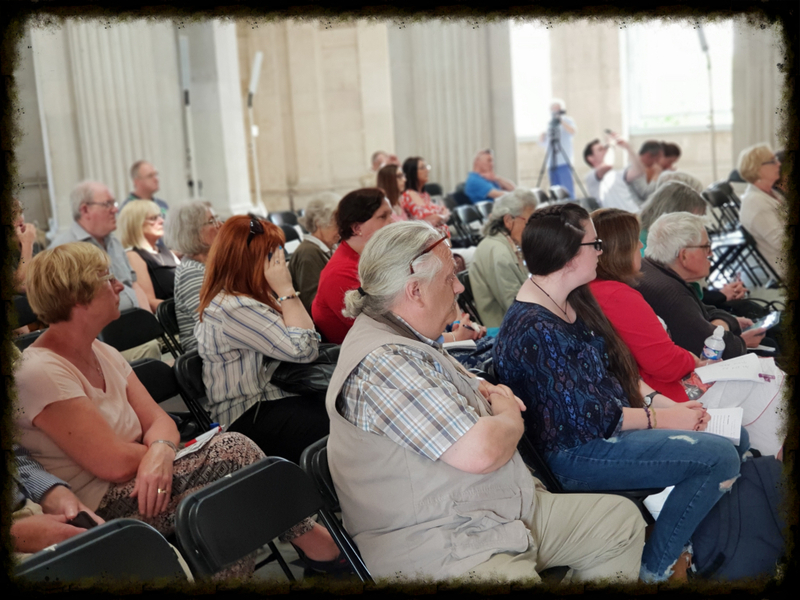 The large audience enjoyed the presentation thoroughly, and there was a lively Q&A afterwards. 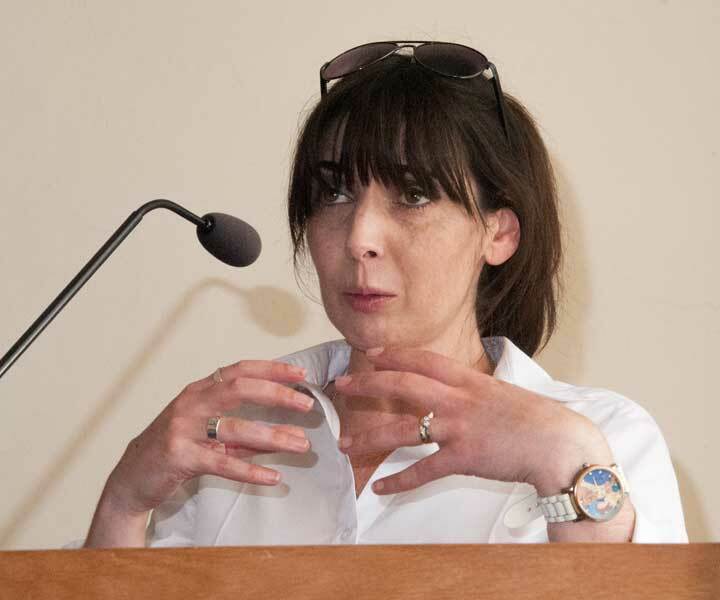 Mícheál Ó Doibhilín gave an illustrated talk on the brief life of Josie McGowan - one of the forgotten participants in the Easter Rising - on Monday 26 September to a packed audience in Áras Chrónáin, Watery Lane, Clondalkin. 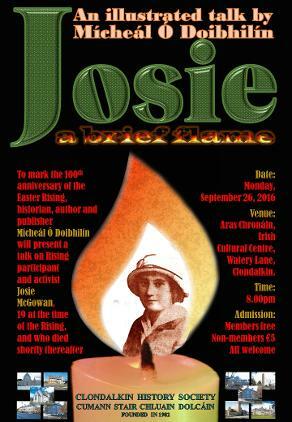 Josie was only 18 when she took part in the Easter Rising, fighting in the Marrowbone lane garrison. 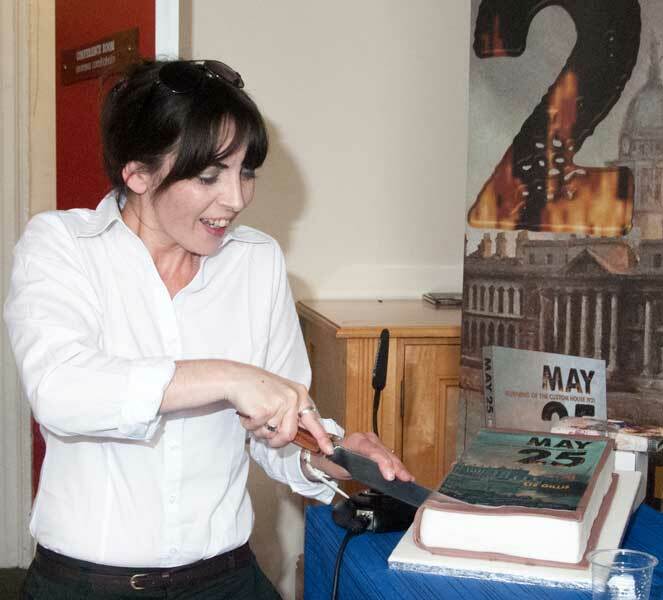 But two years later she was dead in tragic circumstances. 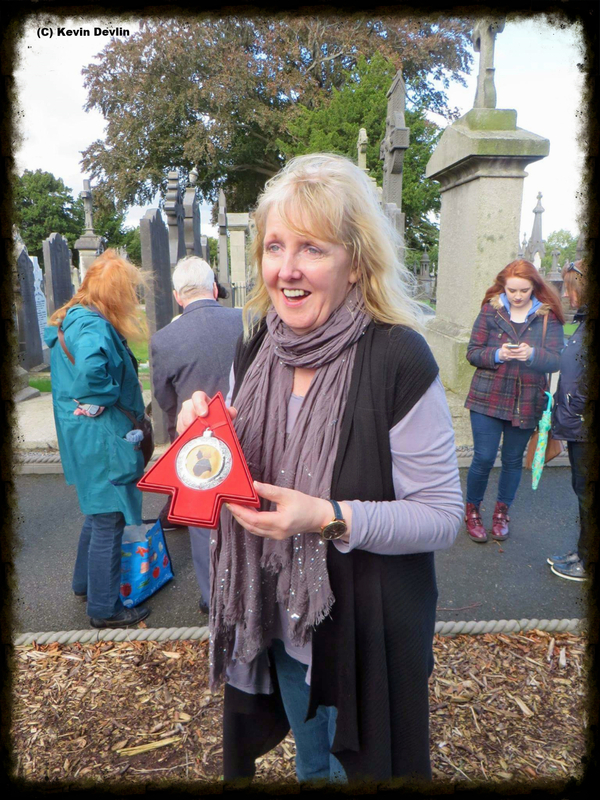 Yet she was posthumously awarded not just the Easter Rising medal but also the Black and Tan/War of Independence one too. 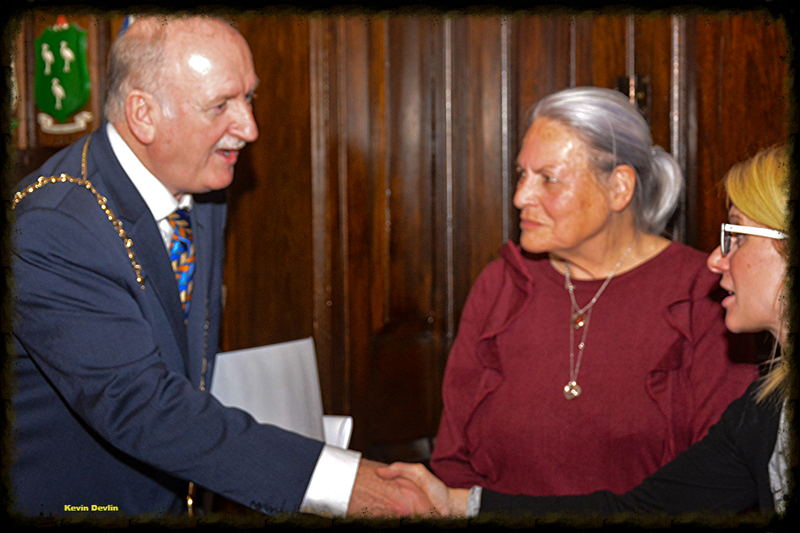 Overlooked until Mícheál researched her story, he believes she should be among our most honoured for her dedication and her bravery. 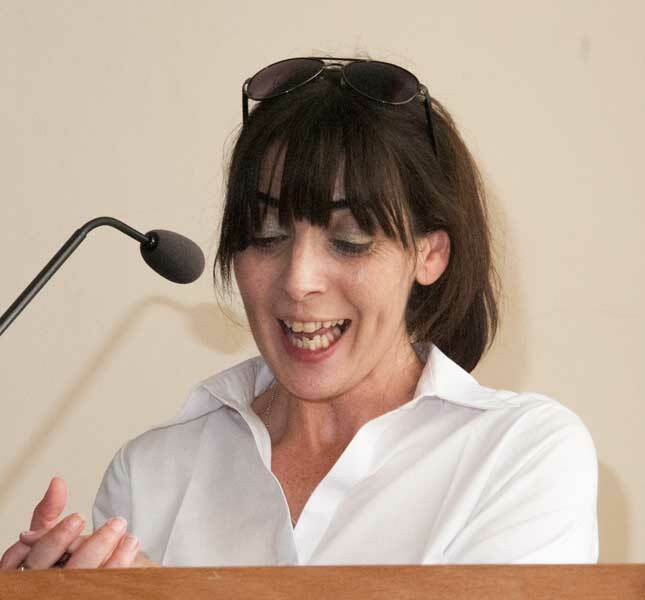 Thug Mícheál Ó Doibhilín léacht léaraithe ar saol gairid Josie McGowan - a ghlach páirt in Éirí Amach na Cásca - in Áras Chrónáin, Watery Lane, Cluain Dolcáin, ar an Luain, 26ú Meán Fómhair, ar a hocht a chlog iarnóin. 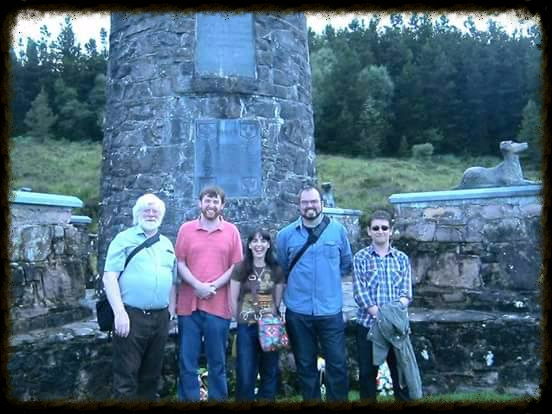 Ní raibh ach 18 bliain caite ag Josie nuair ghlach sí pair san Éirí Amach mar chuid de Gharastún Lána Marrowbone. 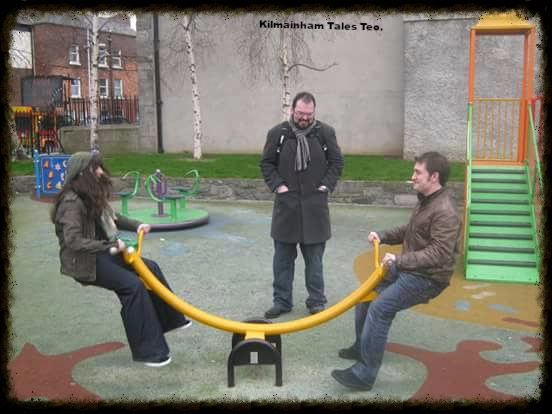 Ach, laistigh de dhá bhliain eile, bhí sí marbh go tragóideach. 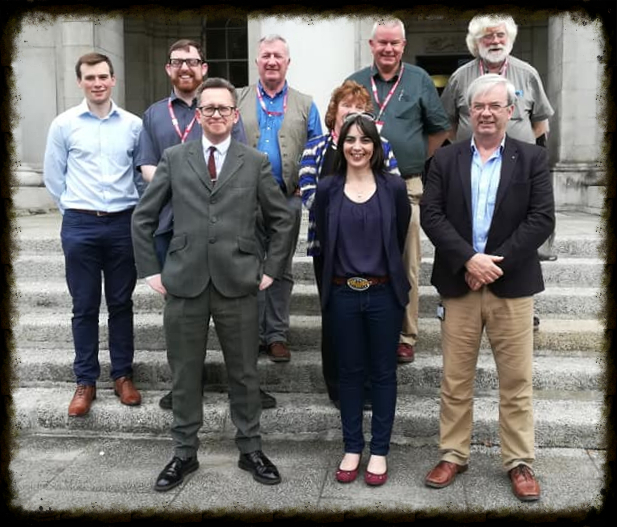 Ach, má bhí, bronnadh - in éinneacht leis an Bonn 1916 - Bonn Cogadh na nDúbhchrónach uirthí freisin! 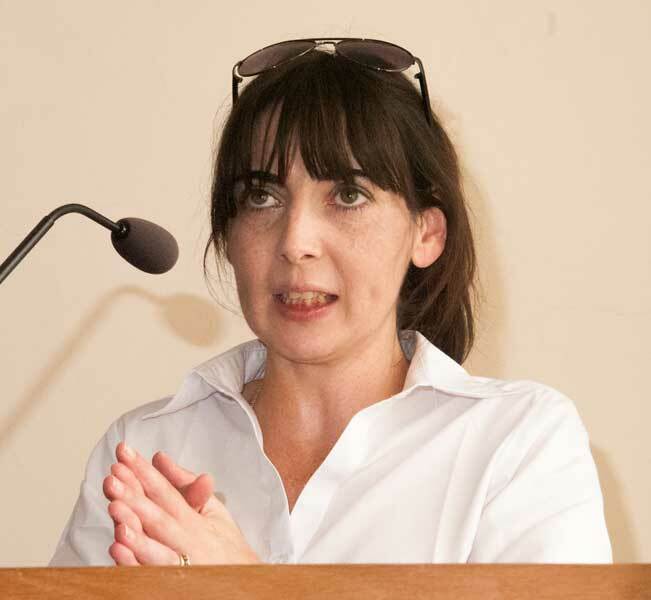 Deineadh deamad ar Josie go dtí gur thosaigh Mícheál ag taighdeah a saoil gairid, agus creideann sé gur cóir go mbéadh sí onóirithe inniúde dheasca a tiomnú agus a chrógacht. Too many friends and family have died since this site was launched. 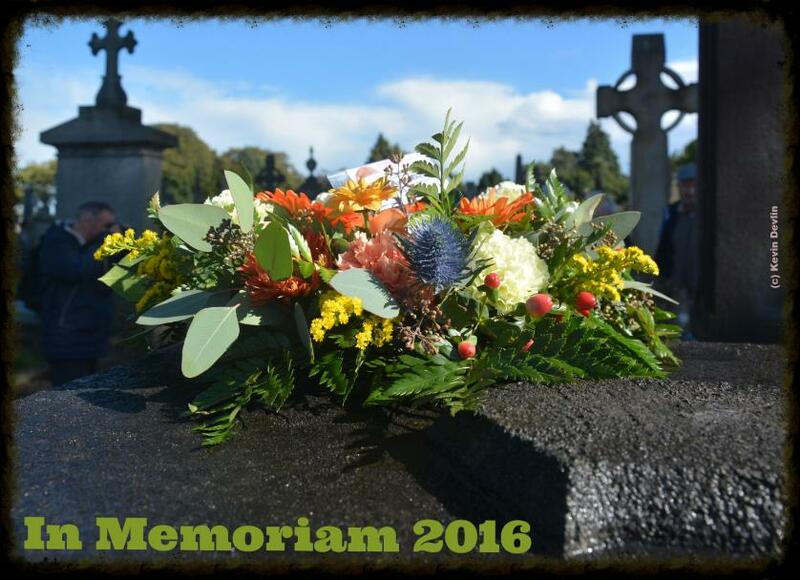 We cannot and will not allow them to be forgotten, so tributes to them all are on a special page here. 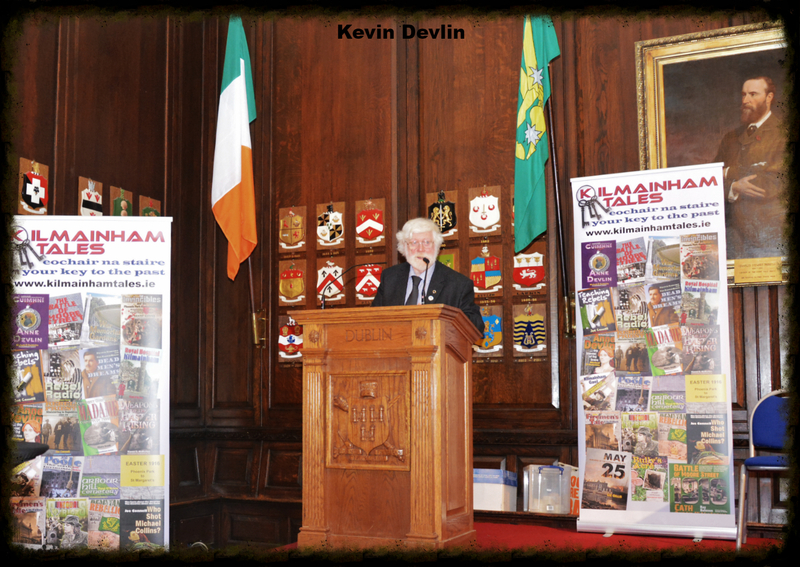 On the pages within this site are articles relating to the history of Kilmainham Gaol and its environs. However, due to the increasing number of articles we are carrying, not all are shown in the drop-down menus above. To access an article first click on a section head above to go to the main page for that section. There you can select your interest from the drop-down menu or links to the articles which will be found on the page you land on. 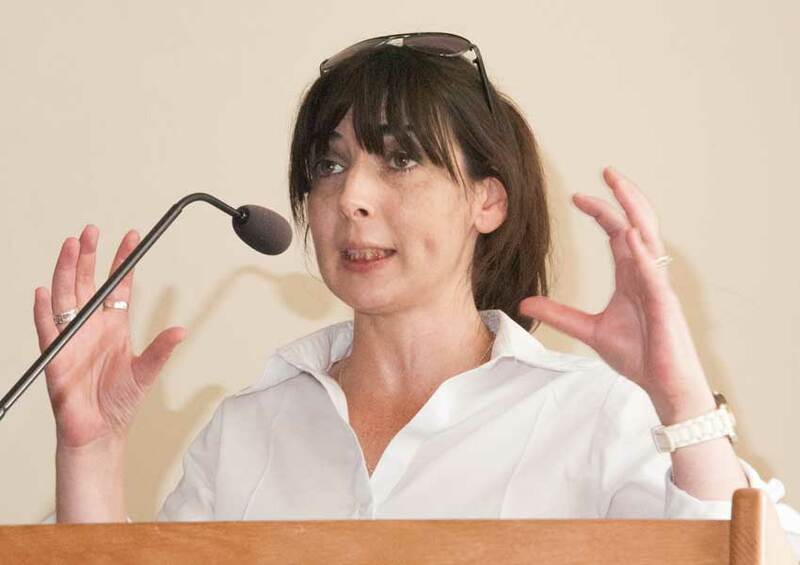 Liz Gillis (author of "The Fall of Dublin" and "Revolution in Dublin" - Mercier Press), and a contributor to this site, on Saturday March 29, gave a lecture on The Siege of the Four Courts 1922 to the Stoneybatter & Smithfield People's History Project. 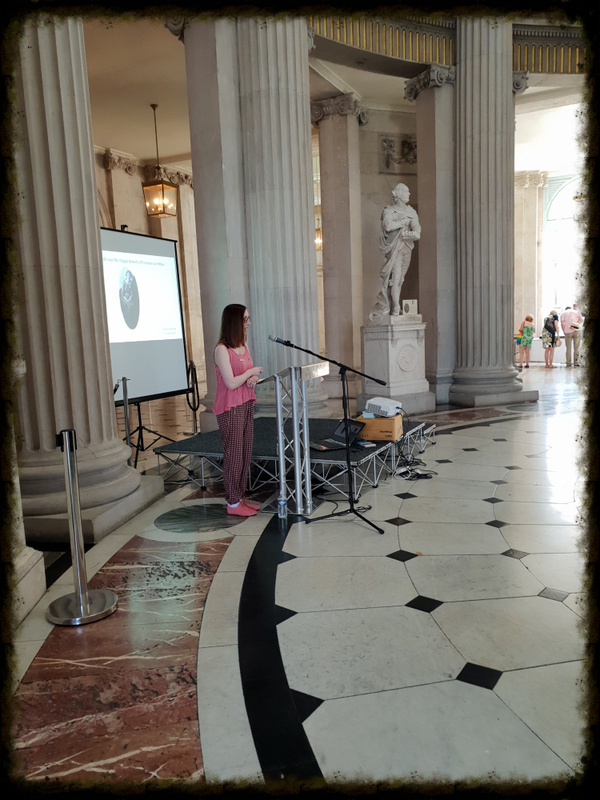 This was a bravura performance as Liz clearly demonstrated her deep knowledge and understanding of the events that started the Irish Civil War, not just during her talk but in her answers to the searching questions from the floor. 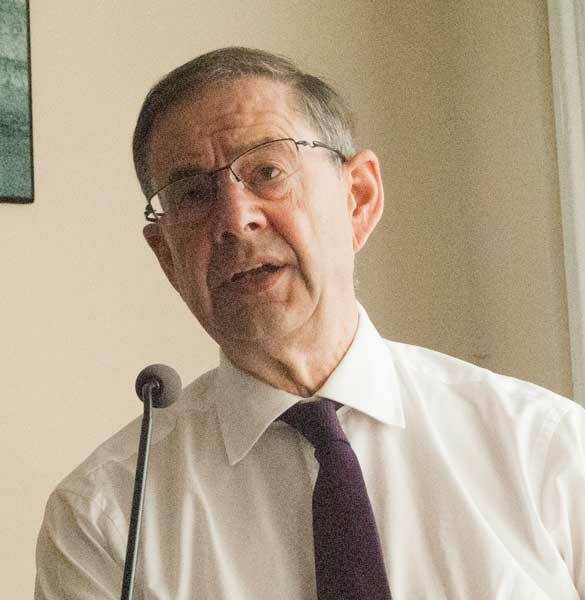 This website is intended to be an online window for our books, but it is hoped it will grow to be more than that. 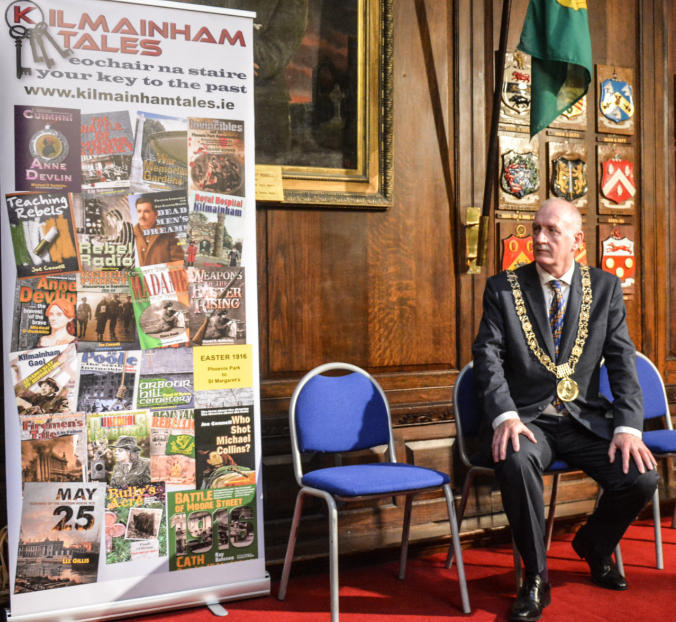 We will carry news items relating to Kilmainham Gaol, the surrounding area and other areas that are of interest to the Gaol and its history. 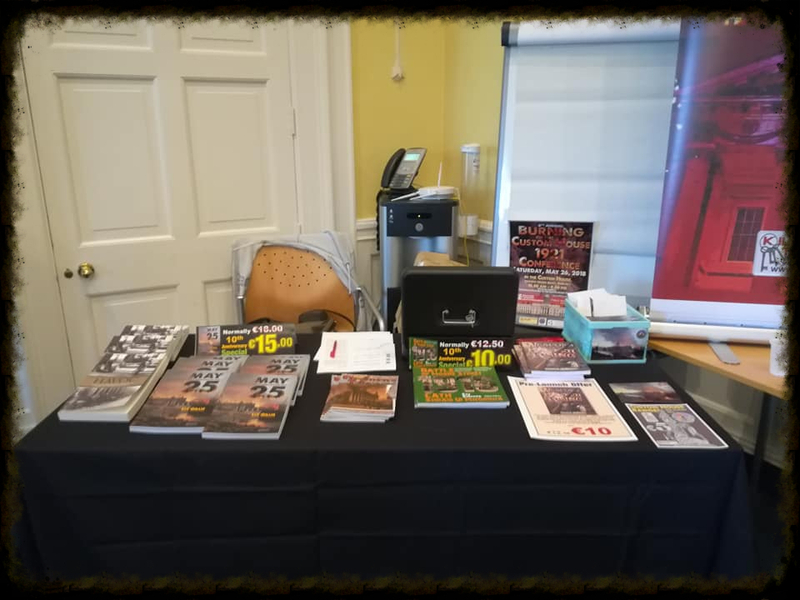 Here, too, you will find information on all our authors and their activities, for instance, as well as reviews of books by other writers and publishers. If our readers have any comments, then we would be delighted to carry a selection of those too. Just e-mail us here. Of course, a site such as this will contain many opinions. 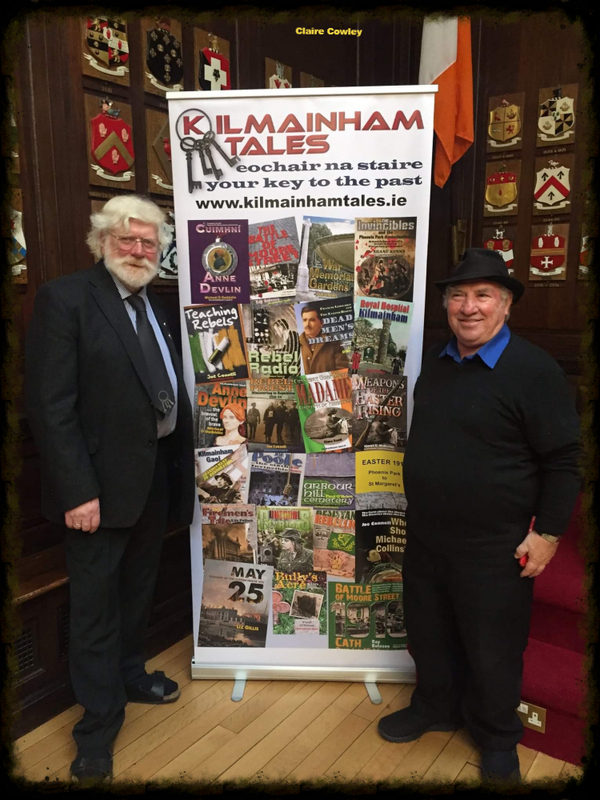 While these are welcome, they must always be understood to be the opinion of the writer, and not necessarily of the site or of Kilmainham Tales Teo. 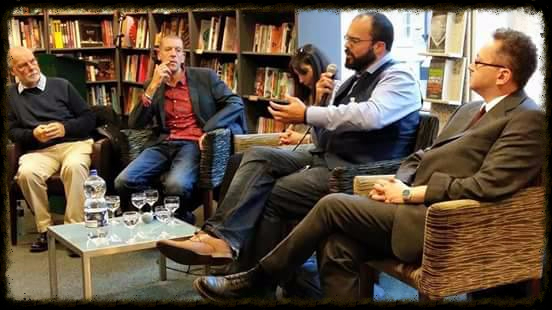 We welcome discussion, and will not stifle it, but if you write it, you are responsible for it! 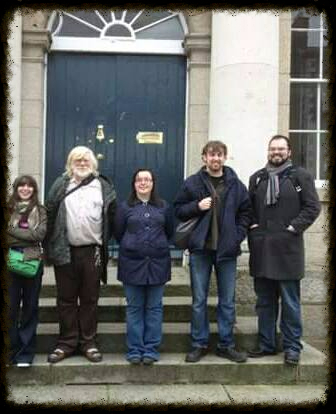 Dóibh siúd le Gaeilge, is oth linn a rá go bhfuil ár gcuid foilseacháin ar fad as Béarla go nuige seo. 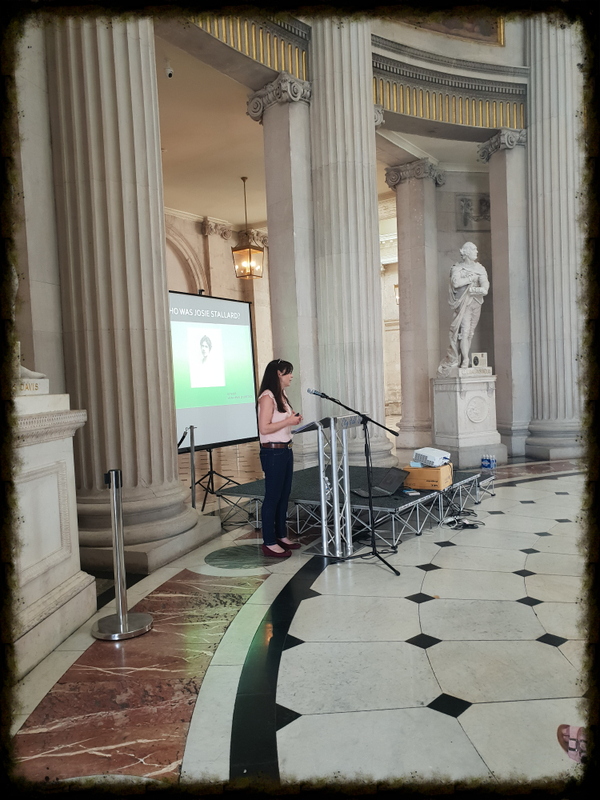 Dá mbéadh éinne ag iarraigh scéal a fheilfeadh do'n tsraith a scríobh as Gaeilge, bhéadh fíor-fáilte dó san in ár oifig, agus gach seans go mbeimíd sásta é a fhoilsiú dá mbéadh sé de'n caighdeán ceart. Mar sin, bígí ag scríobh. 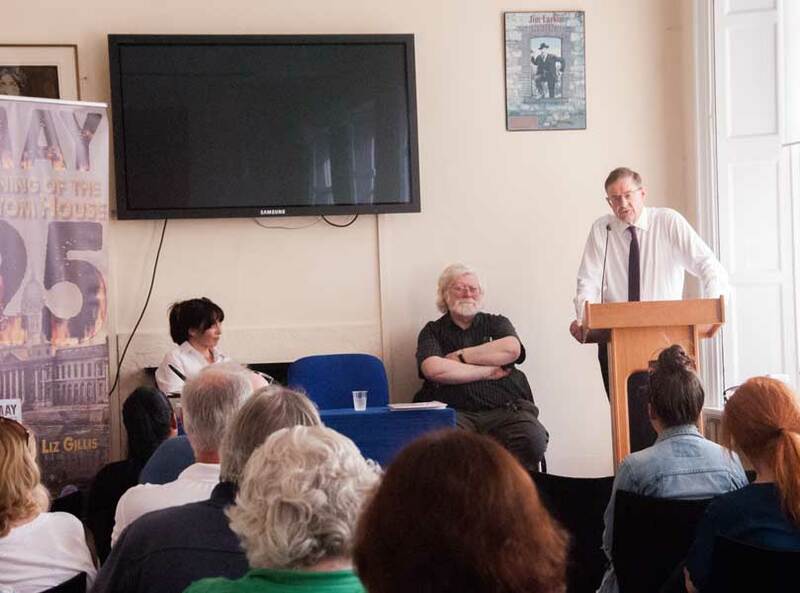 Ar ndóigh, cuirfear fáilte roimh gnáth comh-freagras as Gaeilge freisin. 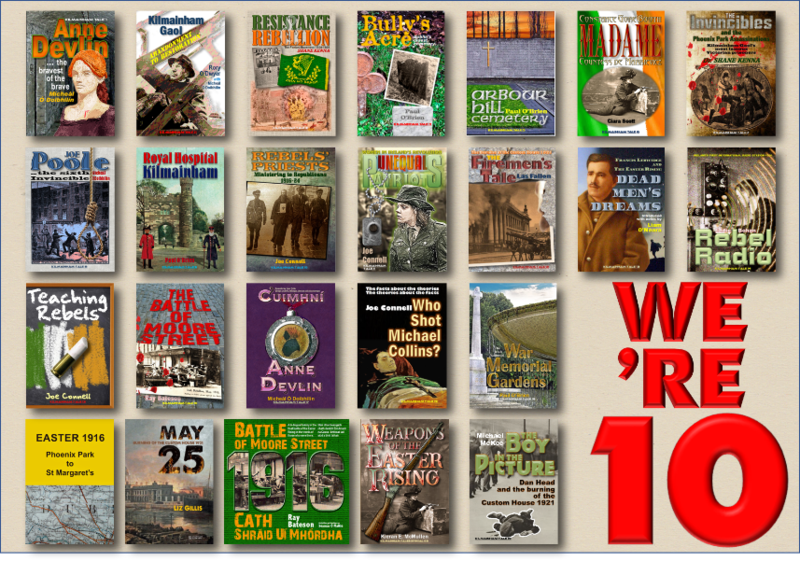 We hope you enjoy our books and the information on this site, and will come back to us again ... and again. Recidivists are welcome here!